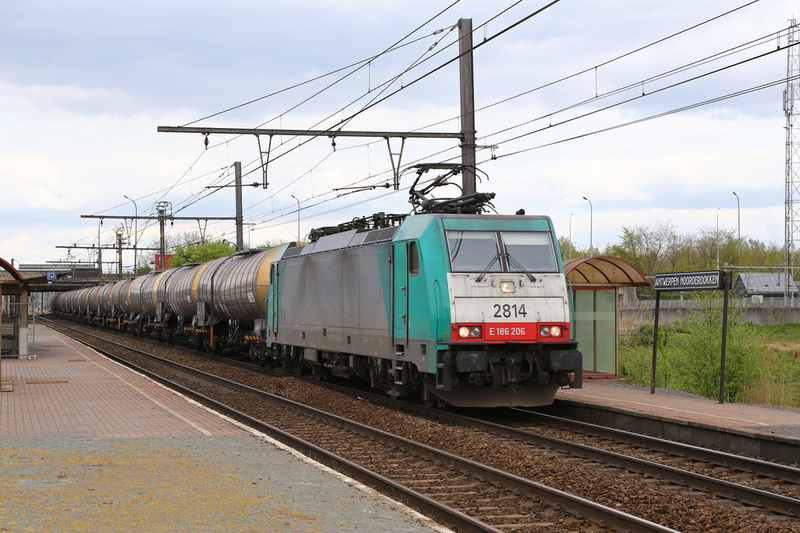 Between the 27th April and 2nd May 2015 I visited The Netherlands for a week, and also visited parts of Belgium on route to and from the Eurotunnel terminal at Calais. 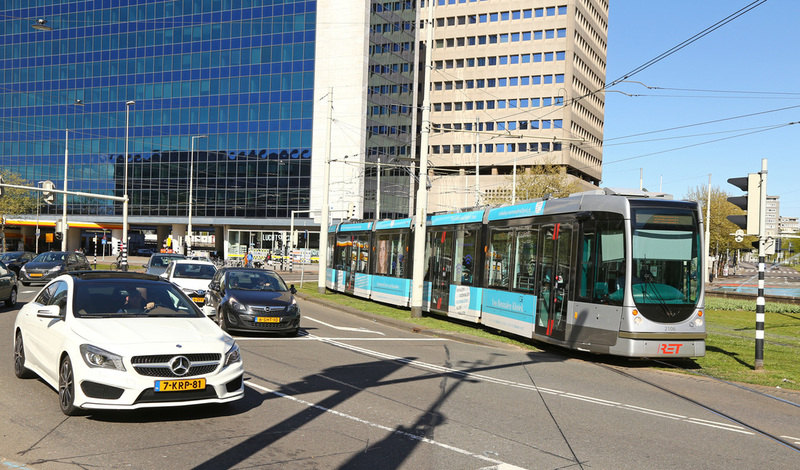 The week in Holland was centred around the Breda - Tilberg - Rotterdam area. 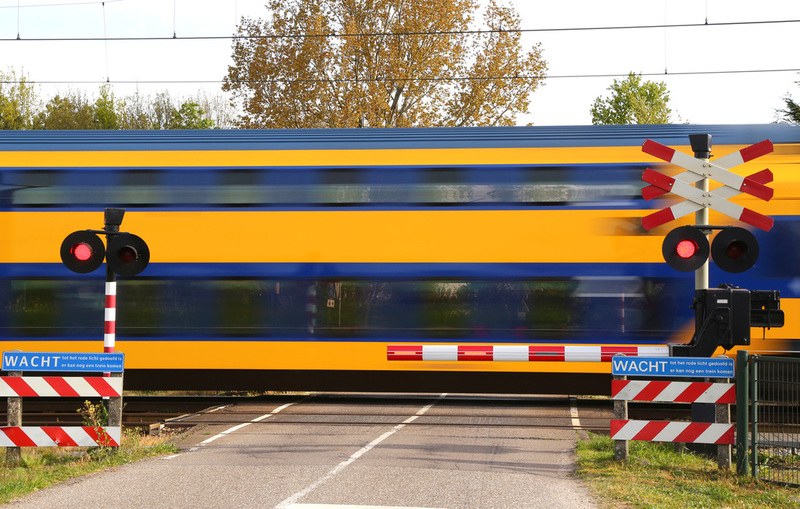 Our visit to The Netherlands coincided with the closure of the Betuweroute (the new double track high speed freight line linking Rotterdam Docks with the Germany). 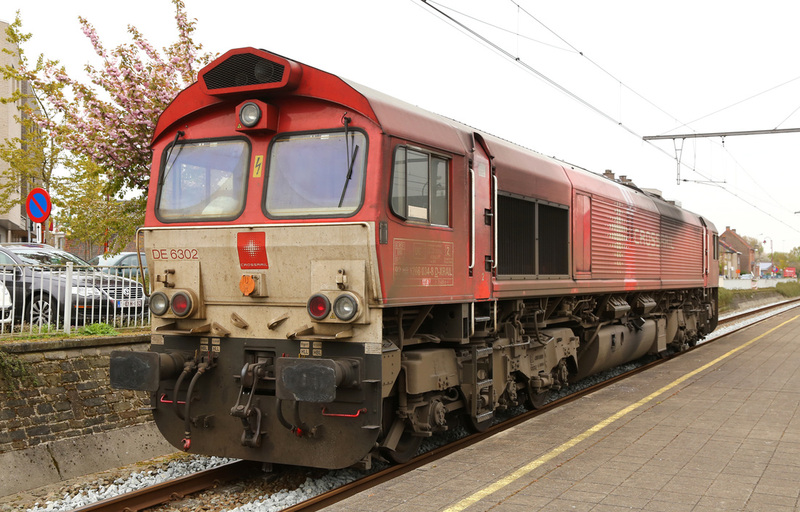 This resulted in rail freight being transferred back onto its former route using the Tilberg/ Eindhoven mainline, making this particular line incredibly busy with rail freight between the normal passenger services. Our trip was not planned coincide with the closure but we were exceptionally lucky with our timing of the trip. 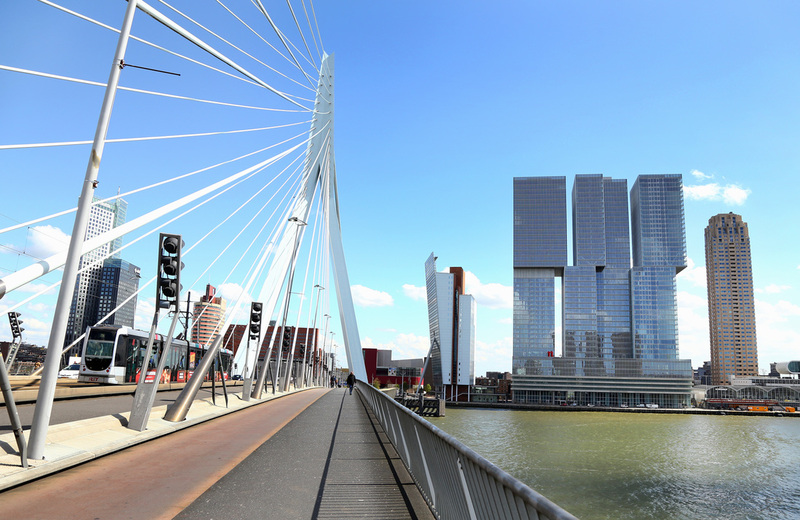 We also visited the fascinating city of Rotterdam, using the high speed rail line between Breda and Rotterdam. 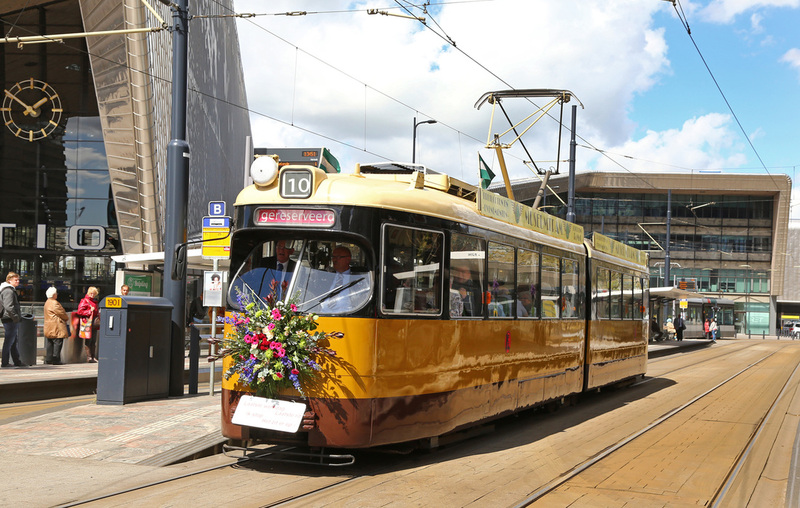 The purpose of the trip was to view the sights of the city and capture the extensive city tram system. 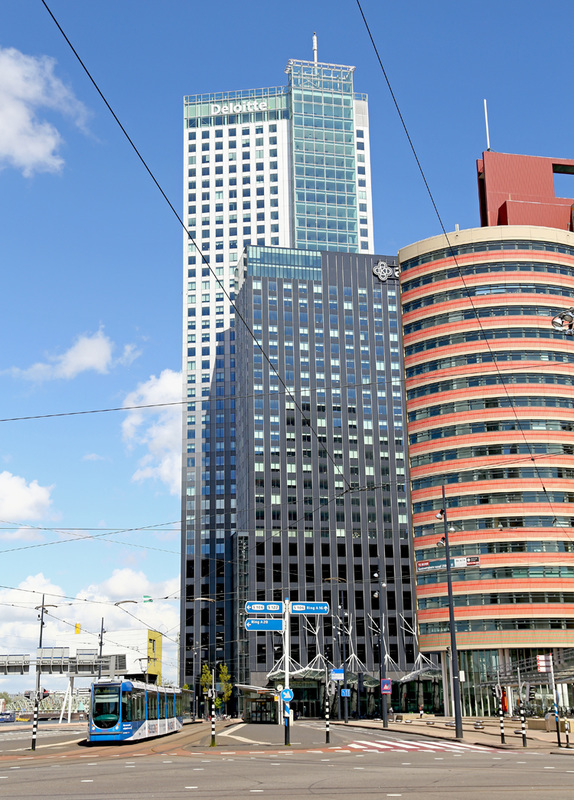 Rotterdam is a city of unique Architecture and provided some stunning backdrops to some of the images we took. The first day of our trip started at 02:30 in the morning for an overnight drive to Eurotunnel at Folkstone. As part of the trip we booked return tickets on Eurotunnel. 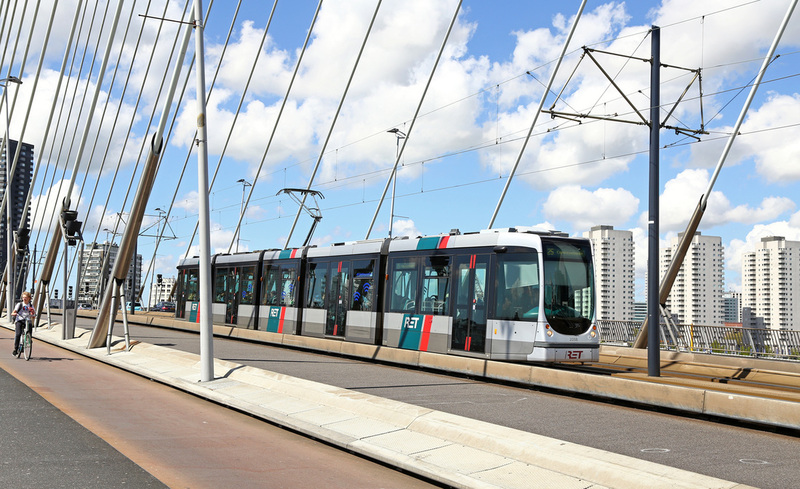 An early arrival at the Eurotunnel Terminal allowed us to book onto an earlier service through the tunnel to Calais. 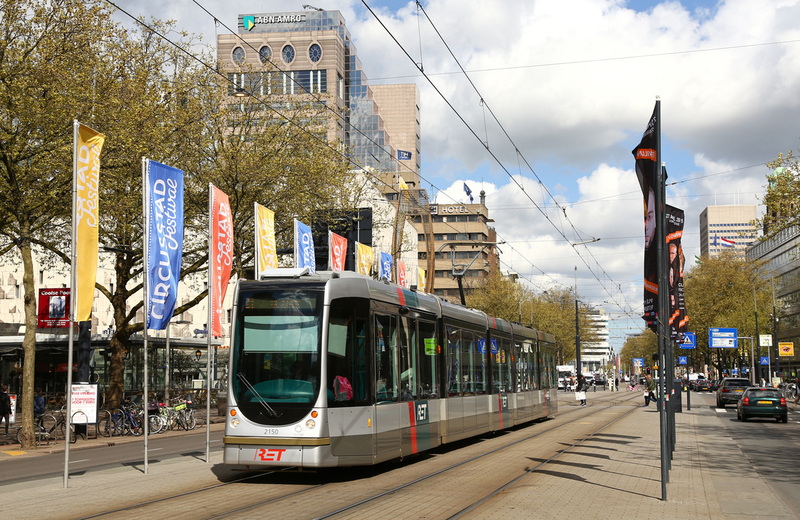 France was merely used as a transit country before calling off in Belgium on route to the Netherlands. 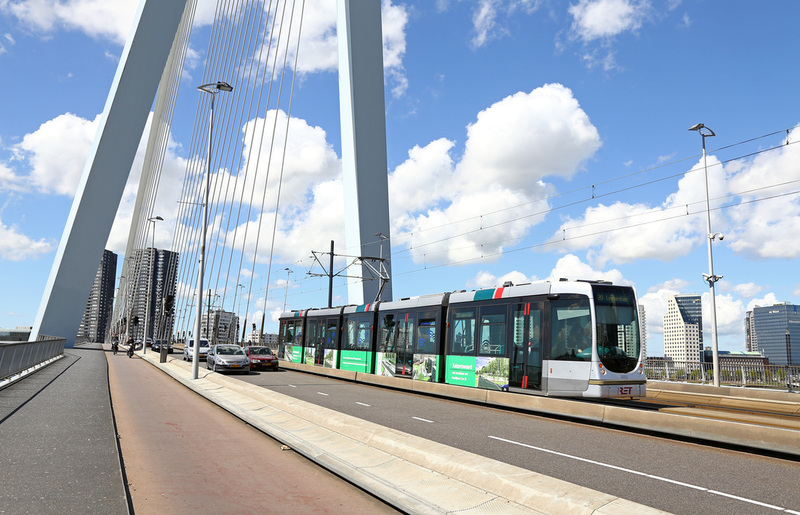 Our first port of call was at De Panne (Adinkerke) where we followed the Belgian Coast Tram which operates along a 68km coastal route between De Panne to Oosende and onto Knokke, located near the Dutch border. 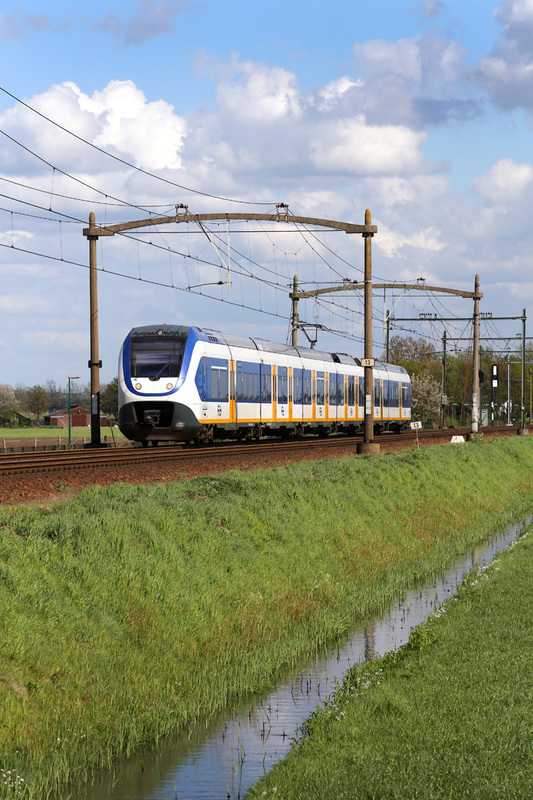 The line is built at meter gauge and runs from 600V overhead electric. 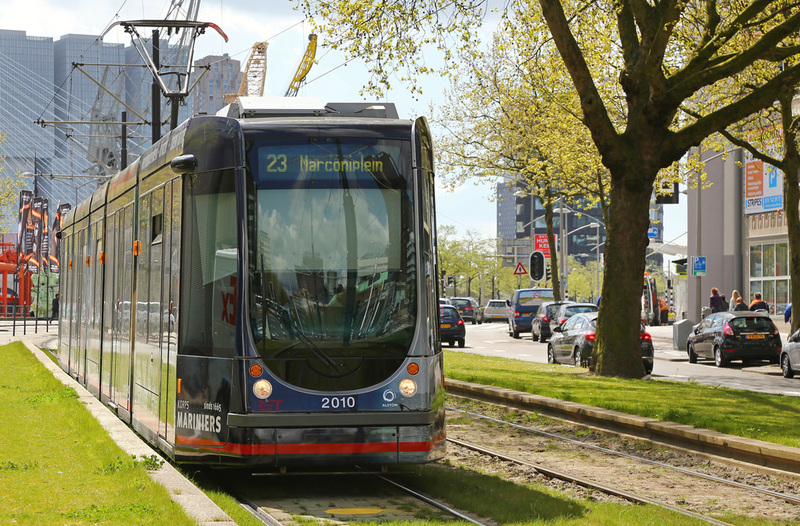 There are 69 stops along the length of the line with tram intervals of between 15-20 minutes in each direction, along with connections to Mainline Belgian Stations at De Panne, Oostende, De Haan, Blackenberg and Knokke. 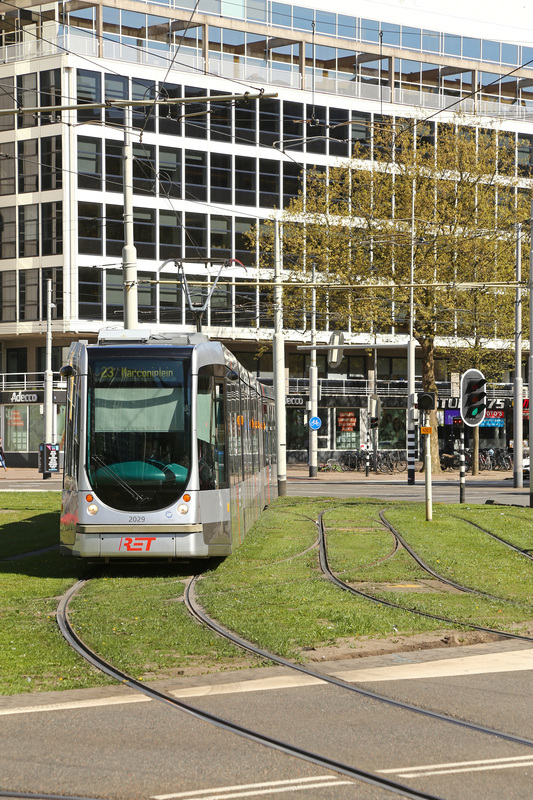 We followed the unique coastal tram line to Oostende before taking time out for lunch and visiting the Mainline NMBS Station (which is currently undergoing a huge refurbishment/ renovation). 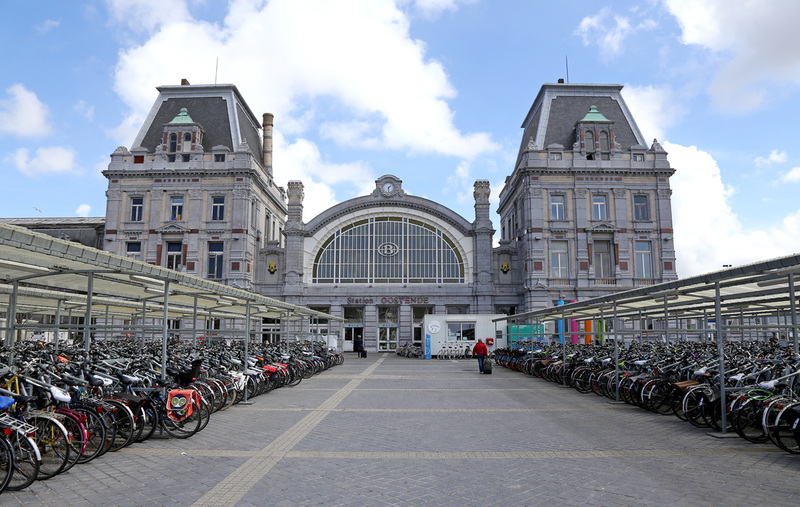 From Oostende we traveled to Antwerpen Noorderdokken station where we spent a short amount of time before continuing the final 25km to our hotel in Breda (The Netherlands). 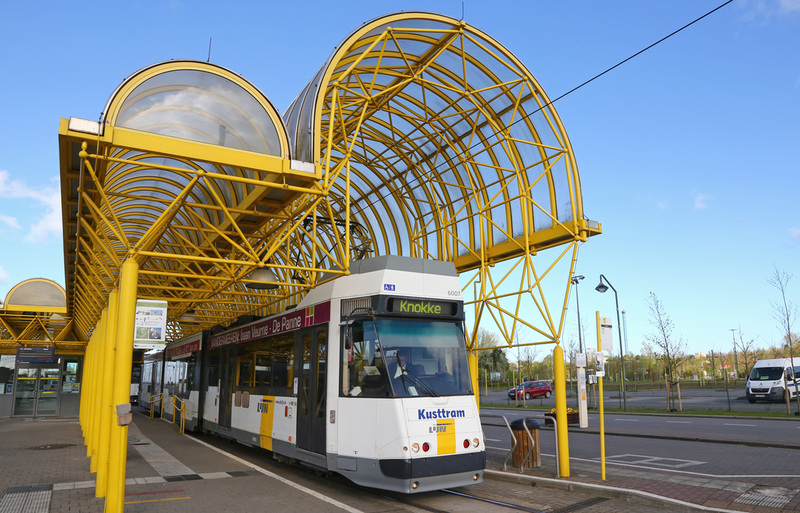 Belgian Railways AM96 No.537 arrives into De Panne Station from the stabling sidings to start a service train to Brussels, passing the integrated transport hub of waiting trams and buses. AM96 No.537 stands next to the impressive station building at De Panne. 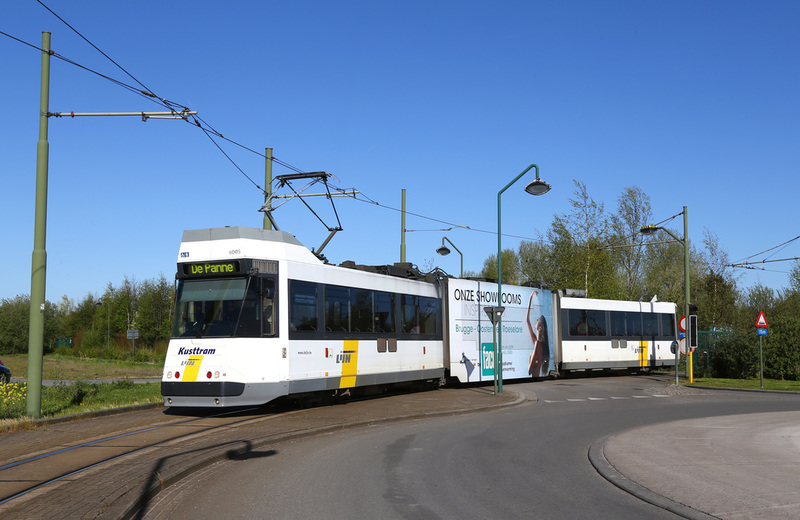 Am8 Kusttram No.6007 stands at De Panne station / interchange ready to depart for Knokke. 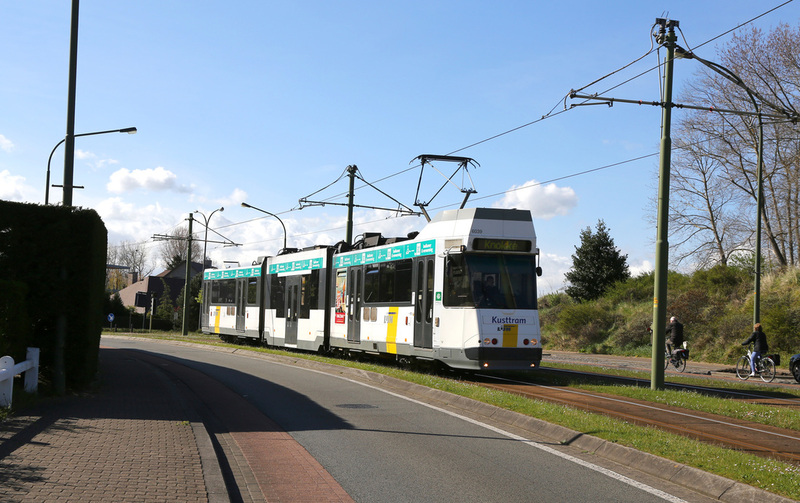 AM8 Kusttram No.6005 arrives from Knokke entering the balloon track into De Panne Station. 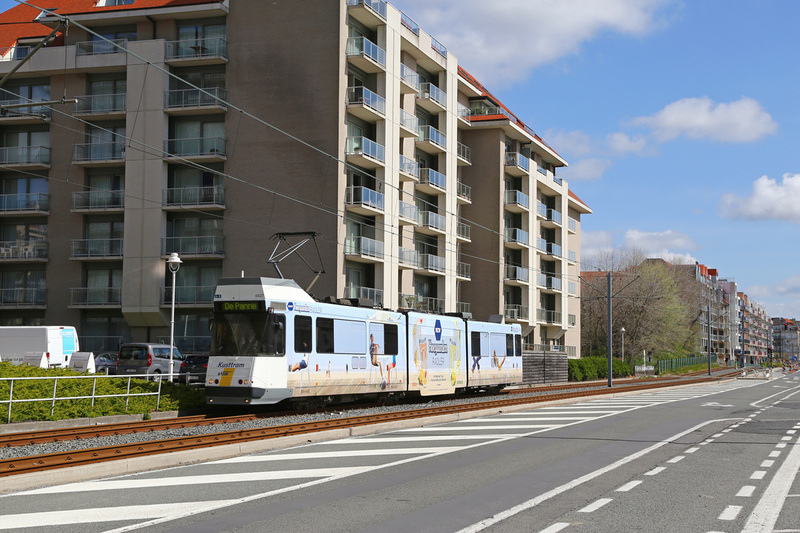 AM8 Kusttram No.6039 approaches De Panne Esplanade heading for Knokke. 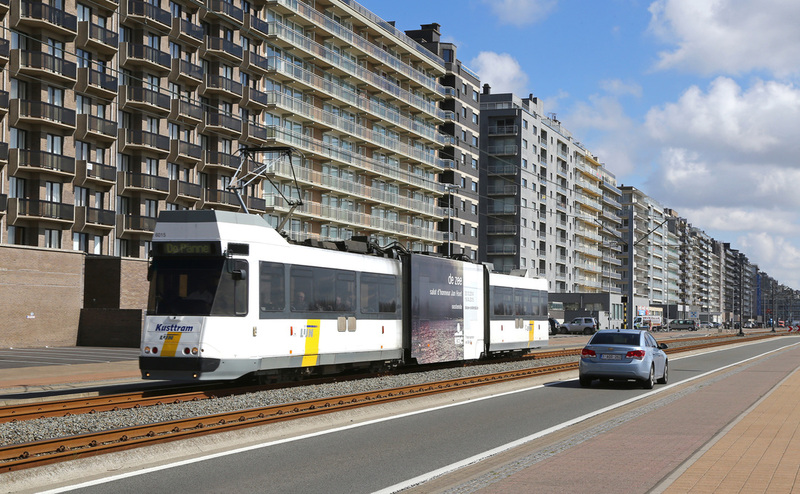 AM8 Kusttram No.6019 heads to De Panne passing De Panne Esplanade from Knokke. 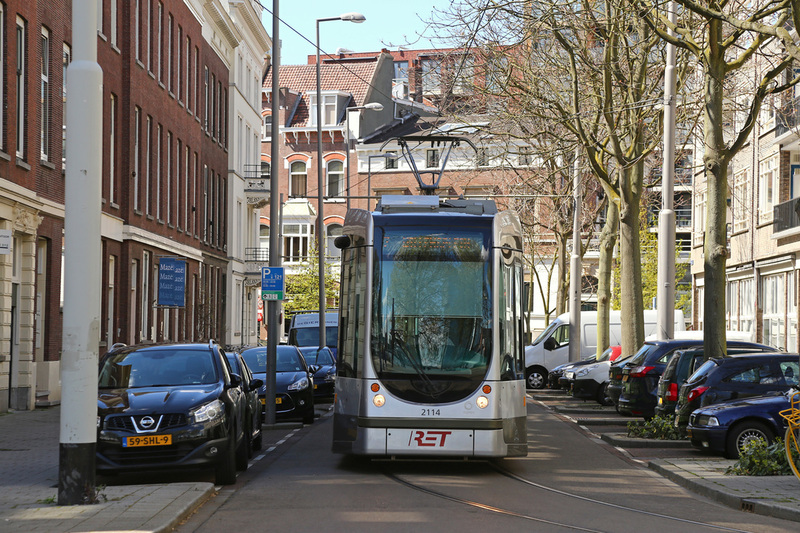 Am8 No.6005 passes through the streets of the De Panne Esplanande on route to Knokke. 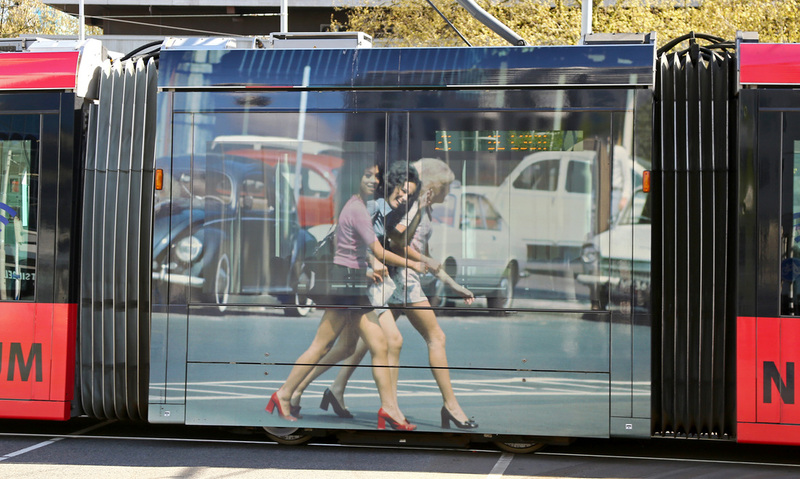 Many of the trams on the Kusttram (Coast Tram) route carry advertising. 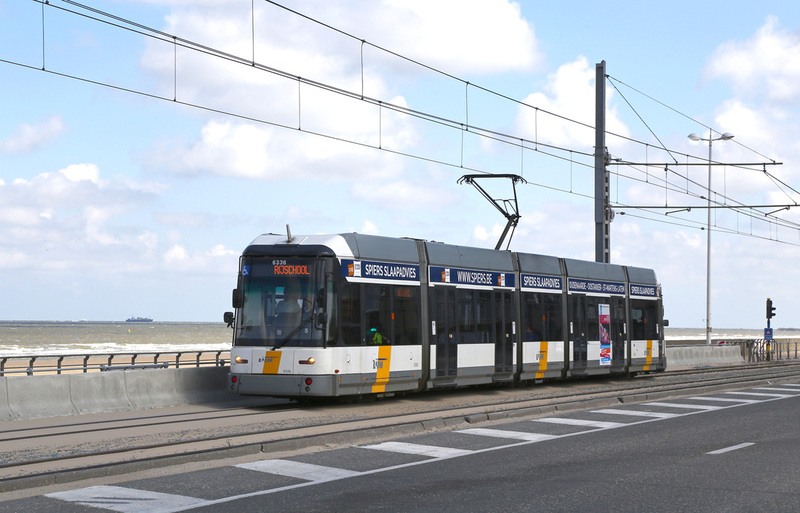 No.6025 passes De Panne Esplanande with advertising for Lay's Crisps on the side. 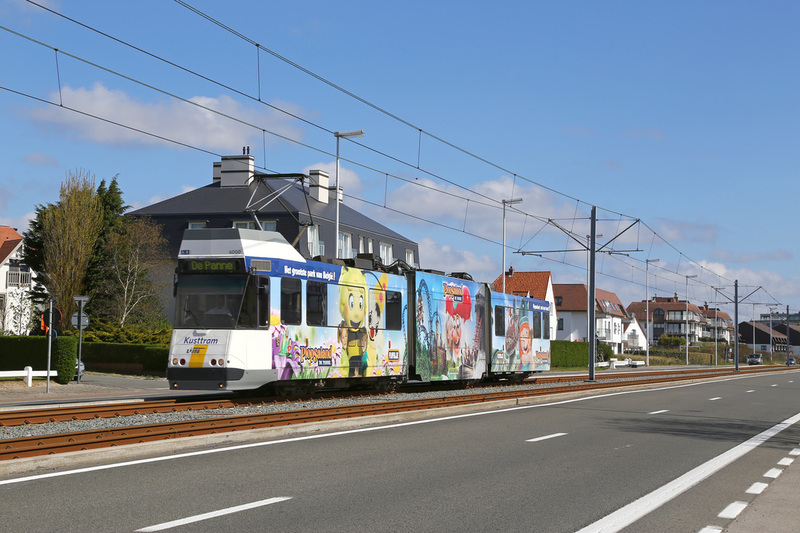 AM8 Tram No.6000 carries advertising livery for Plopsaland (A Theme Park at De Panne), and is pictured passing Oosduinkerke Bad. 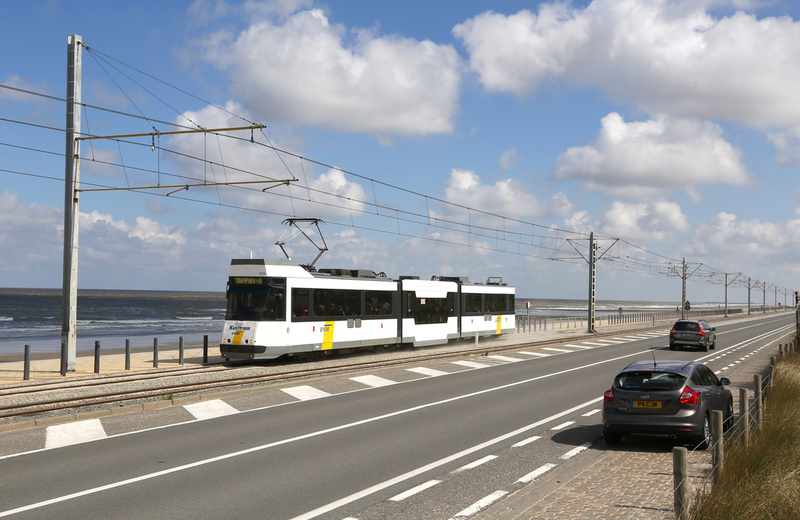 AM8 Tram No.6027 heads for De Panne from Knokke at Nieupoort Bad. 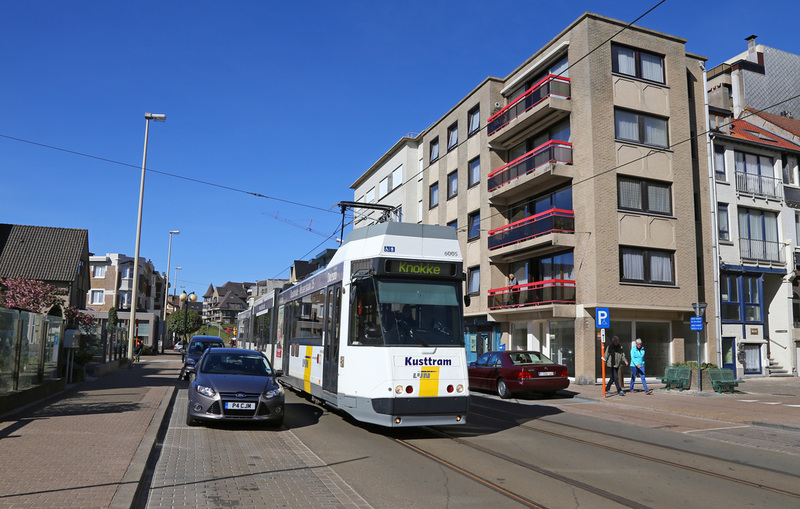 AM8 Kusttram No.6015 passes the high rise apartments at Middlekerke on route to De Panne. 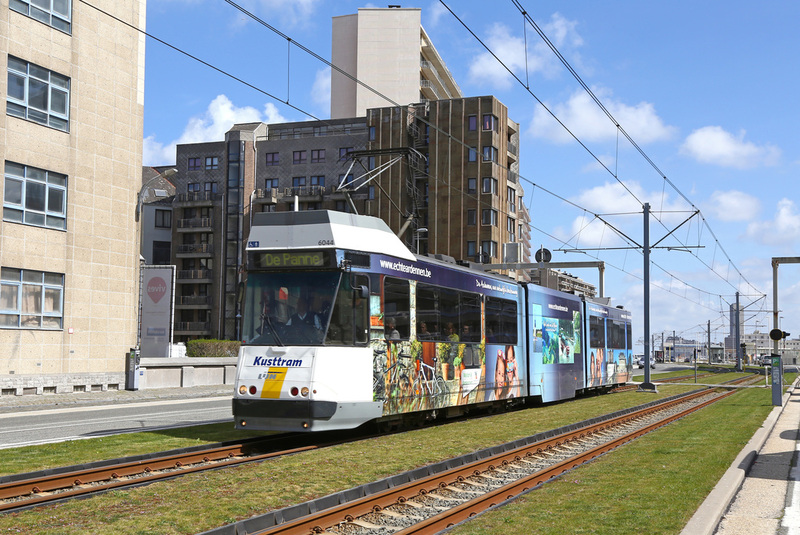 AM8 Tram No.6026 skirts the North Sea coastline at Oostende Raversijde heading for De Panne. 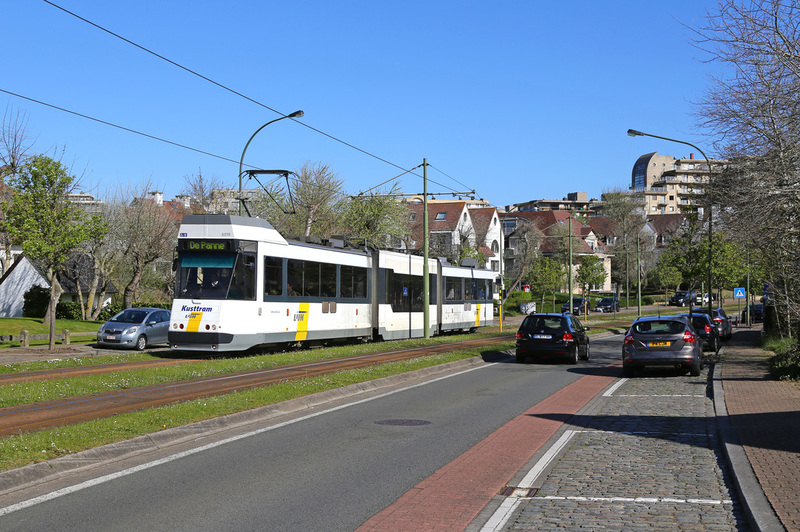 Am8 Tram No.6044 arrives into Oostende Renbann heading for De Panne from Knokke. 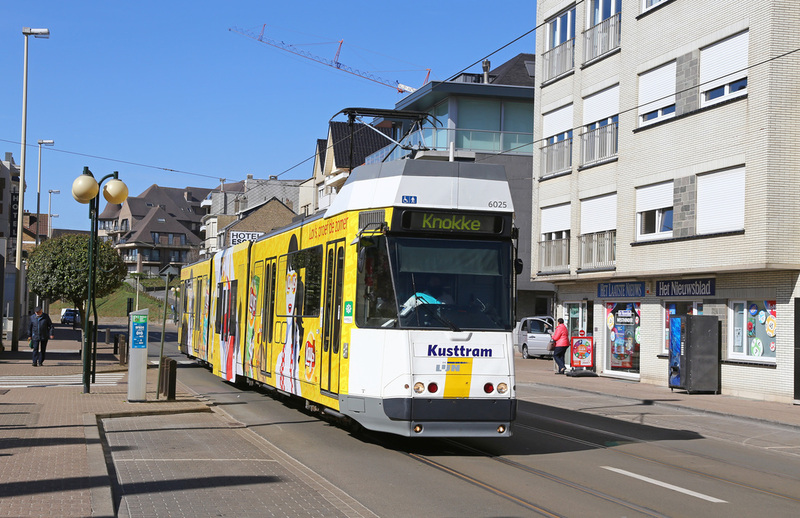 New multi section Kusttram No.6336 is pictured at Oostende Raversijde on driver training. 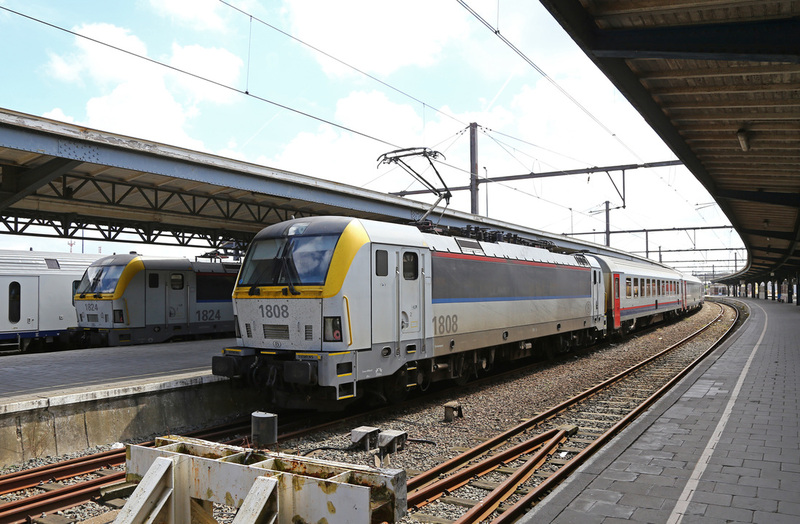 Siemens Class 18 Electric Locomotives No.1808 & No.1824 are pictured at Oostende ready to depart with services to Brussels. 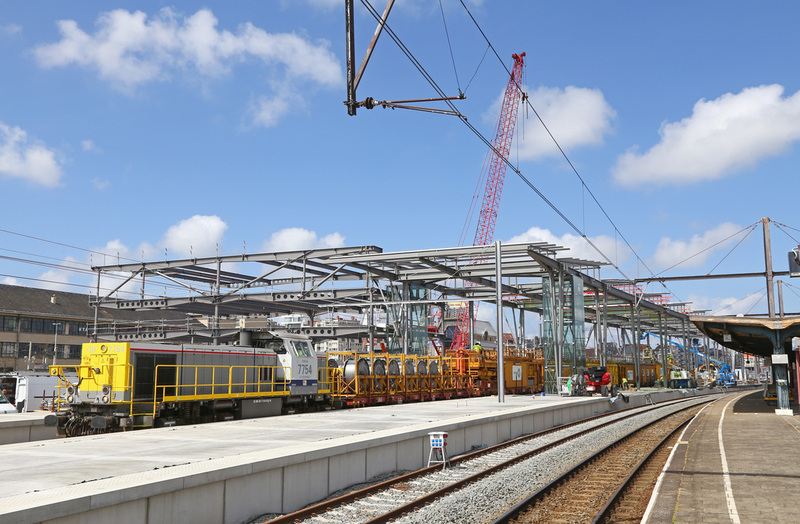 Two Belgian Railways Class 77 Locomotives No.7754 & No.7743 are pictured at Oostende Station with an electrification train working on the new station redevelopment. Under the shadow of the Oostende Cathedral Class 77 No.7743 'Iris' stands within the new station canopy structure at Oostende. 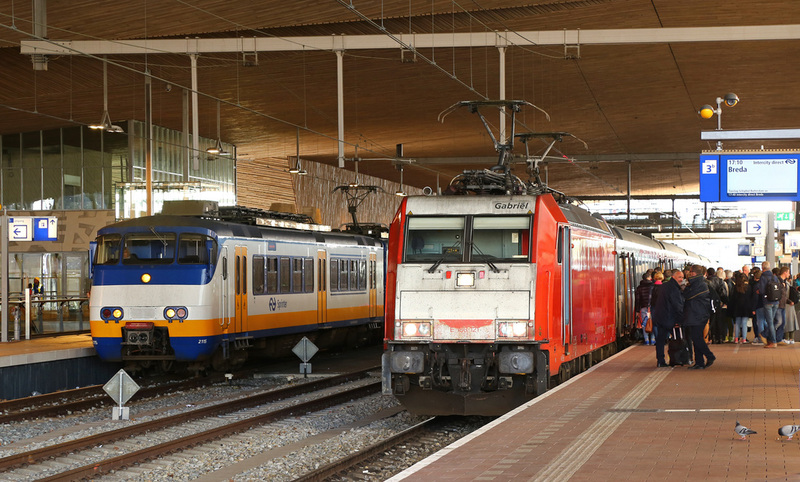 Belgian Railways Class 186 No.186204 passes through Antwerpen Noorderdokken Station. 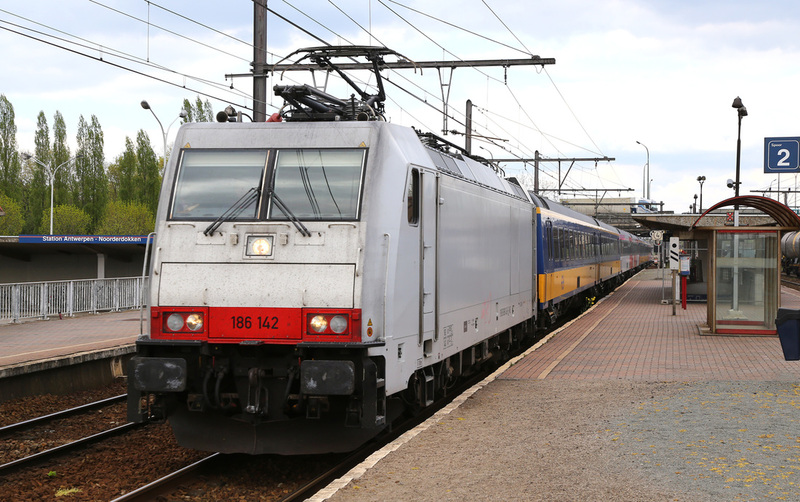 Belgian Railways Class 186 No. 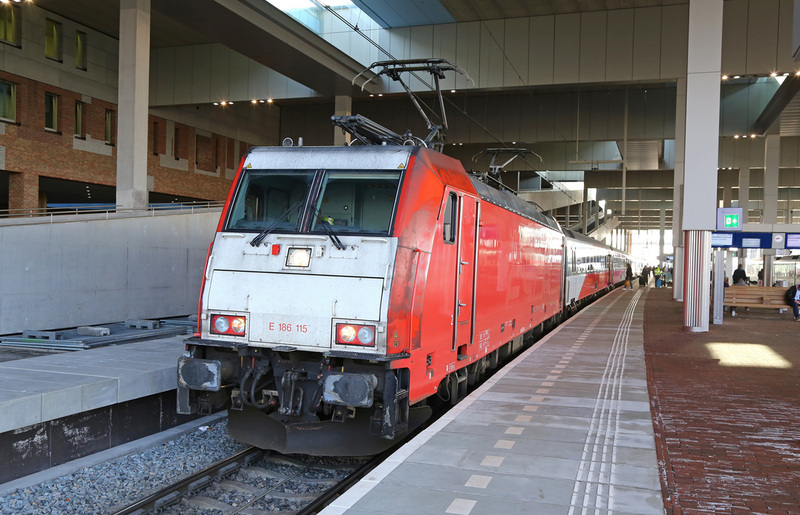 186210 passes through Antwerpen Noorderdokken Station with an intermodal from Antwerpen Docks. 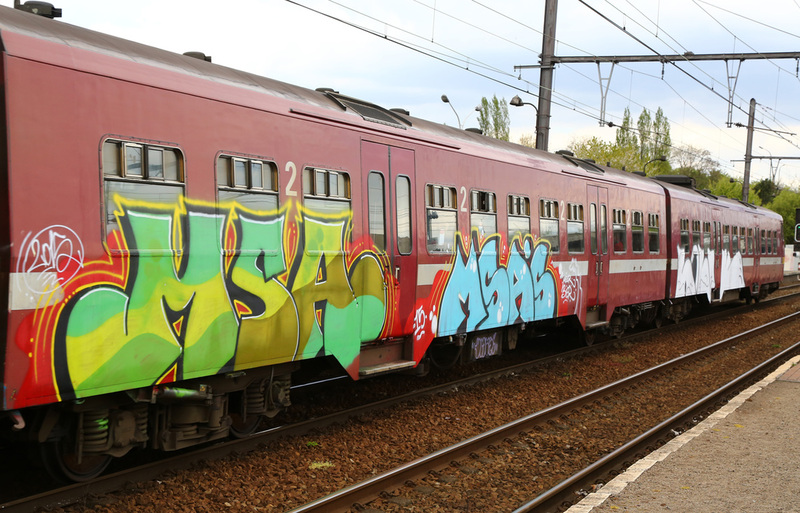 Belgian Railways AM75 units are all showing their age with huge amounts of graffiti on every train we saw. 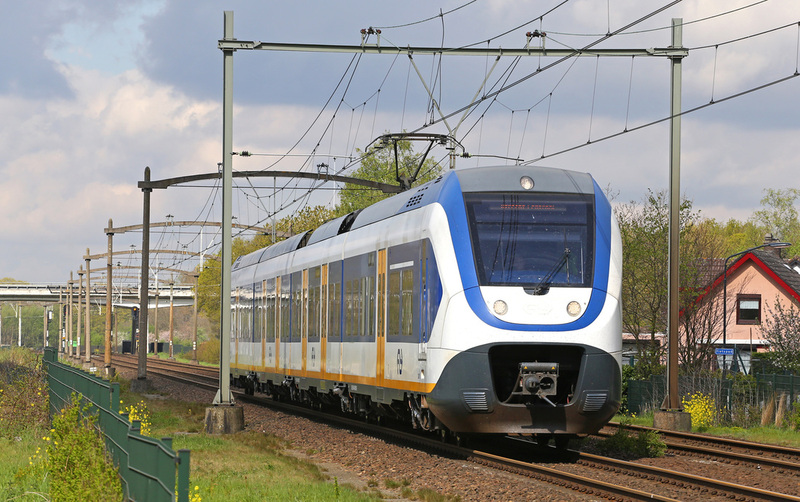 A selection of units and services operating between Roosendaal (Holland) and Antwerpen are featured in the images above. 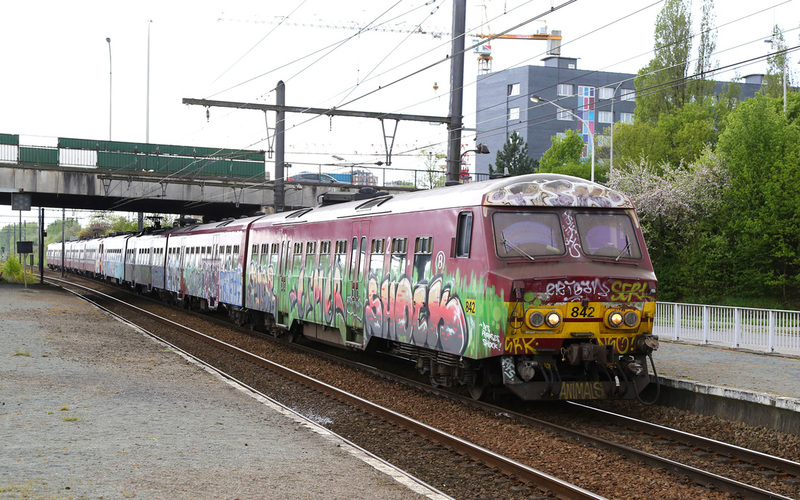 Their replacement by new build Siemens Class 08 EMU's is immanent and very much needed, no matter how bright and vibrant the Belgian street art scene is, no railway operator should be operating units like this in such poor external condition. 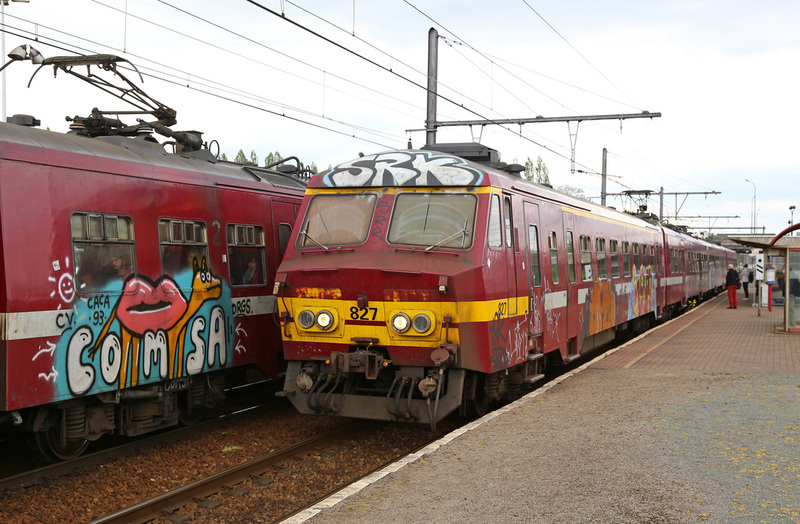 Belgian Railways Class 13's No.1317 & No.1342 power through Antwerpen Noorderdokken heading south. 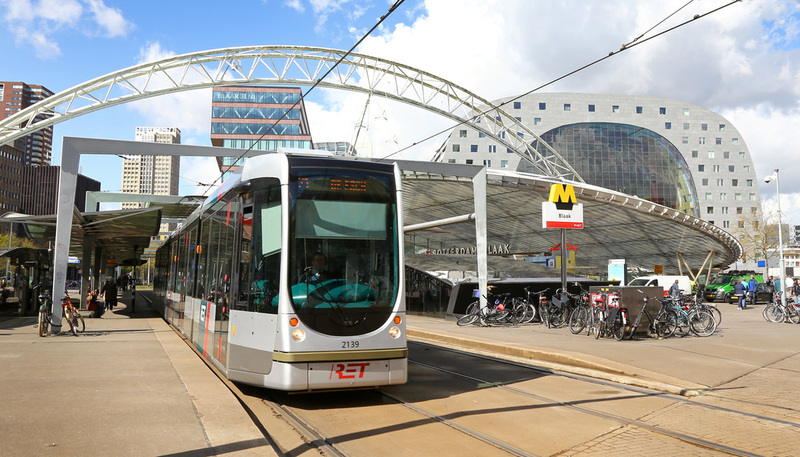 Belgian Railways Class 186 No.186224 passes through Antwerpen Nooderdokken Station with one of the frequent Brussels to Amsterdam services. 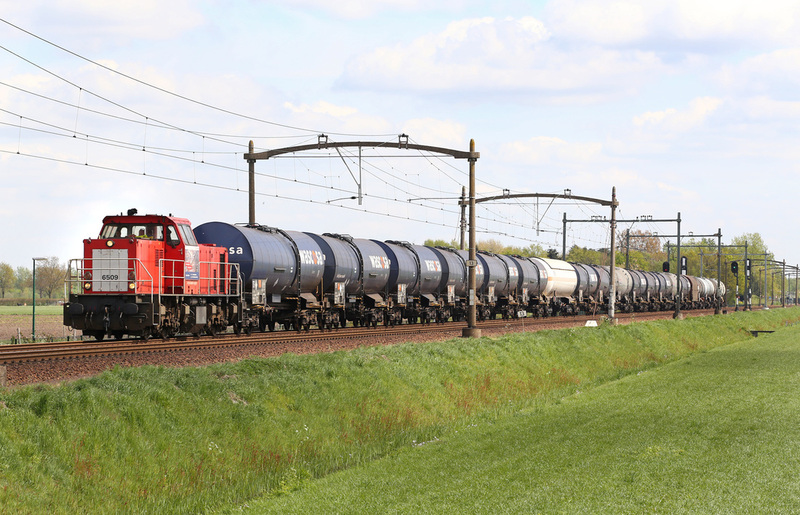 Belgian Railways Class 77 No.7707 passes through Antwerpen Noorderdokken with a short mixed train of chemical wagons in tow. 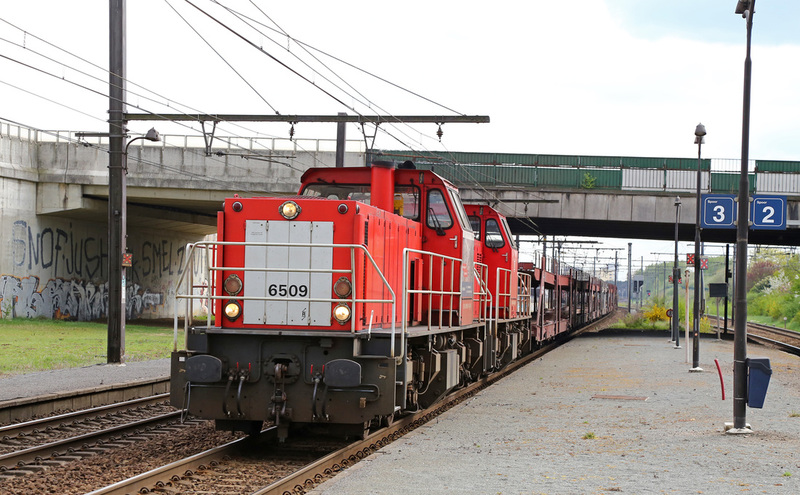 Railion DB Class 6500's No.6509 and No.6511 pass through Antwerpen Noorderdokken Station with an empty train of car transporter wagons returning to The Netherlands. 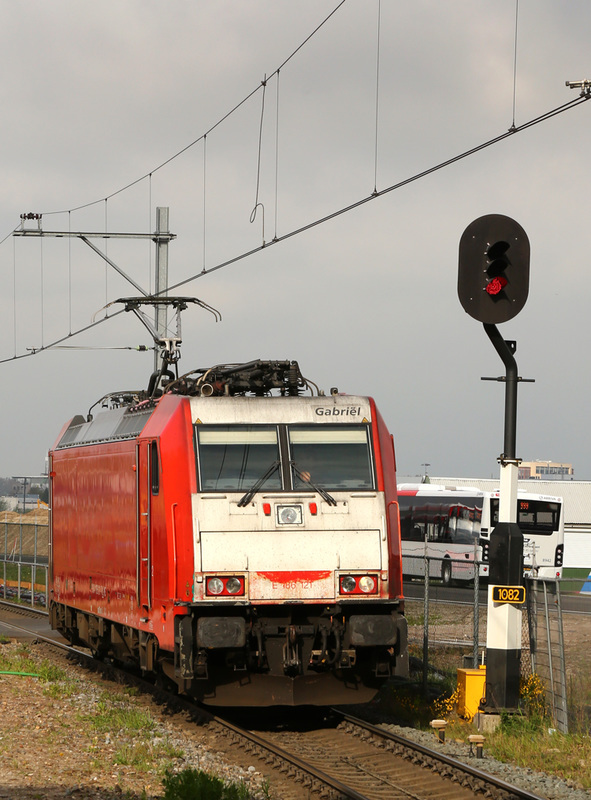 The driver of a southbound Amsterdam to Brussels service gives a friendly wave from the cab of No.186125 passing through Antwerpen Noorderdokken Station. 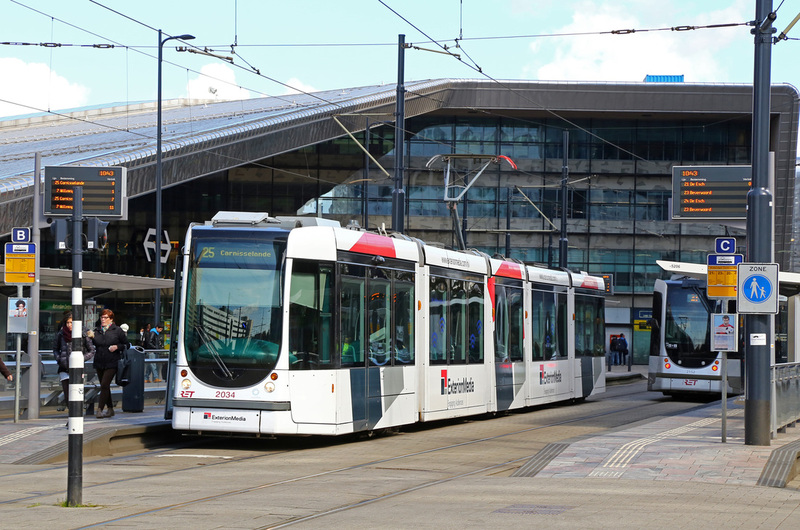 A Belgian Railways Driving Trailer approaches Antwerpen Noorderdokken Station with a peak hour service . 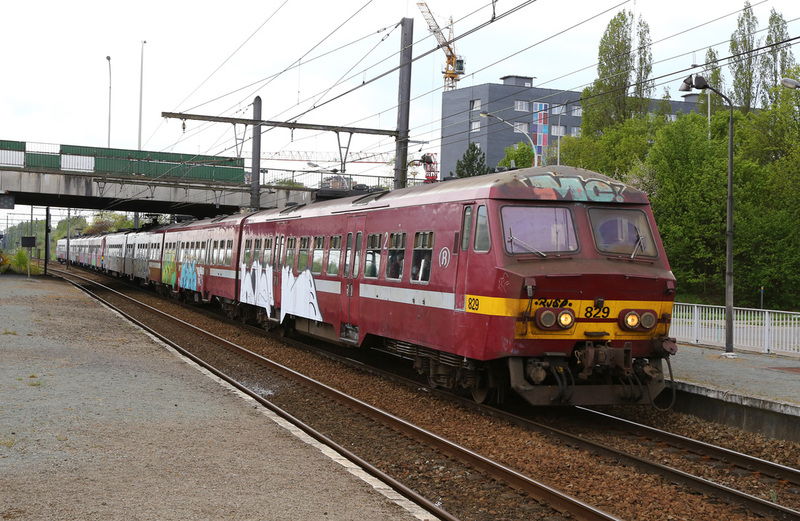 Belgian Railways Class 21 No.2146 pushes its service train north through Antwerpen Noorderdokken Station. 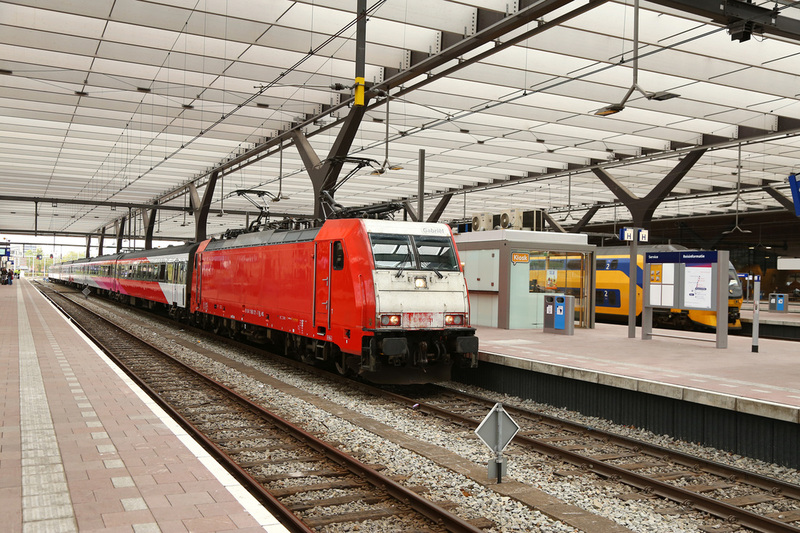 Class 186 No.186240 passes through Antwerpen Nooderdokken Station heading for Amsterdam. 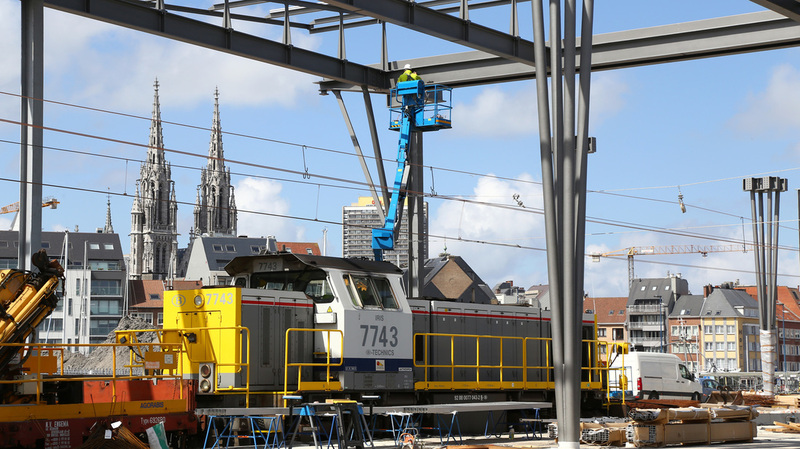 Vossloh Euro 4000 No.4004 operated by Europorte (the same group who owns GBRf in the UK) passes through Antwerpen Noorderdokken Station having used the Noorderdokken Yard balloon track to turn change direction. It's thought this service was possibly the Payron-Rupel Boom to Moeskroen (France). 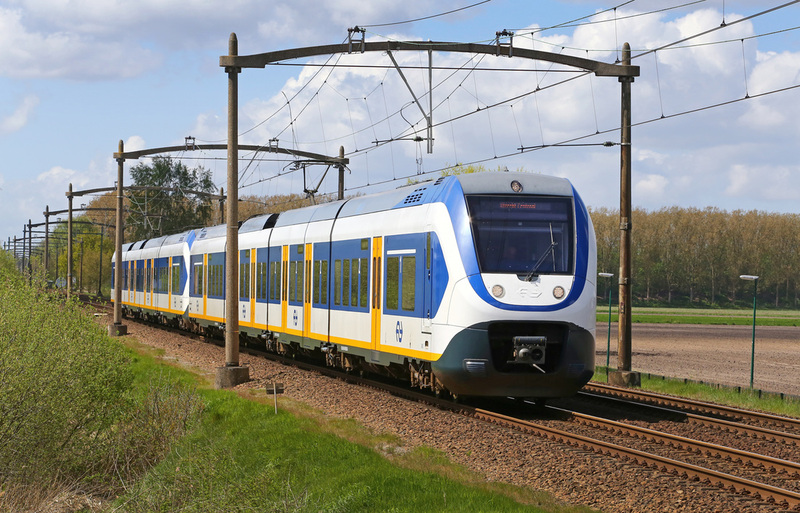 For the second day of our European Trip we planned to follow the mainline from Breda towards Tilberg ending up at a location we'd visited before at Gilze Rijen adjacent to the Netherlands Airforce Base. The day started cold with thick cloud, but finally broke during the late afternoon to provide per-longed periods of sunshine. 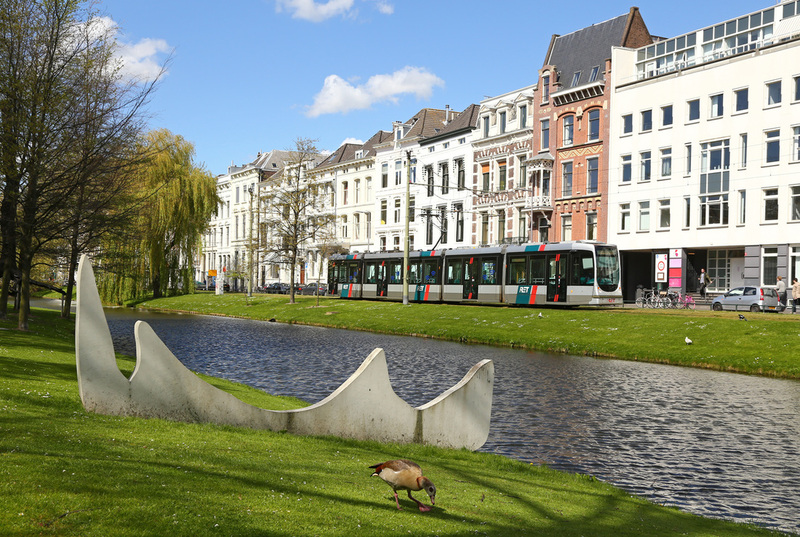 Our first location was the small village of Breda Prinsenbeek, located on the triangle linking Breda with the mainline to Rotterdam, later in the morning we moved to Baarschotsestraat near Dorst as localised showers passed through the area. After lunch we then headed to Gilze Rijen for the afternoon. 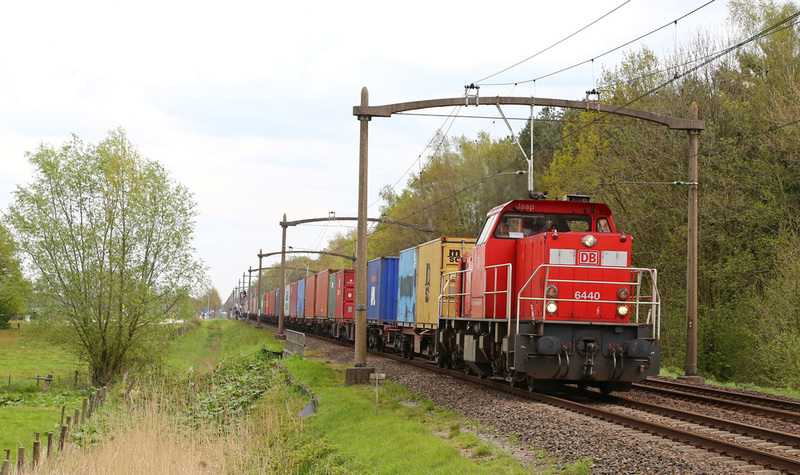 DB Class 6500 No.6439 rounds the curve at Breda Prinsenbeek with a freightliner from Rotterdam Docks heading west towards Venlo. 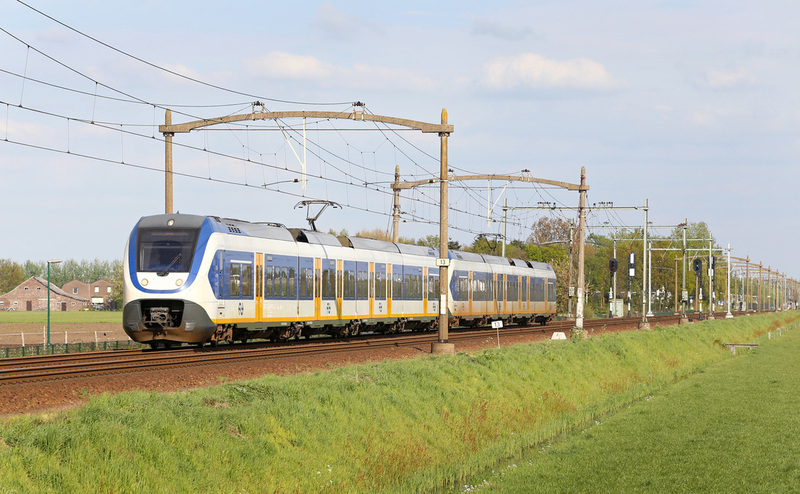 NS Class 186 No.186119 heads towards Breda working the 07:25 Amsterdam - Breda high speed service. 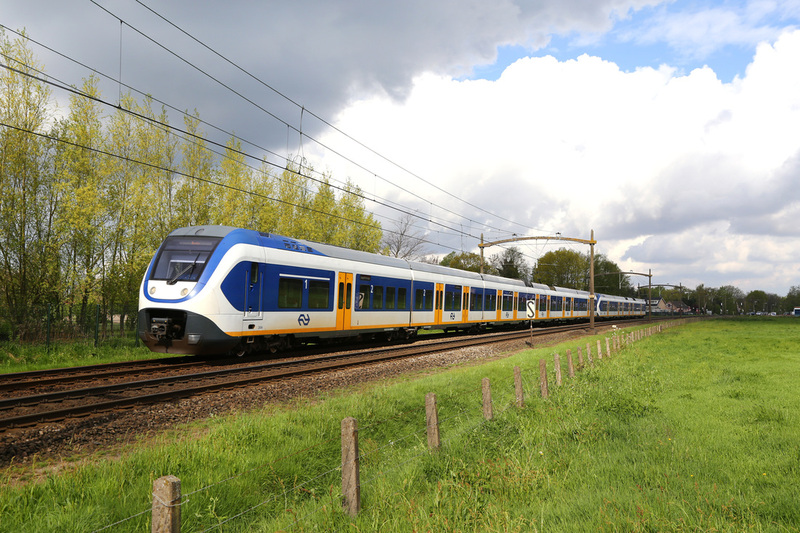 NS Class 186 NO.186117 speeds away from Breda with Train 913, the 08:25 Breda - Amsterdam high speed service passing Breda Prinsenbeek. 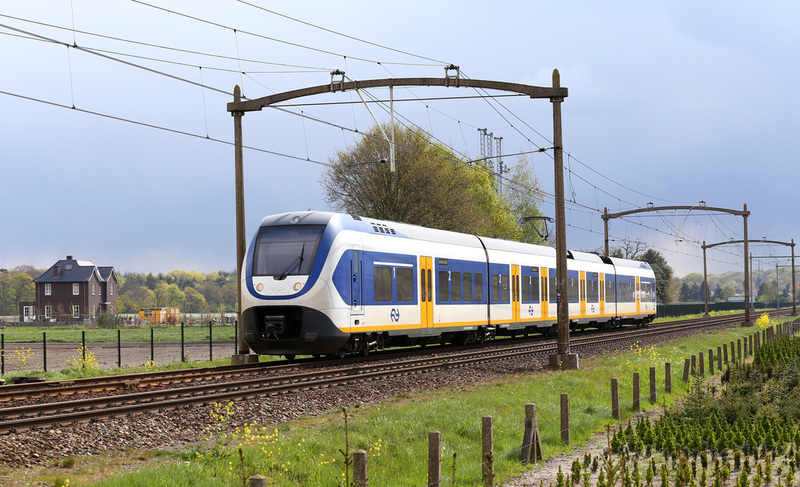 NS S100 Sprinter No.2612 passes Breda Prinsenbeek with the 07:52 from Ben Haag to Venlo. 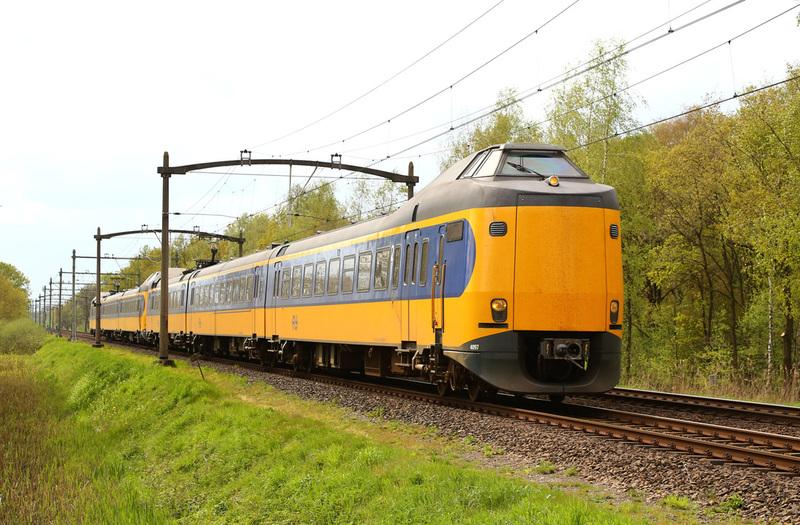 A pair of Plan Z1 & Z2 'Koploper' EMU's No.4223 and No.4062 pass Breda Prinsenbeek. 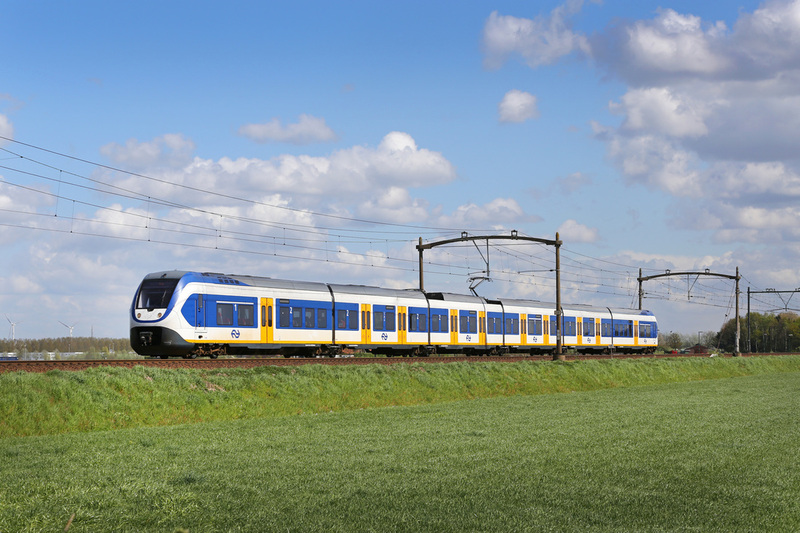 NS Class 186 No.186115 rounds the curve at Breda Prinsenbeek with the 07:55 from Amsterdam to Breda. 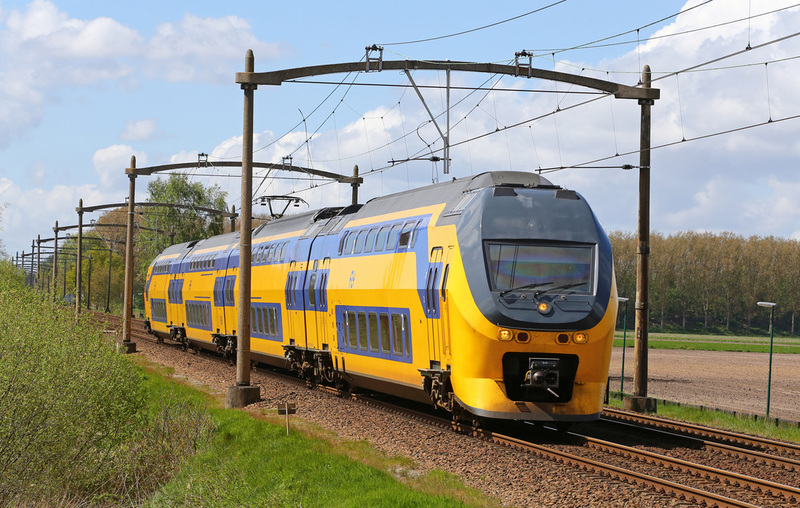 A pair of NS S70 Sprinters No.2442 and No.2458 pass Breda Prinsenbeek heading north passing a pair of Koploper units heading for Venlo. 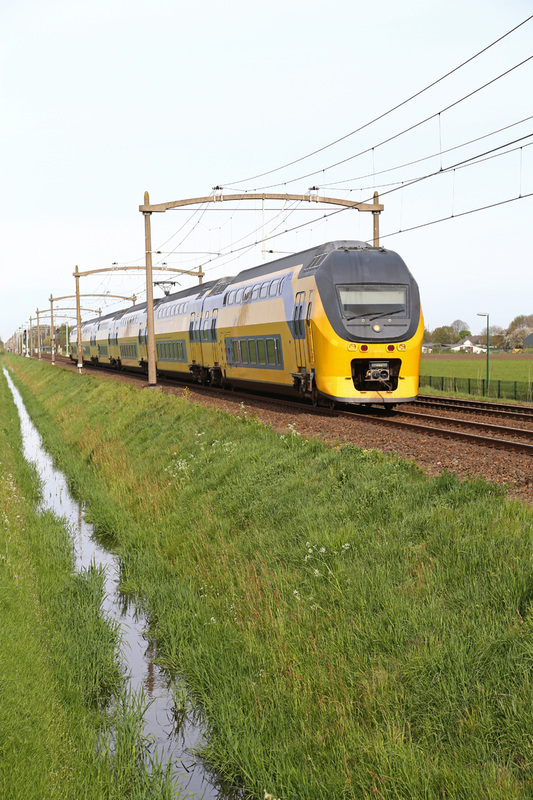 NS Class 186 No.186013 nears journeys end hauling the 08:25 Amsterdam - Breda high speed service. 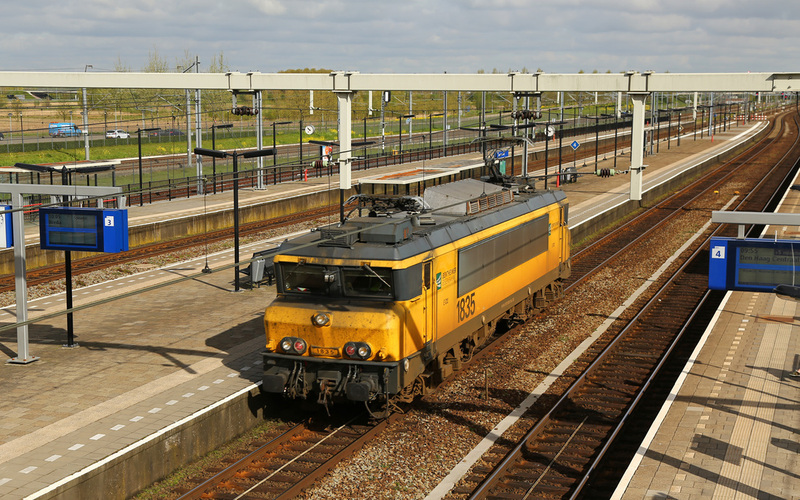 NS Class 186 No.186009 passes an empty coal train a t Breda Prinsenbeek operating the 08:55 Amsterdam - Breda service. 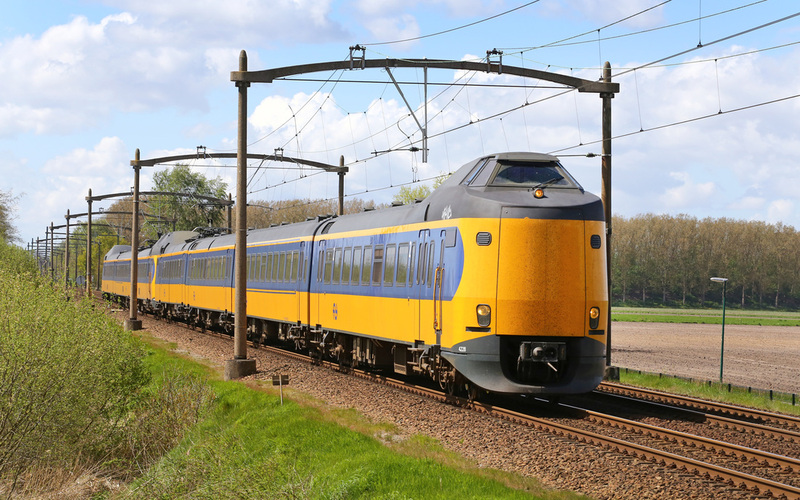 NS S100 Sprinters No.2606 and No.2635 pass Breda Prinsenbeek on route to Venlo. 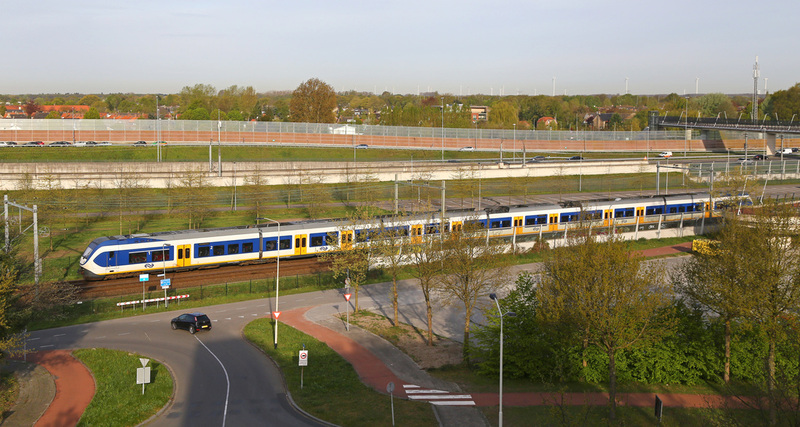 Class 1600 No.1615 is now operated by DB, the loco is seen passing Baarschotsestraat near Dorst with a train of empty cartics returning to Germany. 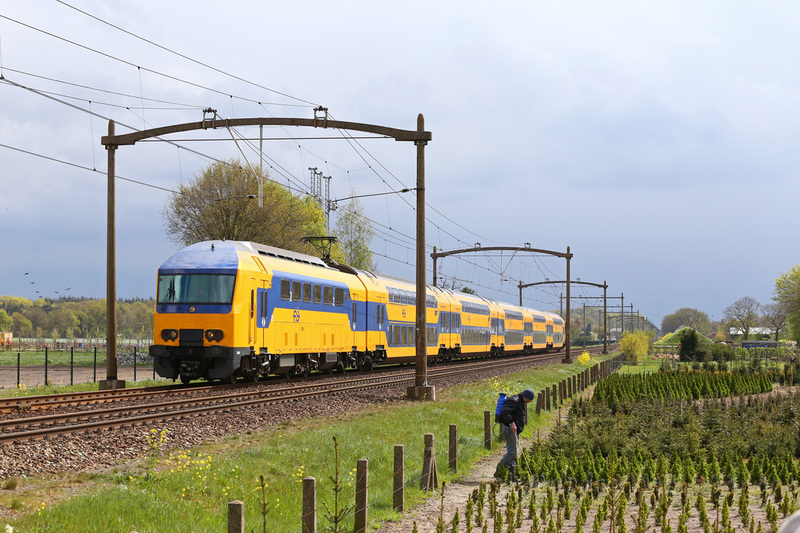 NS S70 Sprinter No.2401 heads away from Breda near Dorst. 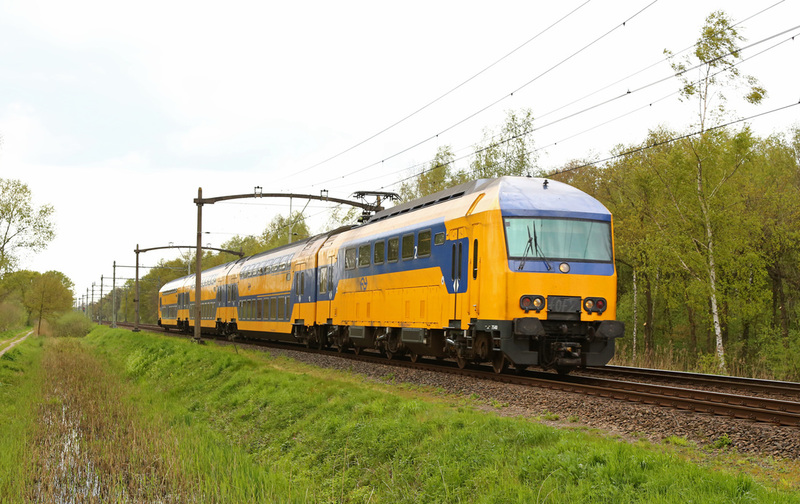 NS S70 Sprinter No.2447 passes Dorst heading towards Breda. 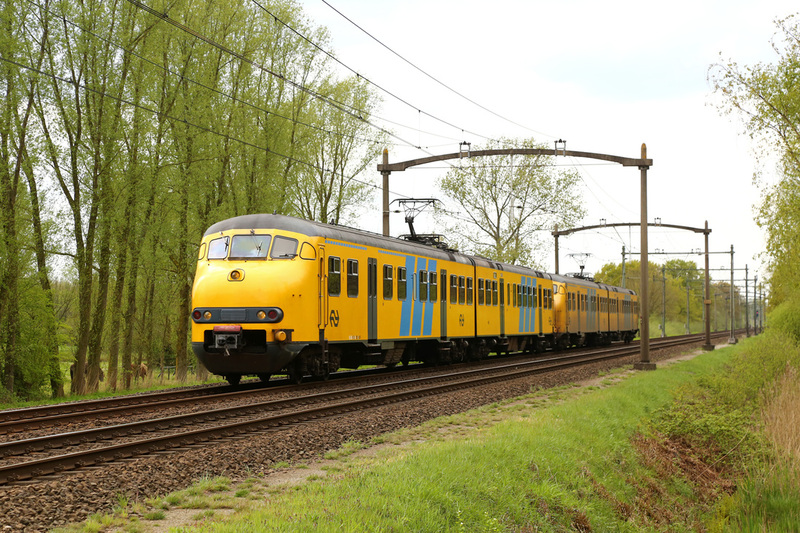 NS 'Koploper' EMU's No.4061 and No.4224 pass through Dorst with a service to Den Haag. 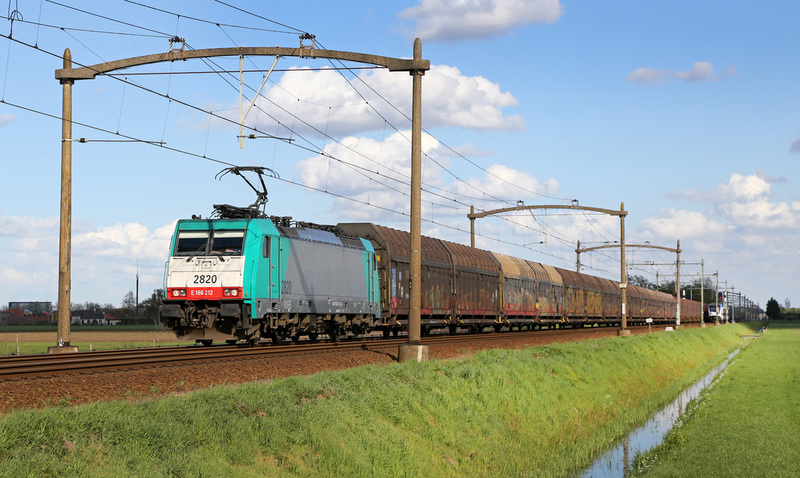 Class 189 No.189283 passes Dorst with a contianer train bound for Rotterdam Docks. 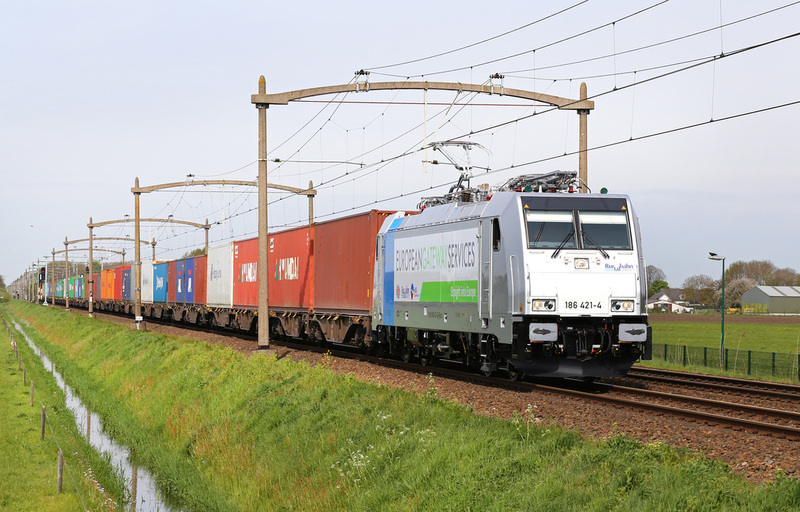 Class 189 No.189104 passes Dorst heading for Germany with a container train from Rotterdam Docks. 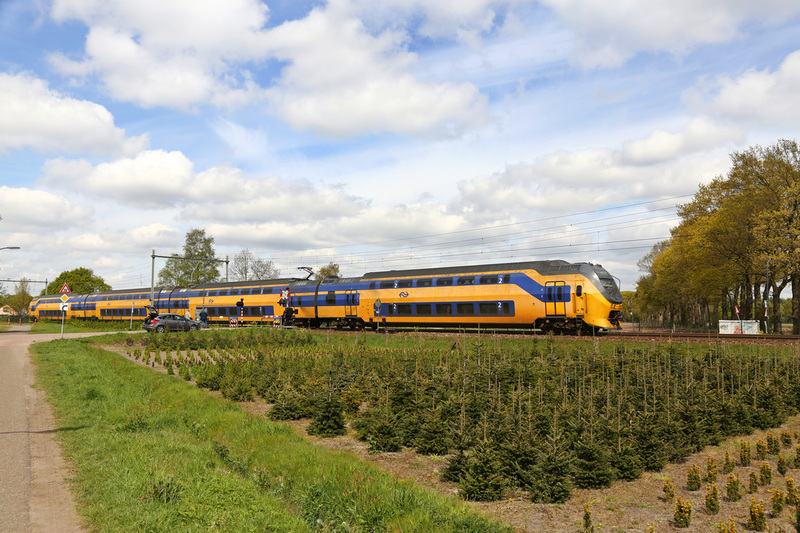 NS DDZ No.7650 passes Dorst as a local farmer tends to his crop of Christmas Trees. 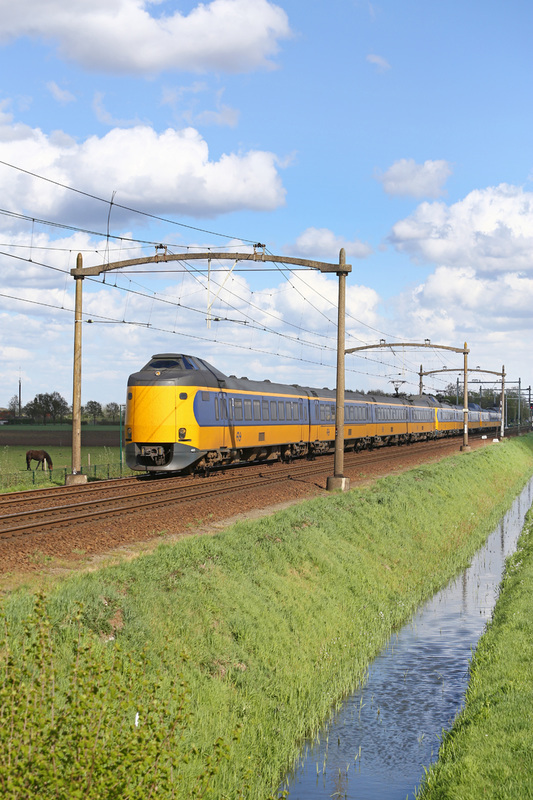 Dutch track machine No.99849460601 passes Dorst heading east. 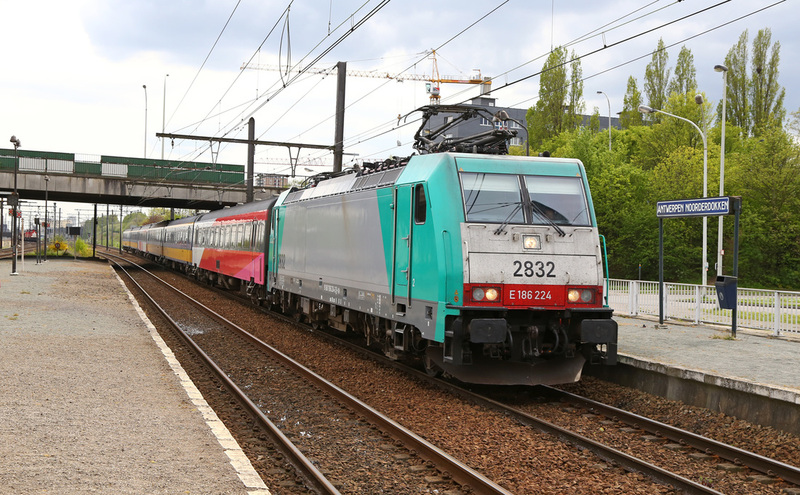 Class 1800 No.9901 (Ex NS 1827) is now operated by Locon. 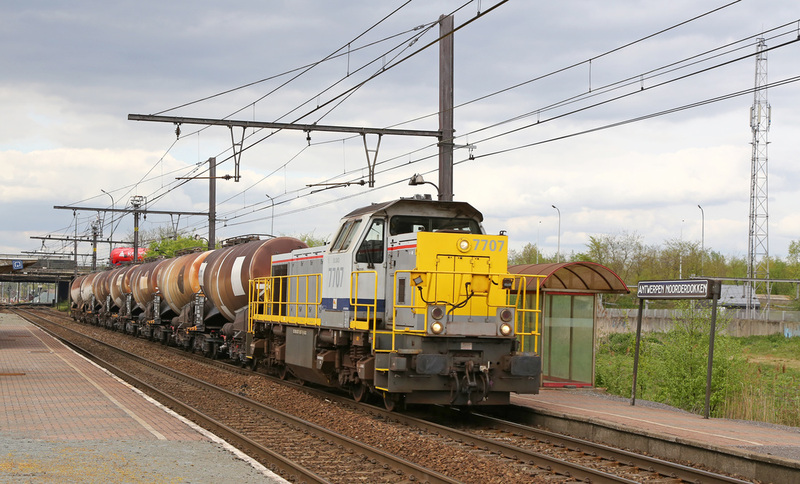 The colourful locomotive is seen passing Dorst with a rake of LPG tanks in tow. 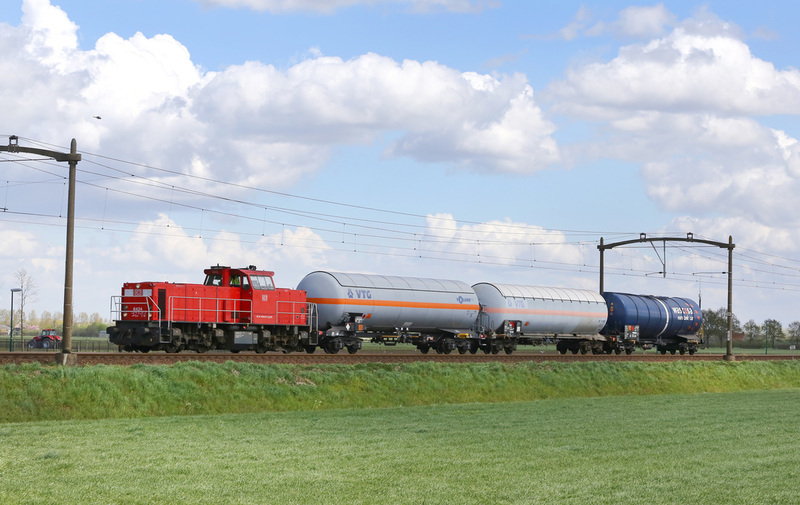 DB Class 1600 No.1614 passes Dorst loaded with UK Right Hand Drive Ford's heading for Rotterdam Docks from the Ford plant in Germany. 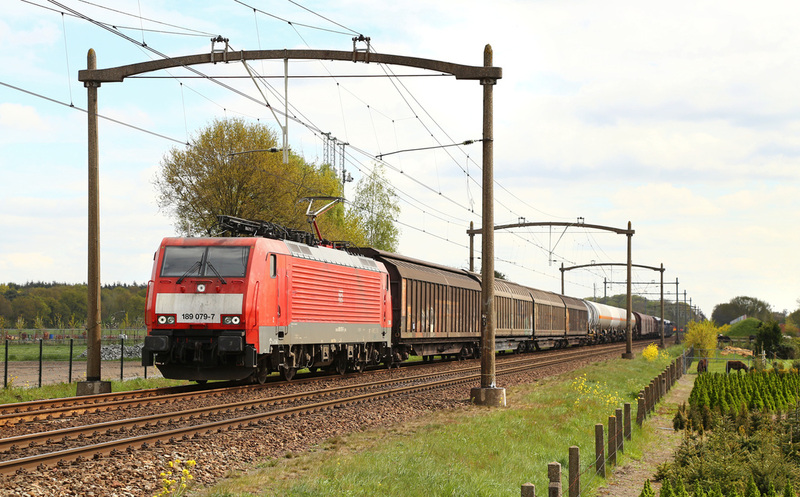 DB Class 189 No.189086 passes Dorst with an empty train of cartics heading back to Germany. 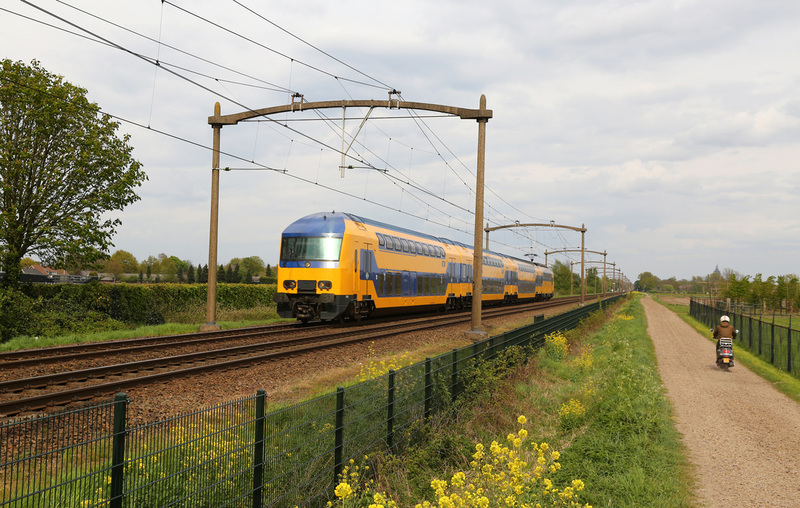 NS S70 Sprinters No.2464 and No.2453 pass Gilze Rijen on route towards Tilberg. 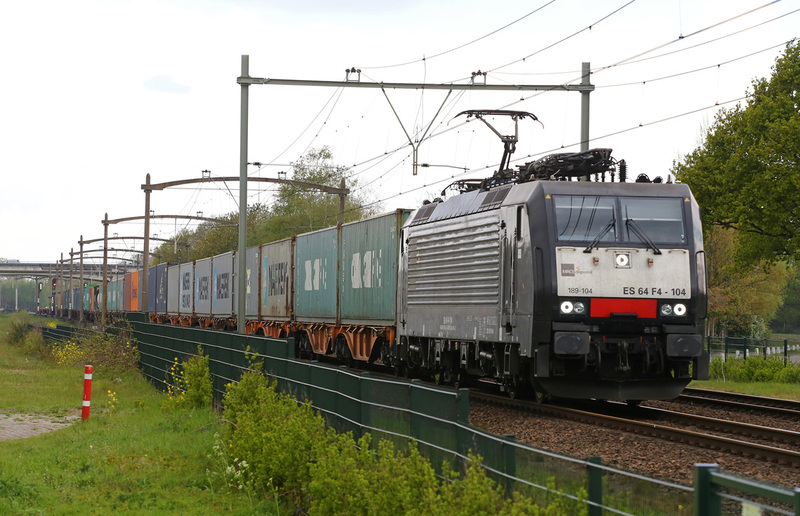 DB Class 6500 No.6439 passes Gilze Rijen with a container train heading for Rotterdam Docks. Stourkon MaK Class 1200 No.303007 passes Gilze Rijen heading east with a small engineering train in tow. 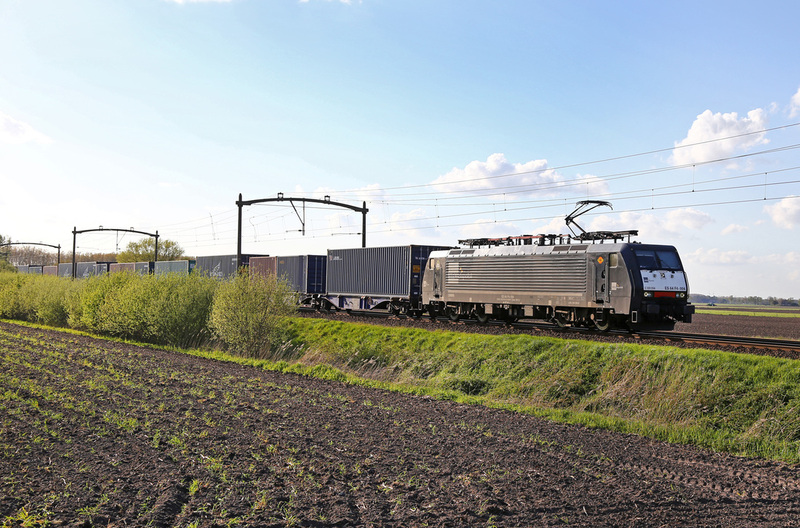 DB Class 6500 No.6440 follows classmate No.6439 west with a second container train heading for Rotterdam Docks at Gilze Rijen. 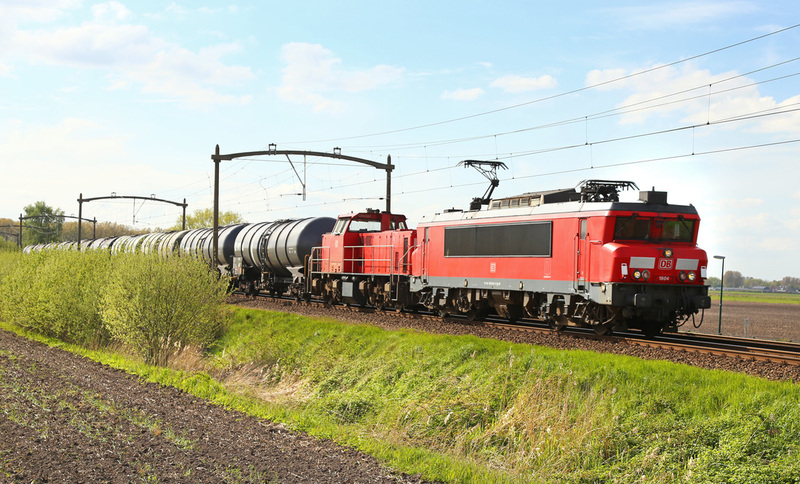 DB Class 6500 No.6424 passes Gilze Rijen with three chemical tanks in tow. 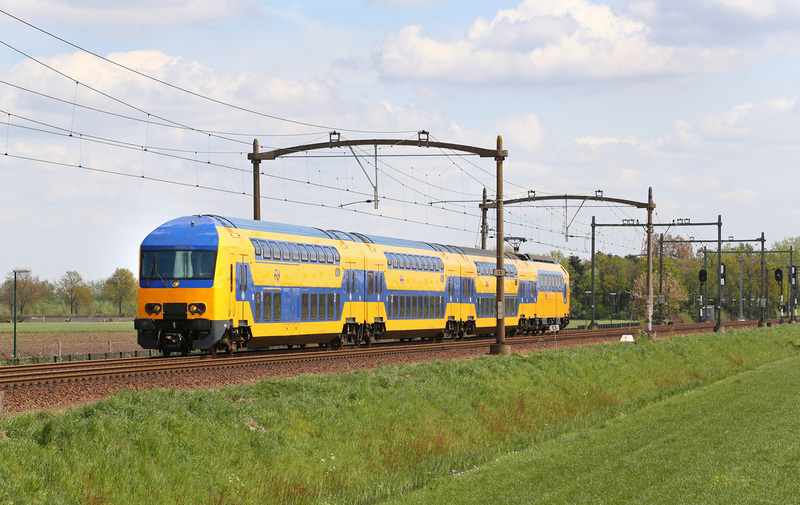 NS Type S70 and S100 Sprinters No.2453 and No.2464 pass Gilze Riejn on route to Utrecht. 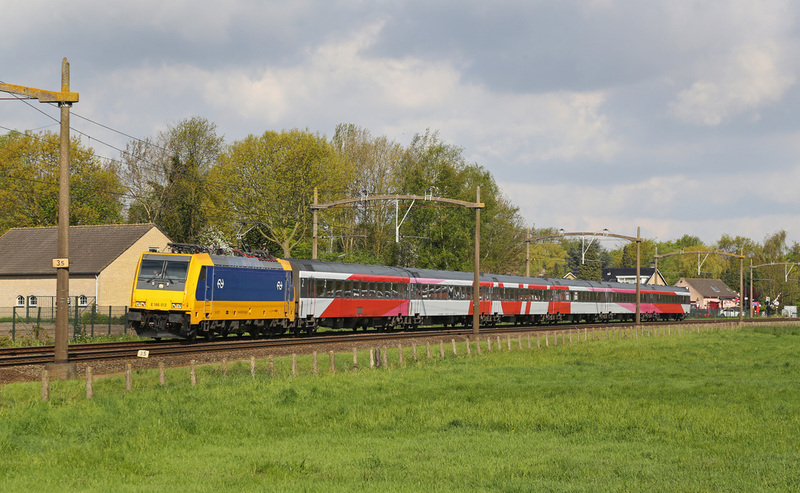 NZ Plan Z1 & Z2 Units No.4228 and No.4027 pass through Gilze Rijen heading for Venlo. 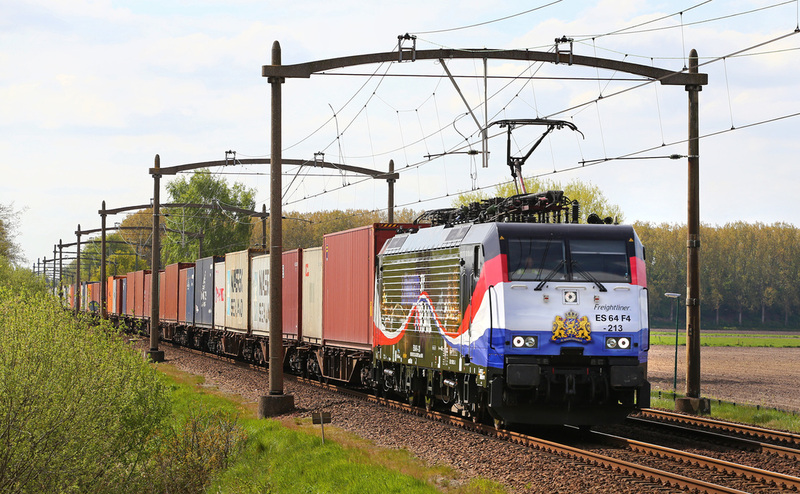 ERS Class 189 No.189212 passes Gilze Rijen hauling a Rotterdam - Poznan (Poland) container train, the loco (one of two) carries a special livery to mark the landmark operation. UST02 Eurorail Scout No.97 86 13501 passes Gilze Rijen returning eastbound on a track recording run. Class 1600 No. 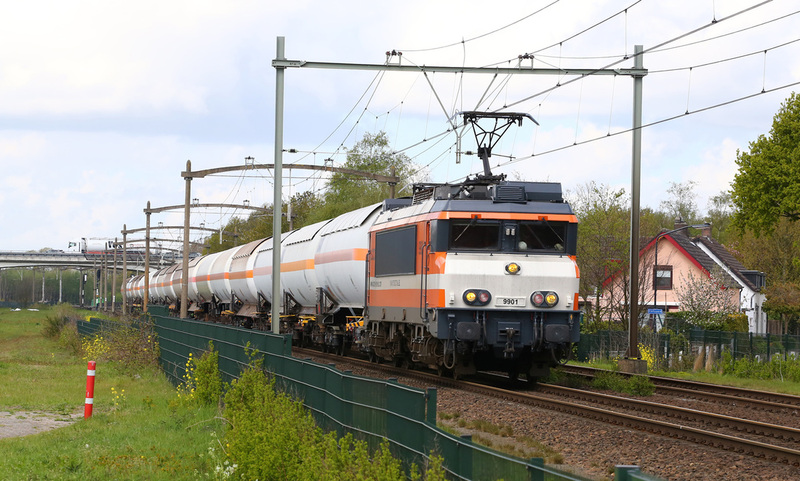 4401 (Ex 1606) is now operated by the Rotterdam Rail Feeding Company (in turn owned by Genesee and Wyoming) is seen passing Gilze Rijen with a rake of empty cartics. 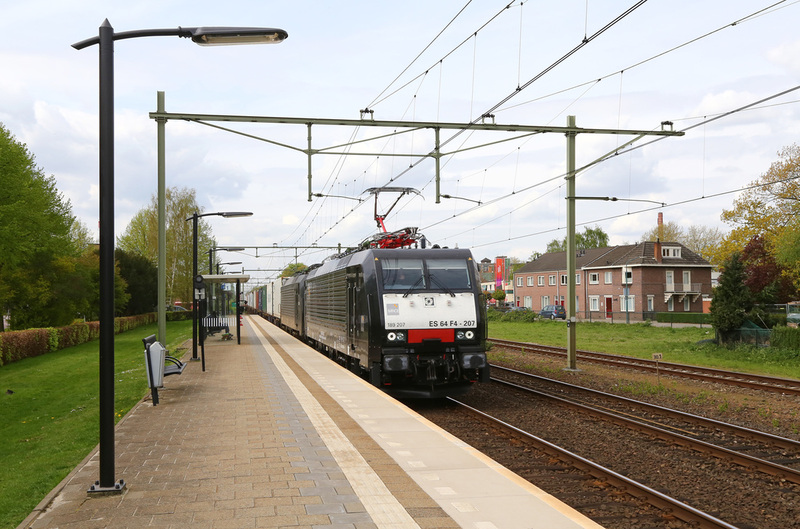 NS S100 Sprinter No.2638 heads towards Breda at Gilze Rijen. 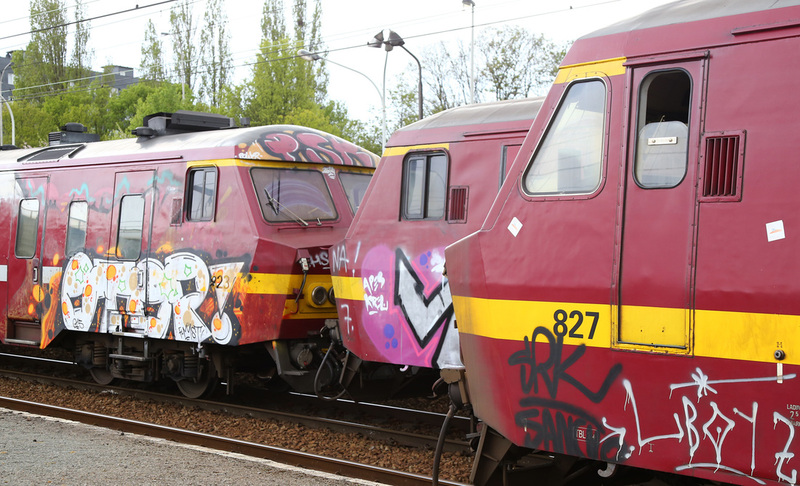 NS Plan Z1 & Z2 units No.4207, No.4097 and No. 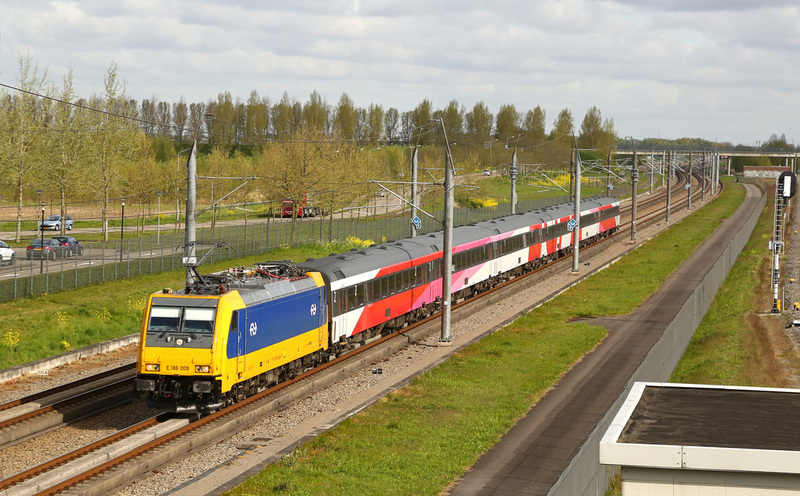 4227 pass Gilze Rijen on a peak service train from Venlo to Den Haag. DB Class 189 No. 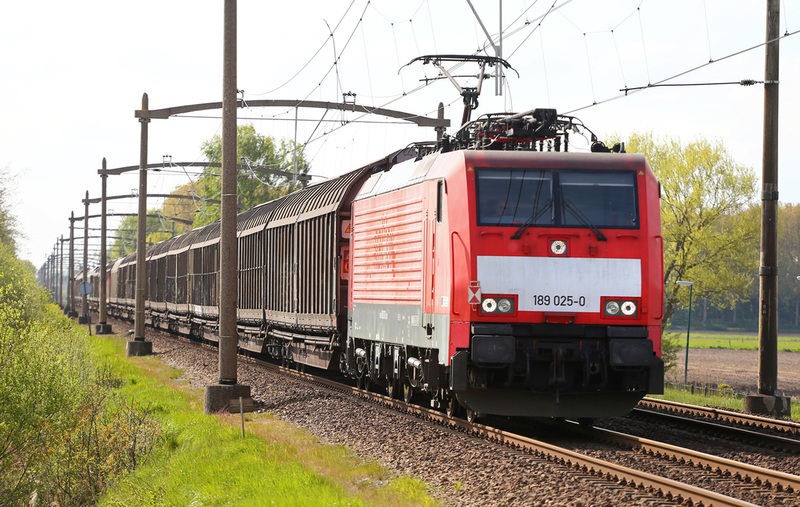 189084 passes Gilze Rijen with an empty coal train from Germany heading for loading. 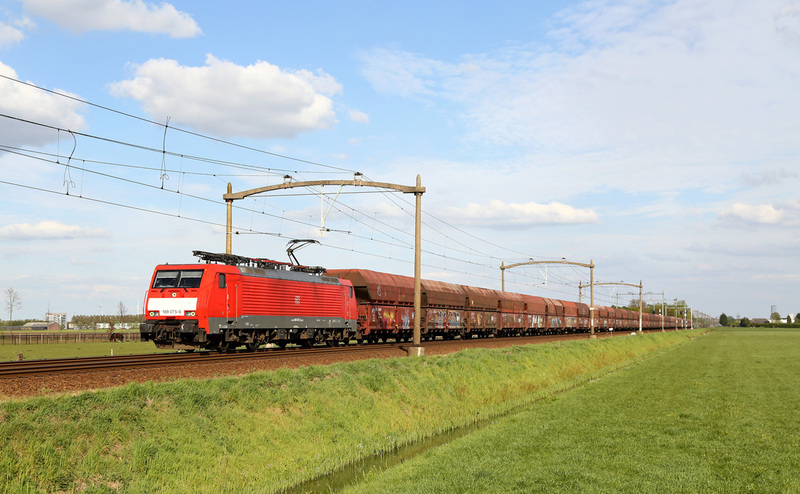 DB Class 189's No.189054 and No.189066 pass Gilze Rijen on route back to Germany with a loaded coal train. 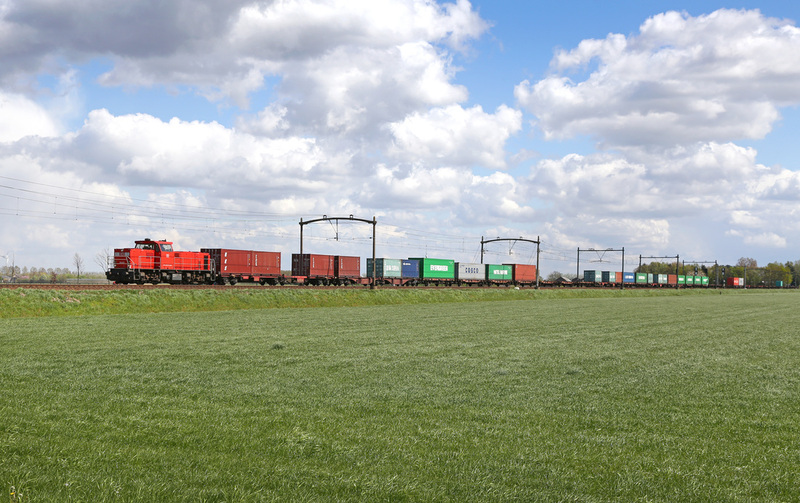 Railpool Class 186 No.186106 is operated BLS Cargo (Swiss) and is seen at Gilze Rijen with a container train heading east towards Germany. 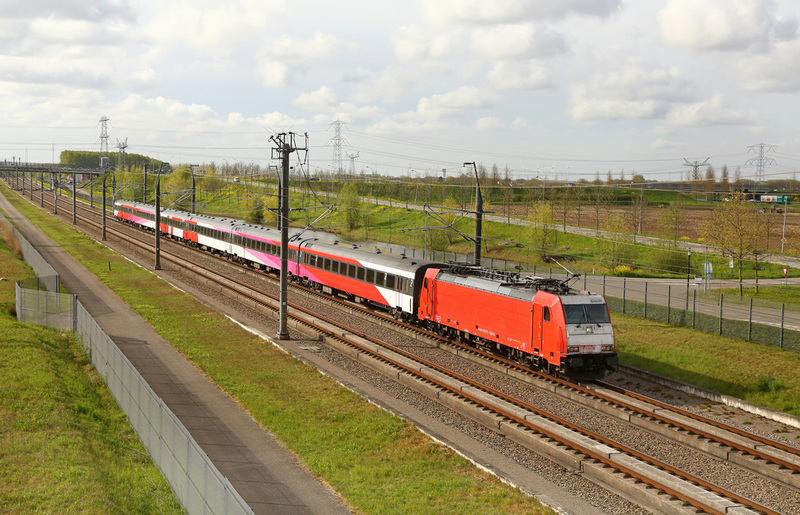 Class 186 No.186422 was only one week old at the time of this image being taken, Rurtalbahn operate the locomotive which is seen passing Gilze Rijen. 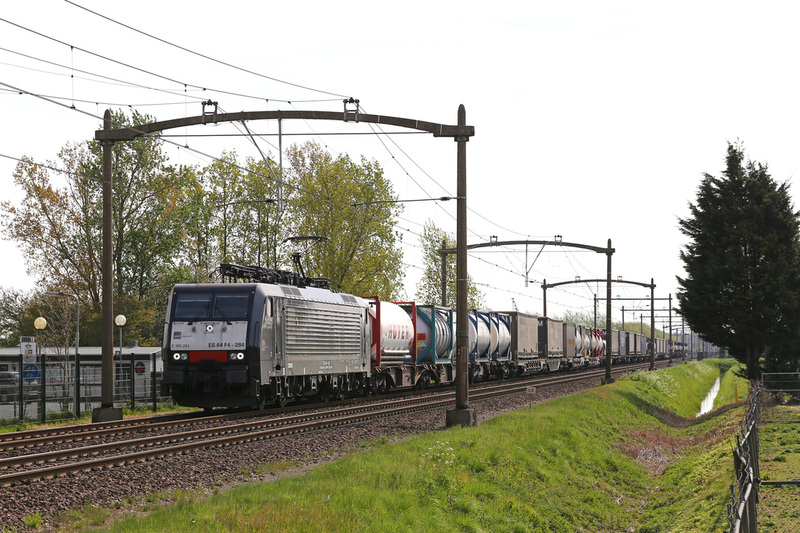 Belgian Railways Class 186 No.186212 (2820) is seen passing Gilze Rijen with a trainload of cargo wagons, most probably heading for the Port of Antwerpen. 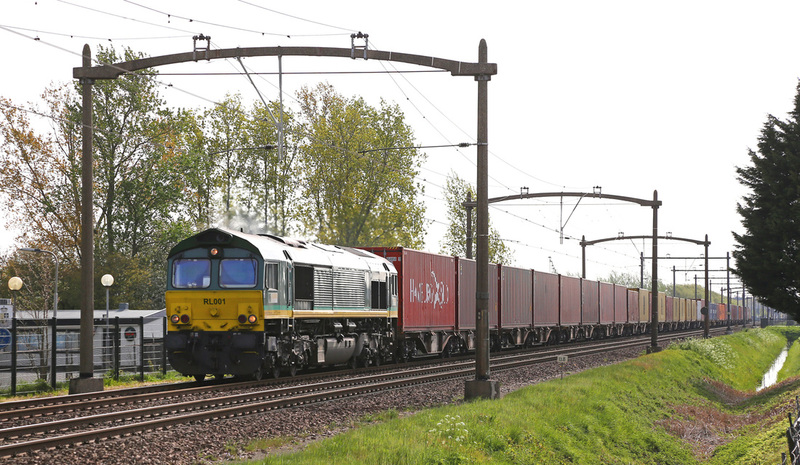 Euro Class 66 No.DE6306 (EU08) is operated by Crossrail Benelux, and is pictured passing Gilze Rijen heading east with a container train. 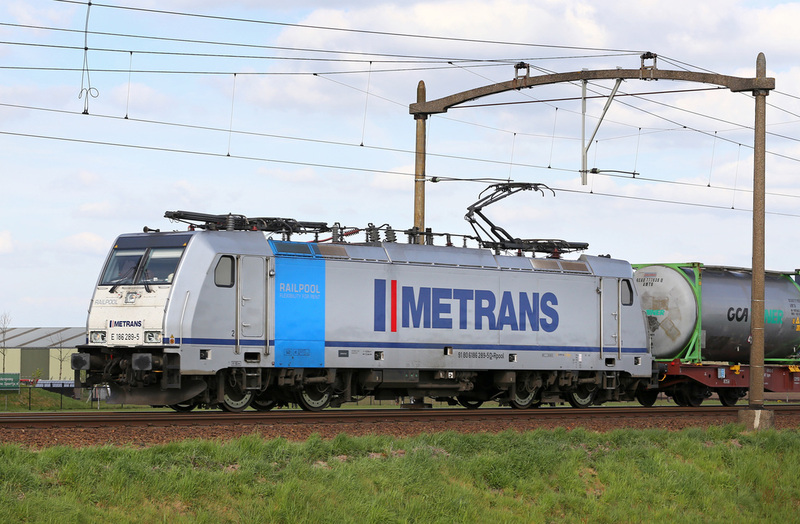 Class 189 No.189094 carries a Rotterdam Rail Feeding Company logo in the cab door, suggesting it was the operator at the time of this image. 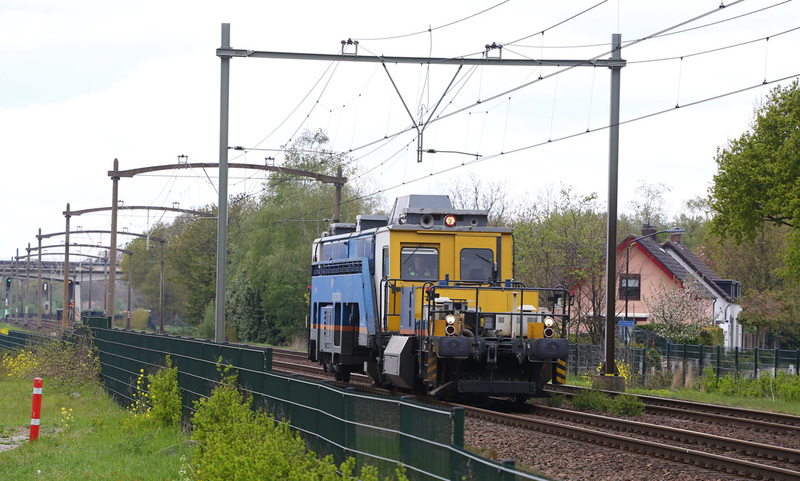 The loco is seen at Gilze Rijen heading east towards Germany. For the third day of our visit we started the morning period by driving out to Gilze Rijen, this time at a new location about a quarter of a mile from the previous days location. This gave better views of traffic heading eastbound towards Eindhoven. 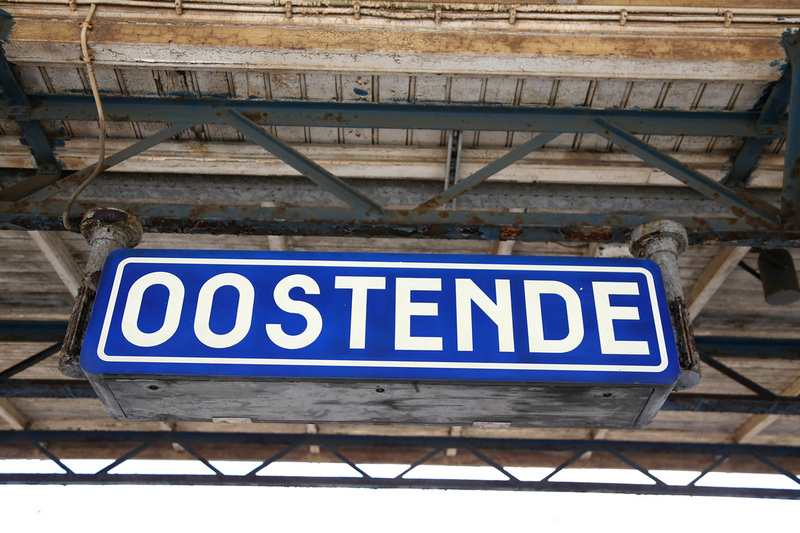 At around mid day we then moved to the oposite side of Tilberg to a small town called Oisterwijk. The station also contained a quaint railway cafe, after a break for lunch we proceeded out into the countryside finding a quiet location on a cycleway near Boxel located close to adjacent woodland close to a cylce path in a wooded area. During the late afternoon, poor weather closed in before rain arrived at around 18:00. NS S100 Sprinter Unit No.2624 departs from Breda Prinsenbeek Station passing our Hotel on route to Breda. 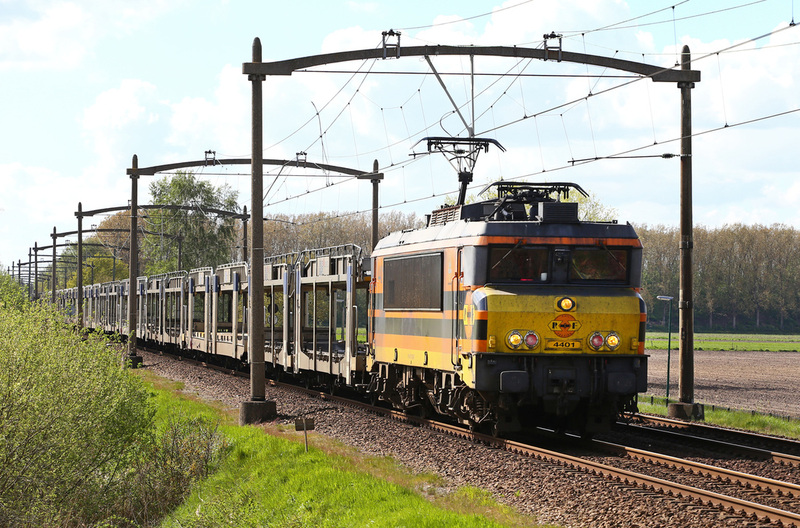 NS DDZ No.7529 speeds through the crossing at Gilze Rijen heading towards Breda. 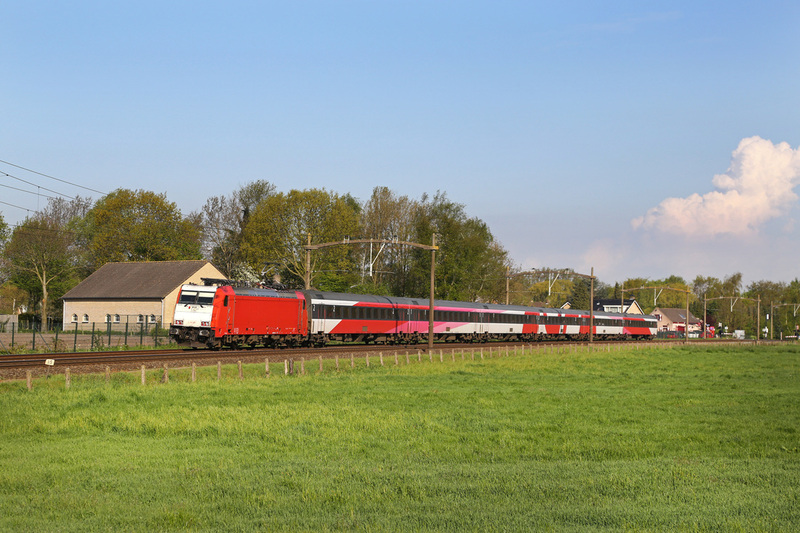 NS Reigo Runner No.8662 passes Gilze Rijen heading towards Tilberg. 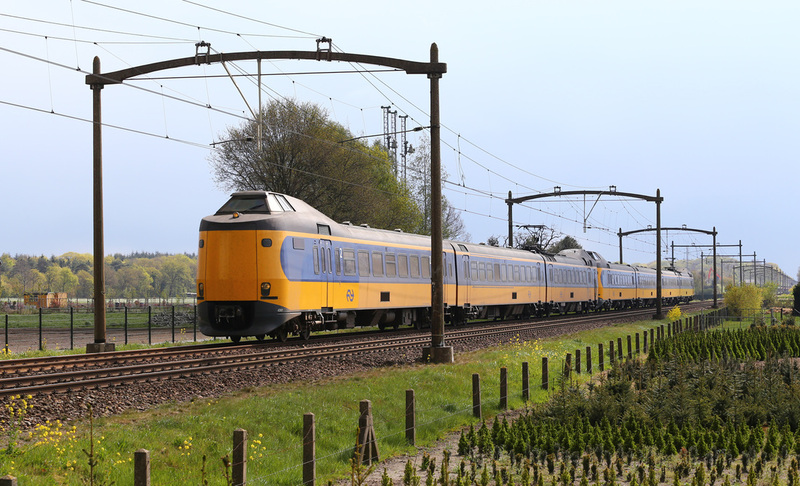 NS 'Koloper' EMU's No.4225 and No.4207 pass Gilze Rijen heading eastbound. 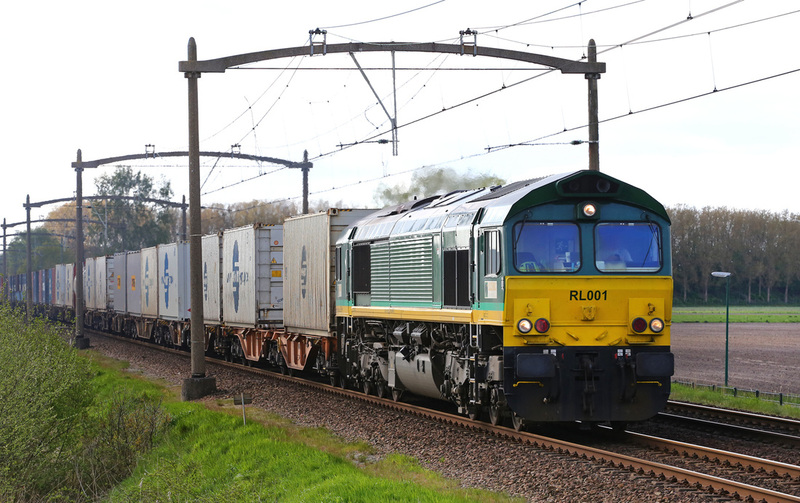 Euro Class 66 No.RL001 (EC2) is owned by Ascendos Rail Leasing, and was operated by Railtraxx. 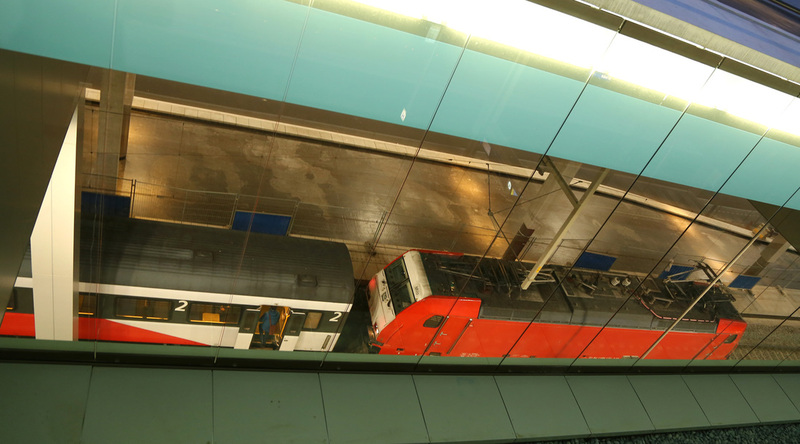 The loco is seen returning towards Tilberg having been into Germany overnight. 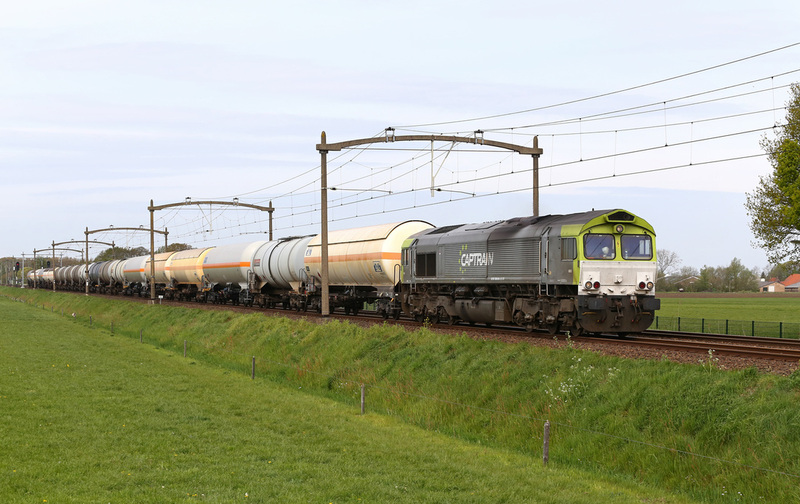 Captrain Class 66 No.6601 (PB07) passes Gilze Rijjen on a trainload of chemicals most probably originating from Antwerpen Docks in Belgium. 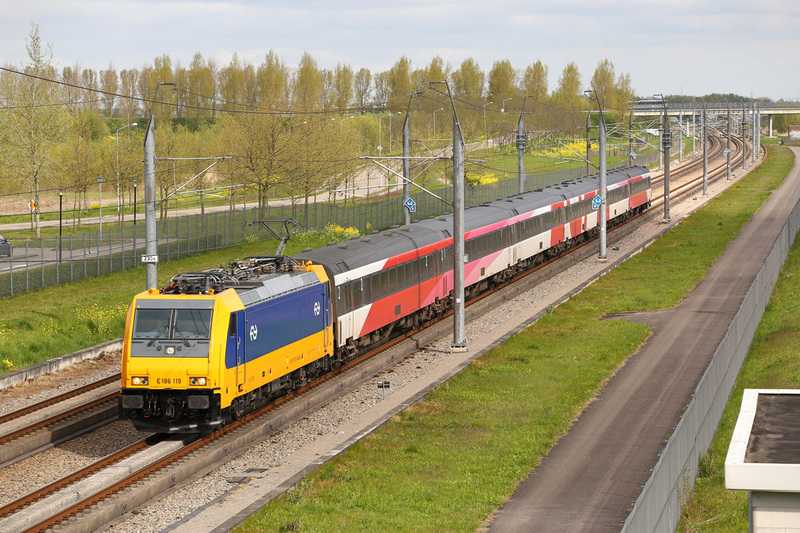 NS S70 & S100 Sprinter Units No.2432 and No.2628 pass Gilze Rijen heading for Utrecht Central. 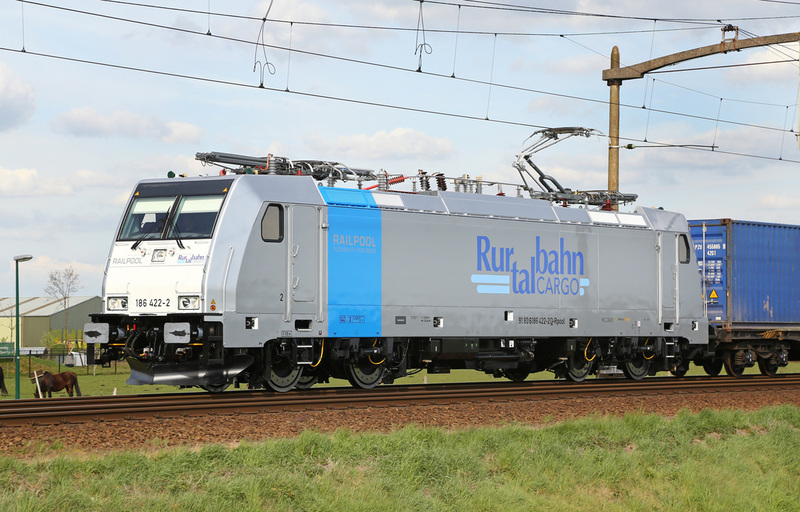 Rurhtalbahn Class 186 No.186421 was less than a week old when this image was taken, The loco carries European Gateway Services livery which operate integrated container transport by Deep Sea, Inland Waterways, Rail and Road. 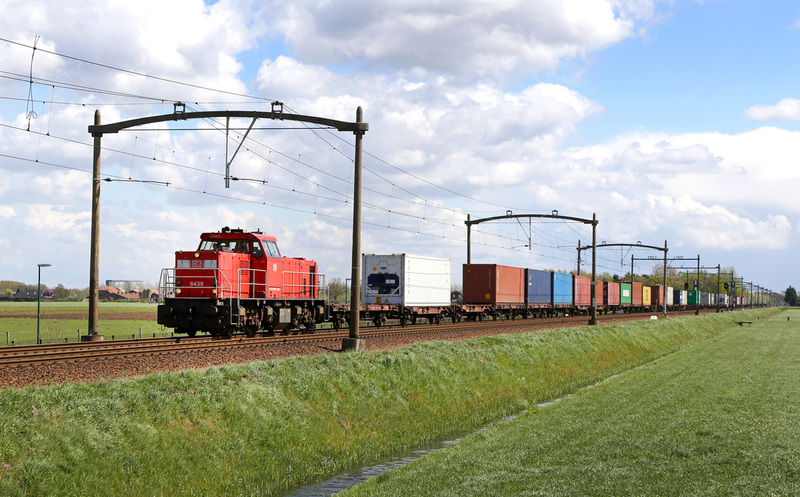 Class 189 No.189284 passes Gilze Rijen with an Intermodal heading to the port of Rotterdam. 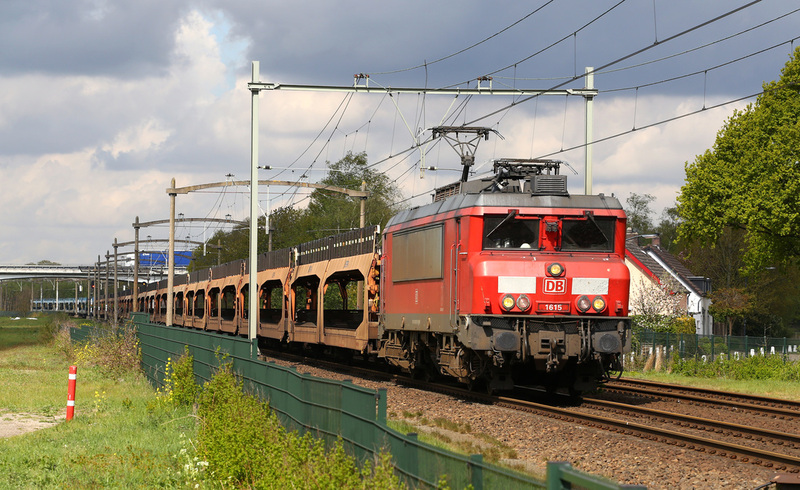 DB Class 189 No.189087 passes Gilze Rijen with an empty train of cartic wagons returning to Germany from Rotterdam. 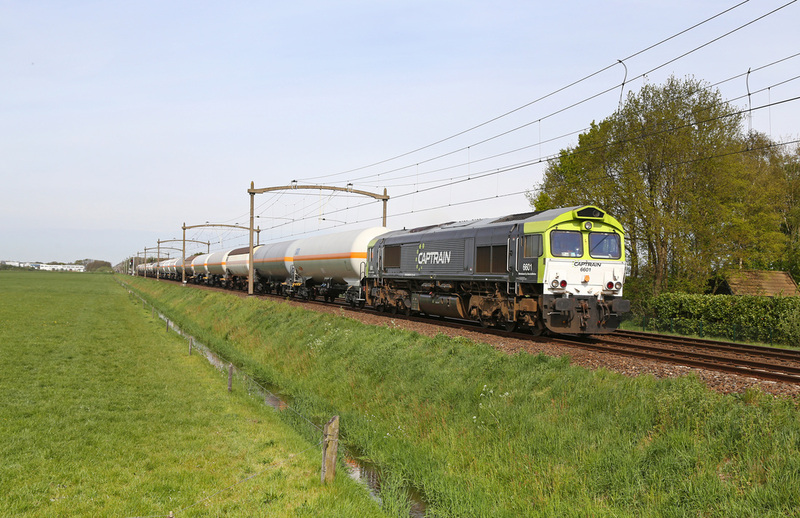 Captrain Class 66 No.6605 (PB11) passes Gilze Rijen with a second trainload of chemical tanks in tow, most probably originating from the same location as the previous Captrain service just minutes before. 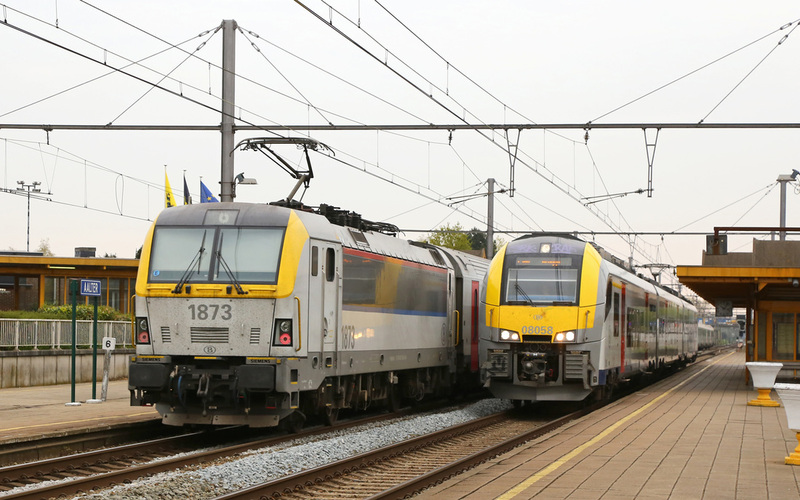 A double headed pair of Class 189's No.189207 and No.189994 speed through Oisterwijk Station heading towards Eindhoven with a lengthy intermodal service. 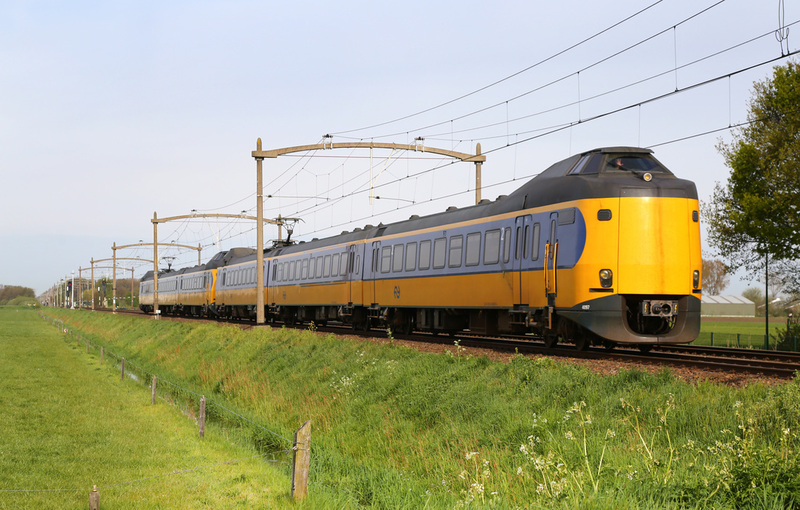 NS 'Koploper' EMU's No.4210 and No.4093 speed through Oisterwijk heading for Den Haag. 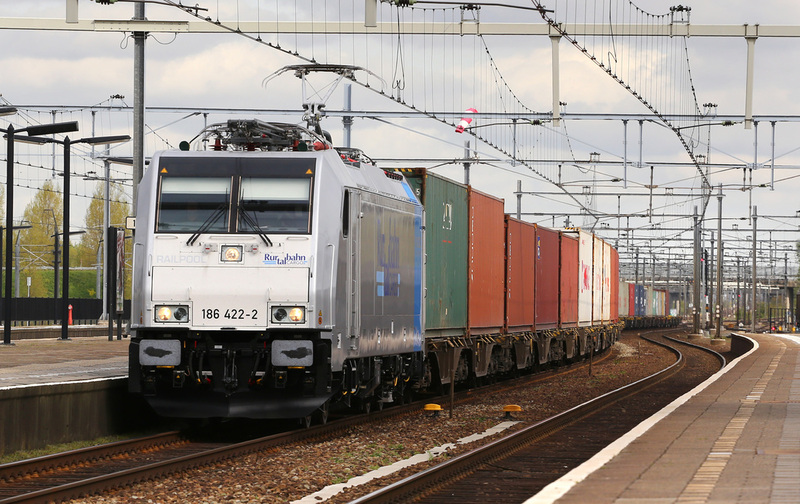 Crossrail liveried Class 66 No.DE6310 powers through Oisterwijk Station at dead on 12:00 heading for a Belgian Port. 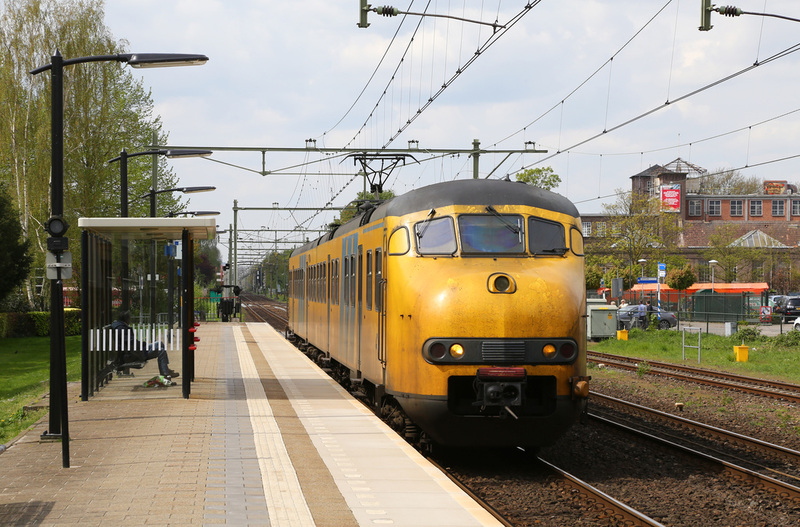 NS Plan V EMU No.441 arrives into Oisterwijk with a stopping service. 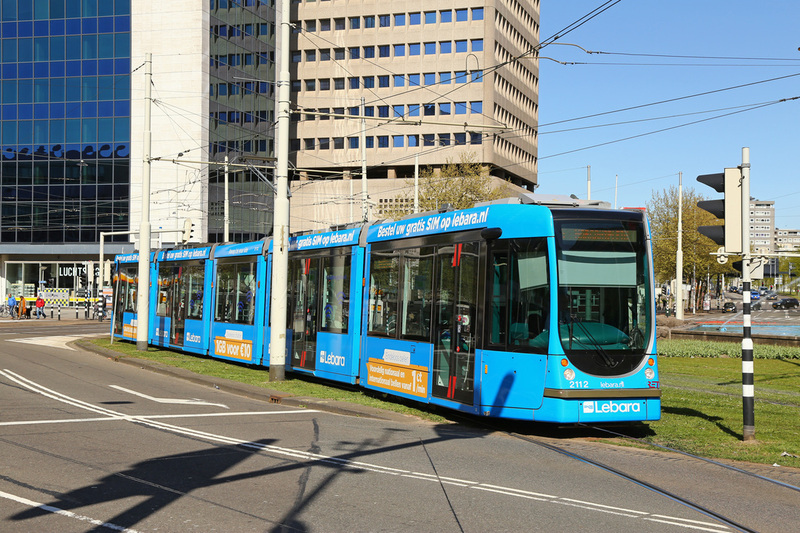 This was one of only two Plan V units seen during our week in The Netherlands. NS DDZ No.7540 departs from Oisterwijk passing a Reigo Runner No.9412 arriving from the Tilberg Direction. 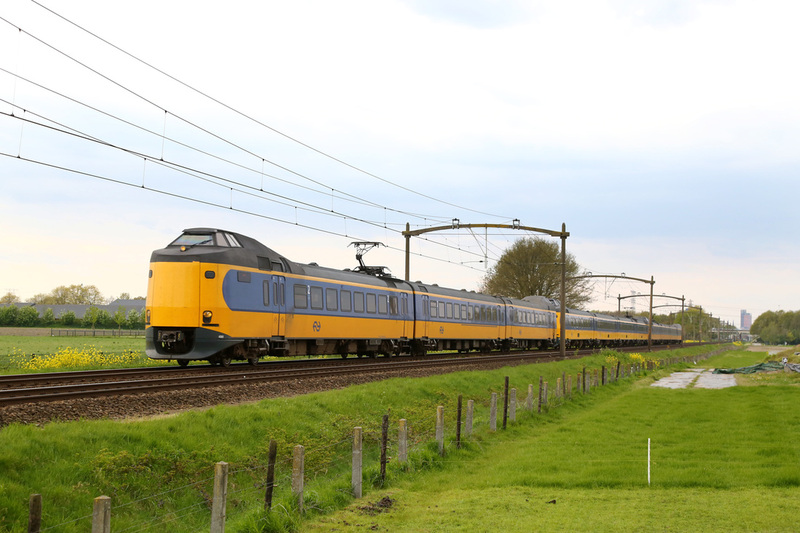 Ns Double Deck Reigo Runner No.9412 arrives into Oisterwijk from Tilberg. 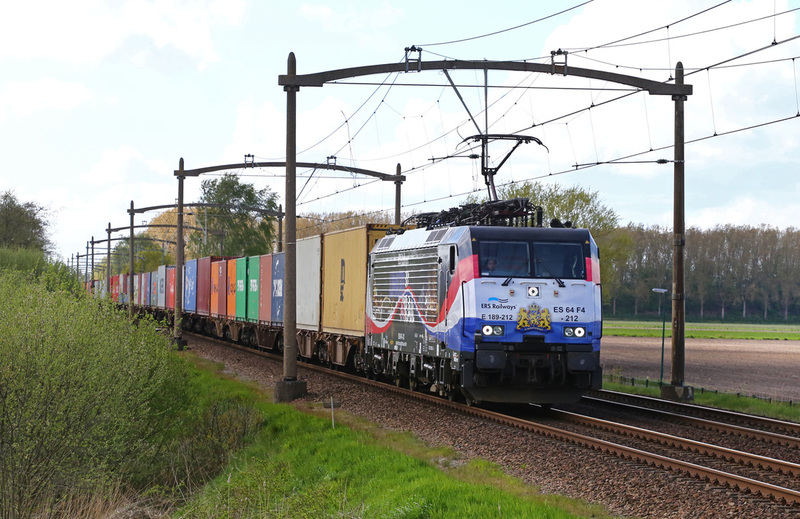 DB Class 6500 No.6440 passes a crossing between Boxtel and Oisterwijk heading for Rotterdam with a container train from Germany. 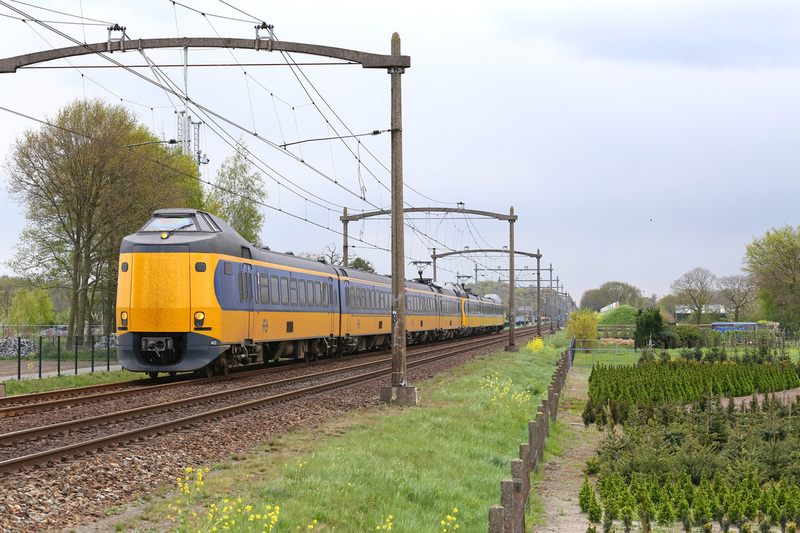 NS Plan V EMU No.441 passes Haaren on route to Eindhoven from Tilberg. 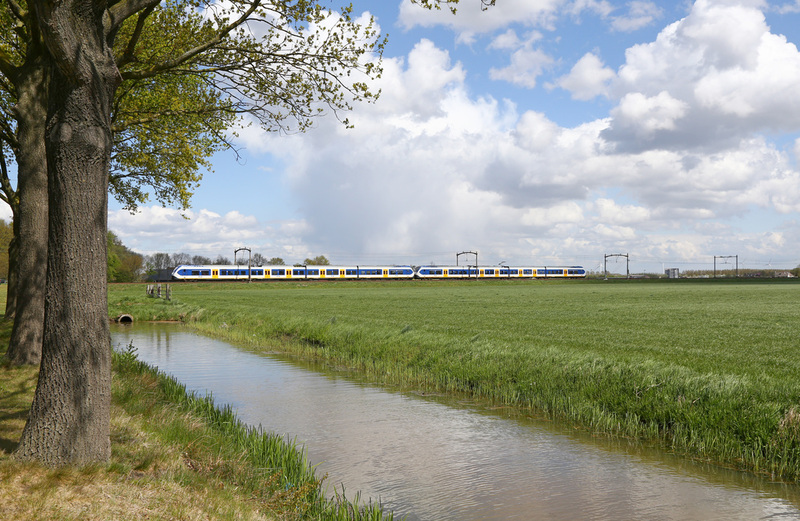 NS Plan Z1 and Z2 units No.4223 and No.4080 pass Harren nearing the next town of Boxtel. 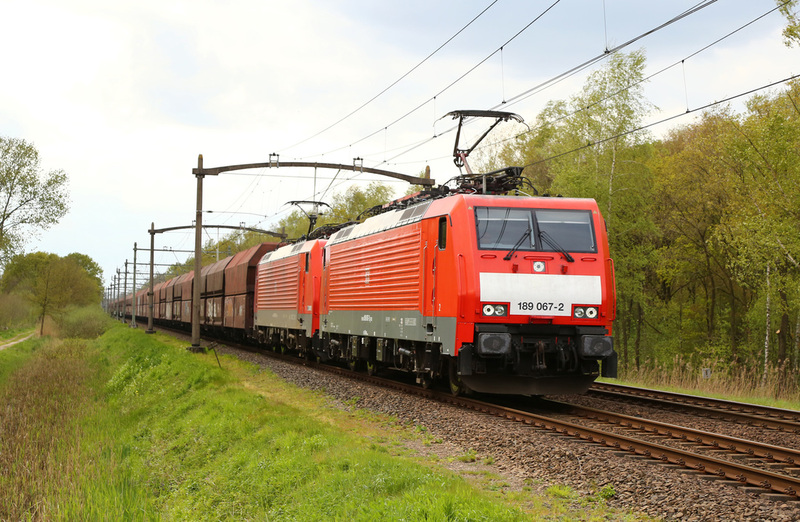 DB Class 189 No.189048 passes Haaren with a train load of cargowagons heading for Germany. 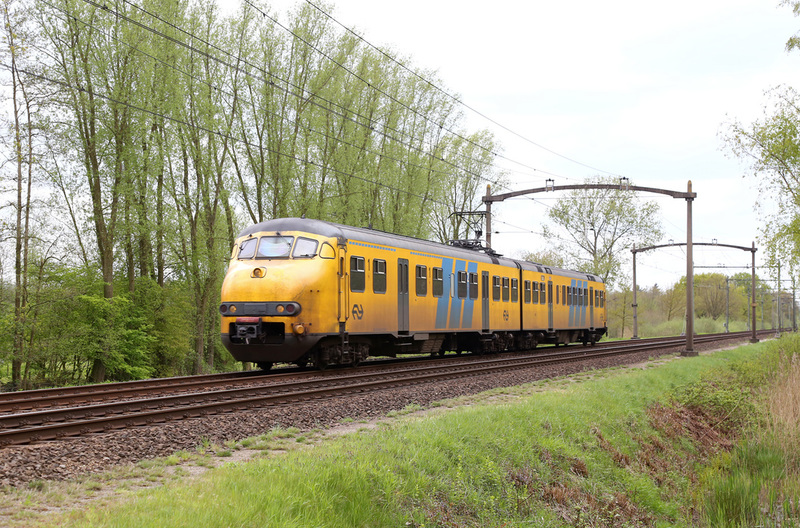 NS 'Koploper' EMU's No.4223 and No.4080 pass through the forest section between Oisterwijk and Boxtel heading east. 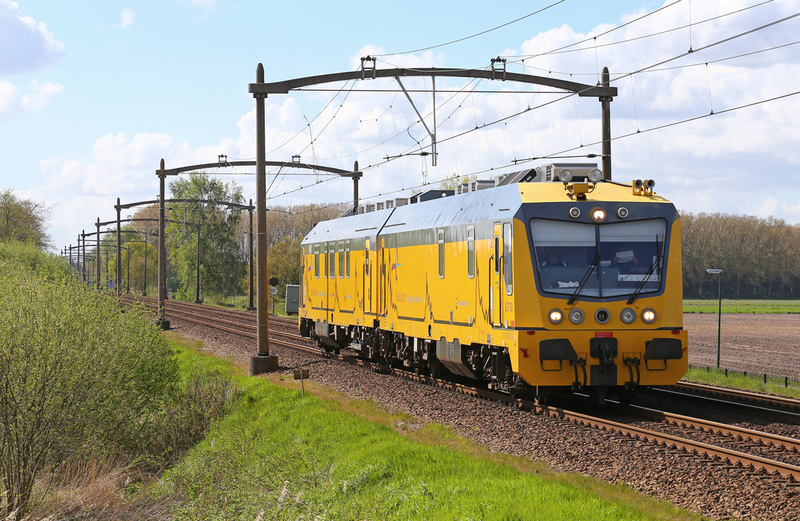 NS DDZ No.7540 passes Haaren on route towards Oisterwijk. NS Plan V Unit No.441 returns now coupled to classmate No.480. 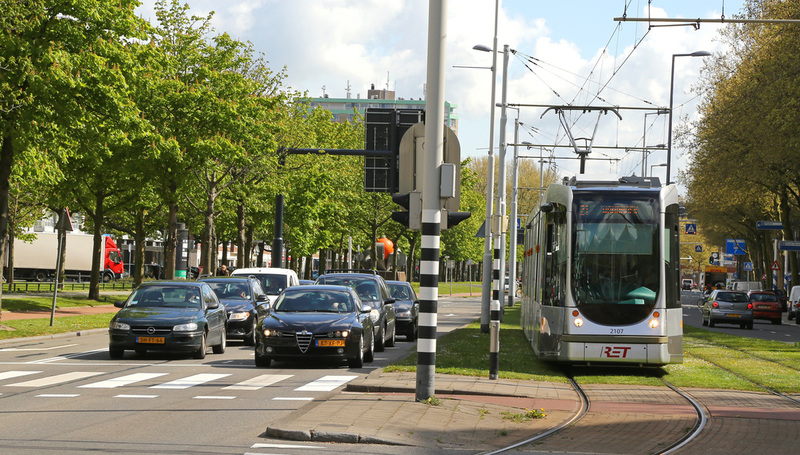 The pair are seen heading towards Oistwerwijk. NS Plan V Units No.480 No.441 return from Tilberg heading for Eindhoven. DB Class 1600 No.1614 is pictured passing Haaren slowly having failed in section. Thankfully Diesel Class 6500 No. 6422 was tucked inside the train and was able to purh the train to allow the line to be cleared. 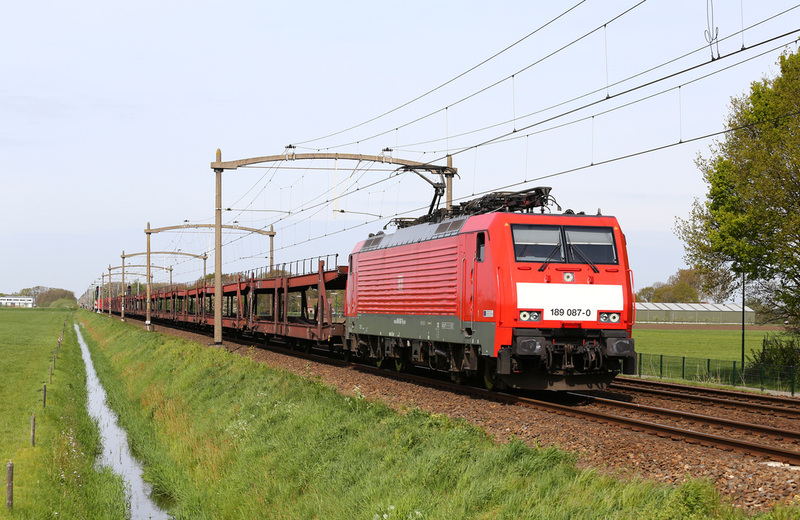 DB Class 189 No.189084 passes through Harren with an intermodal service bound for Germany. 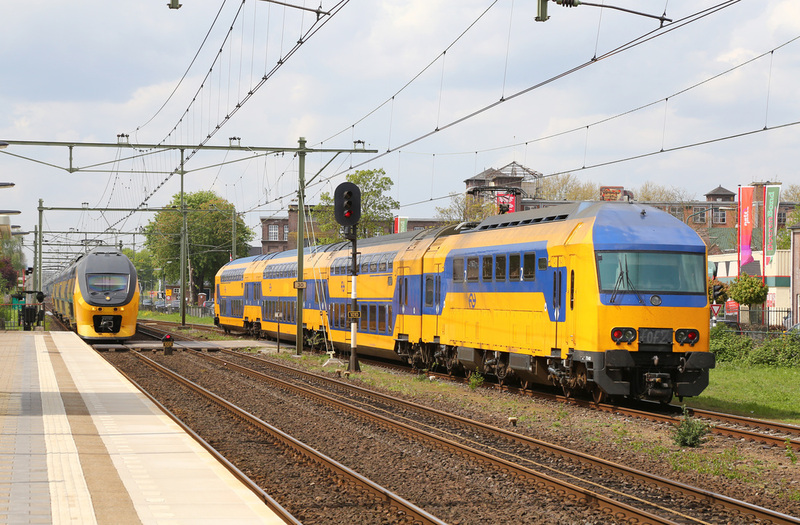 A double headed Class 189 DB working formed of No.189024 and No.189089 passes Harren heading for Rotterdam. 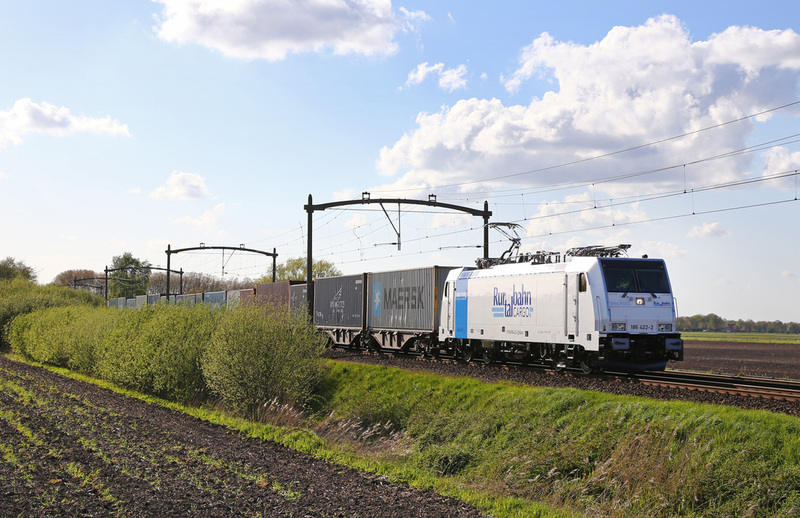 Euro Class 66 No.66602 (PB08) is owned by Ascendos Rail Leasing, and is seen passing Harren on route towards Gerrmany. NS Plan V Units No.441 and No.480 return towards Tilberg. 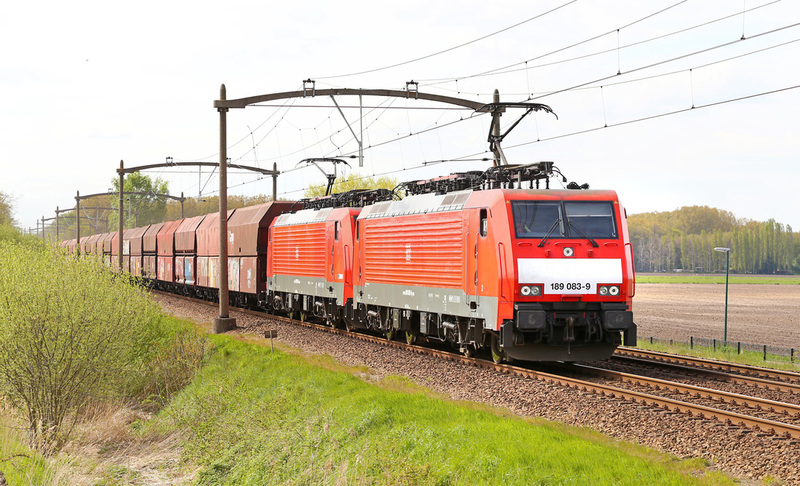 Double Headed Class 189's No.189067 and No.189069 pass Harren with a loaded coal train heading for Germany. 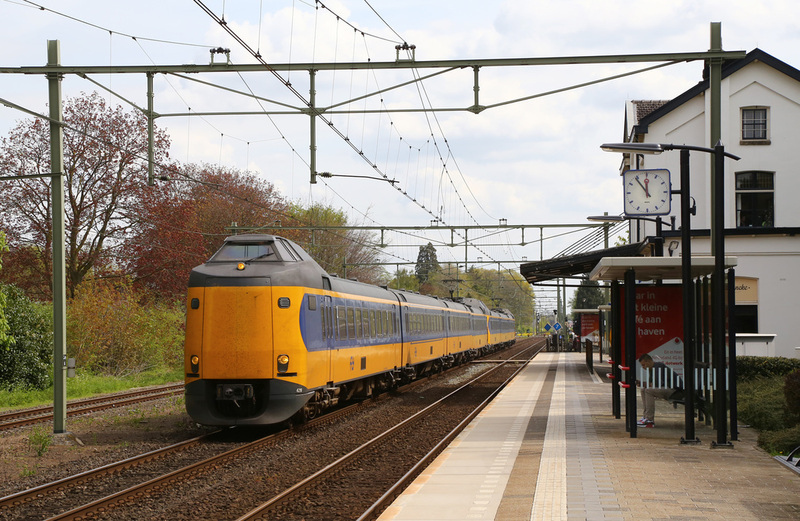 NS 'Koploper' EMU's No.4097 and No.4082 pass through Harren on route to Venlo. DDZ No.7529 passes Steeptraat near Tilberg. 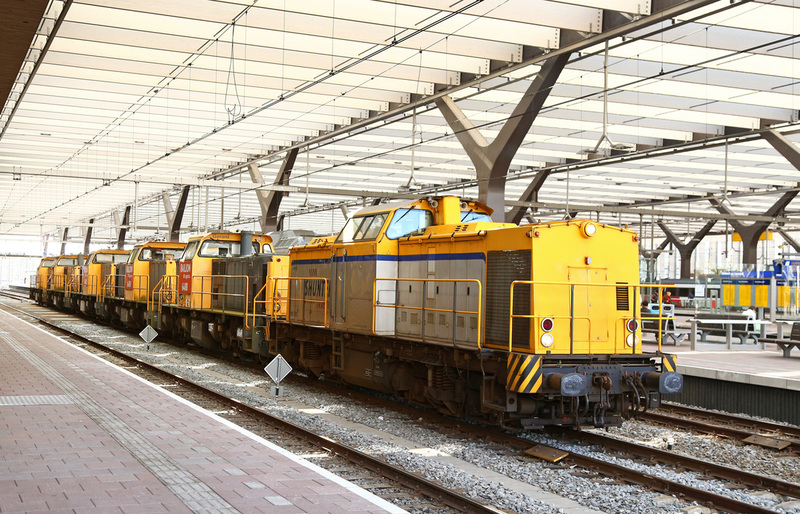 NS 'Koploper' Z1 and Z2 Units No.4061, No.4207 and No.4225 work a peak hours service to Venlo. 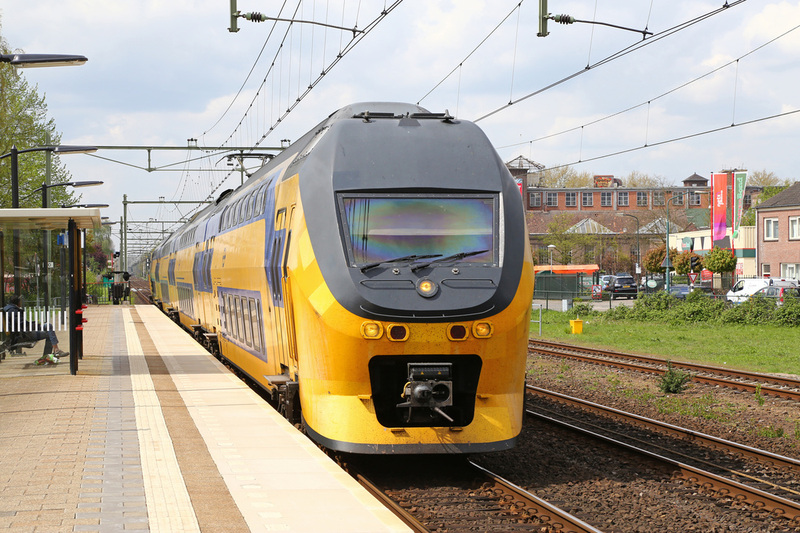 We decided on a change of pace for the fourth day of our Netherlands visit, and booked tickets to travel from Breda to Rotterdam using the new locomotive hauled high speed service. 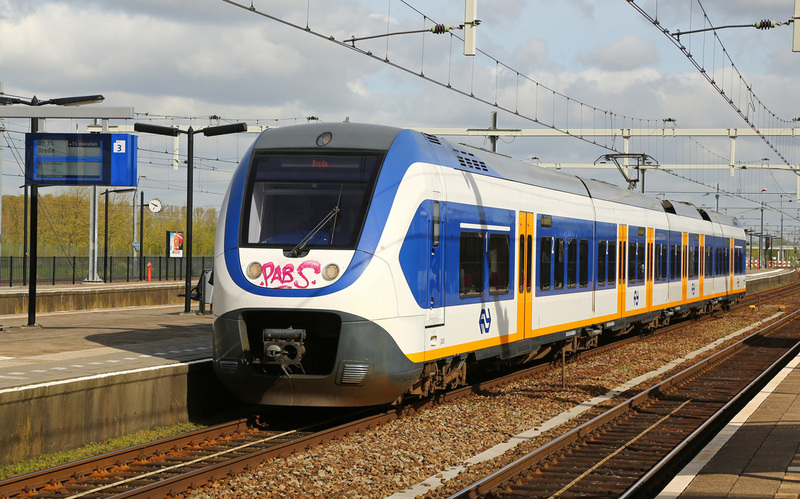 The collapse of the new high speed train orders in The Netherlands is well documented, and while the government recover from the money woes, the operators are at least trying making use of the line by allowing loco hauled trains (using class 186's) from Breda to operate over the route at a speed of 160 kilometres per hour. 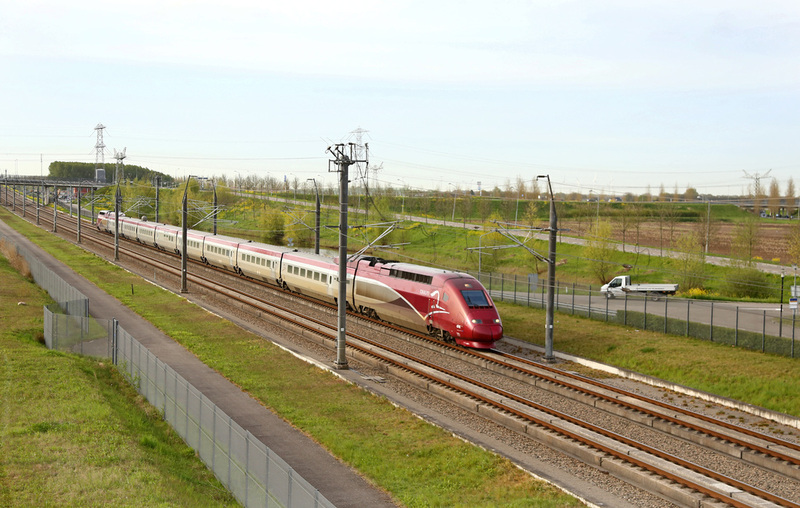 The only services using the high speed line at full line speed (330 kmh) are the hourly Thalys TGV services between Paris, Brussels and Amsterdam. 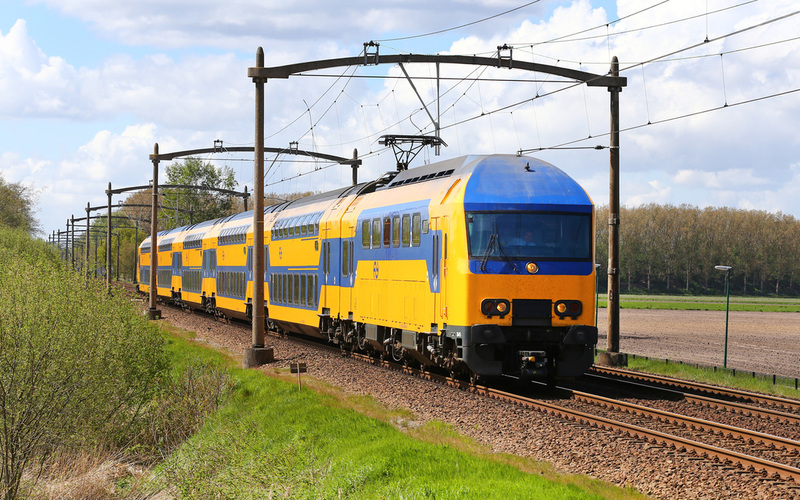 It's hoped by the end of 2016 Eurostar will also operate over the route linking London with Amsterdam using their new Eurostar Velaro sets. 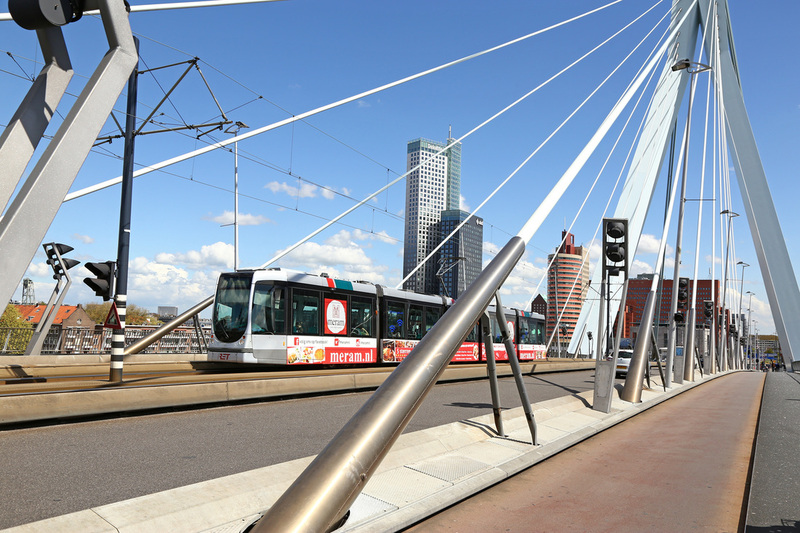 Once at Rotterdam we explored the city using the cities extensive and frequent tram network. 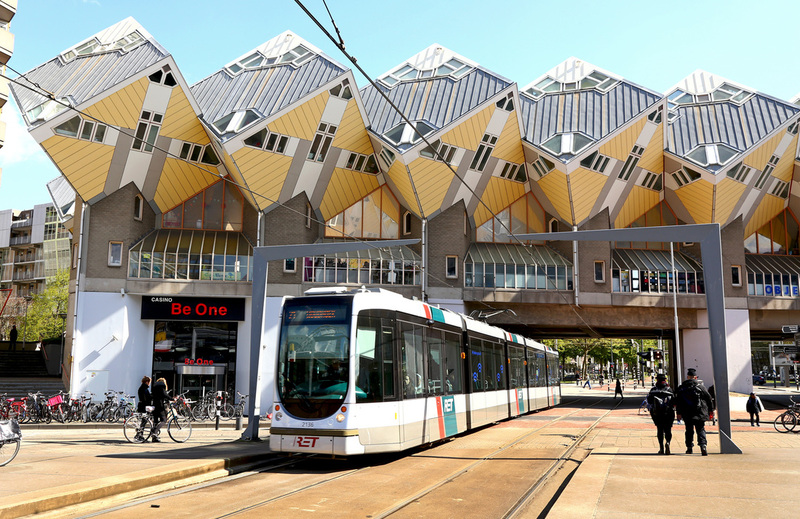 The city was a complete surprise and Architectural wonders, and has a modern and vibrant landscape in which to explore. 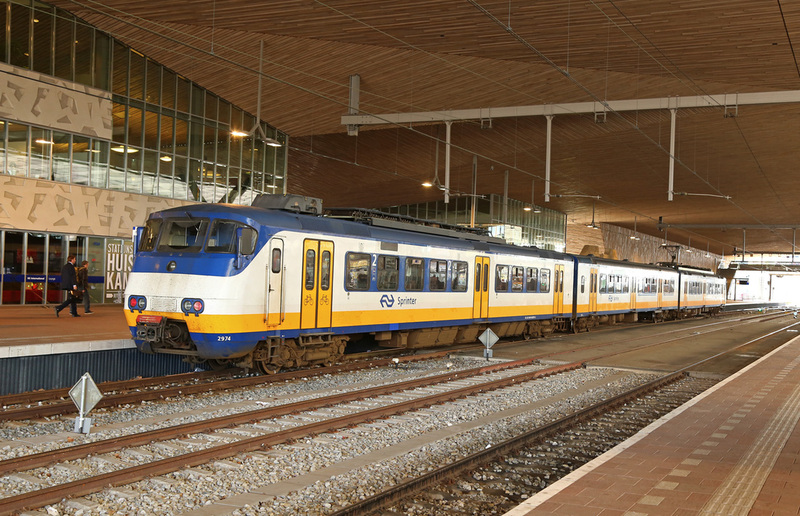 Class 186 No.186115 is seen at Breda Station on the 20th April 2015 ready to depart with the 08:56 to Amsterdam Central calling at Rotterdam and Schipol Airport on route. 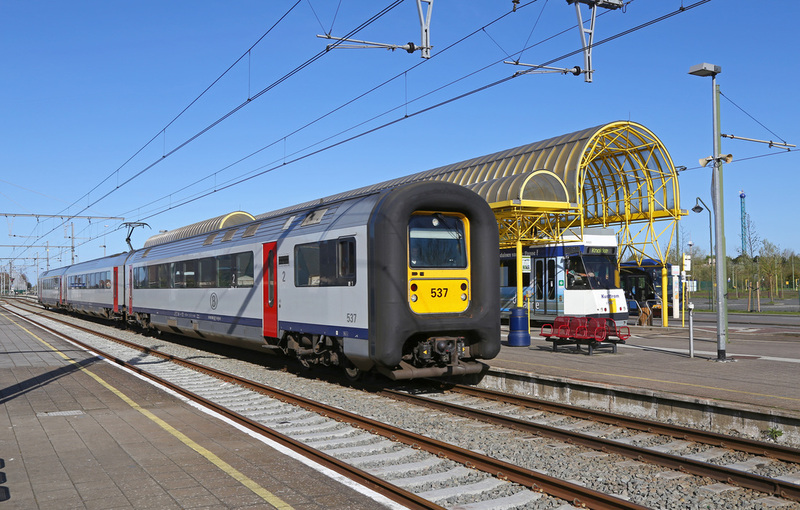 NS liveried Class 186 No.186012 arrives into Breda with the 07:55 from Amsterdam Central. 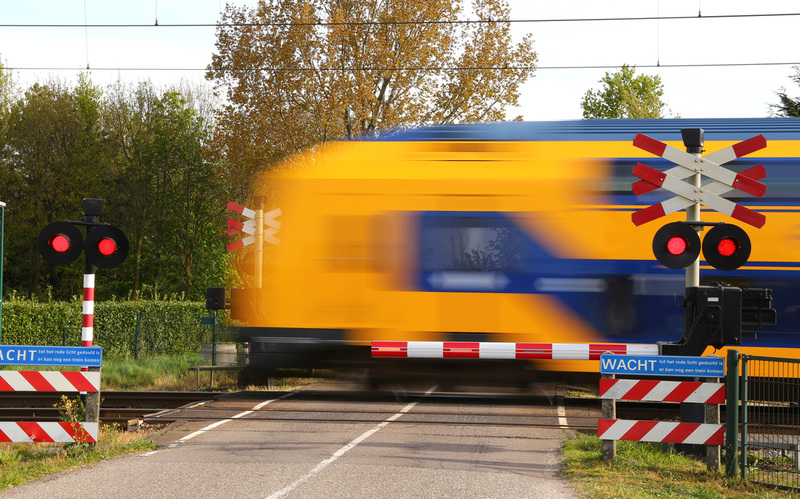 Here the train will terminate, and the loco will cut off the lead end before a waiting locomotive attaches to the opposite end of the train. 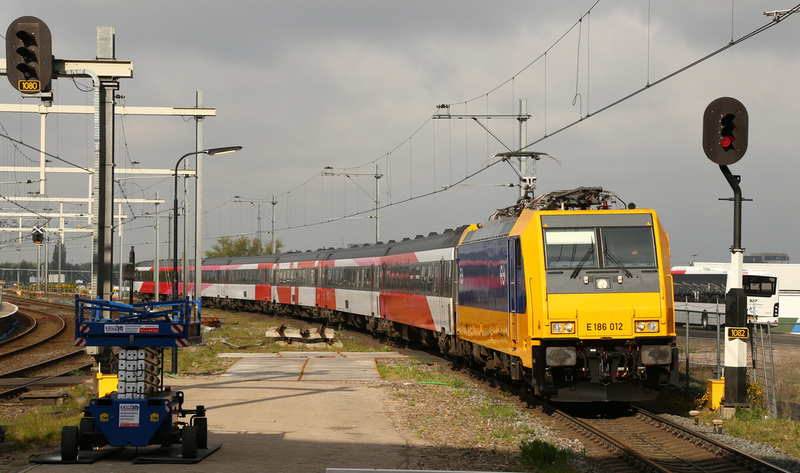 Class 186 No.186121 'Gabriel' arrives light engine to attach to its next service train to Amsterdam. 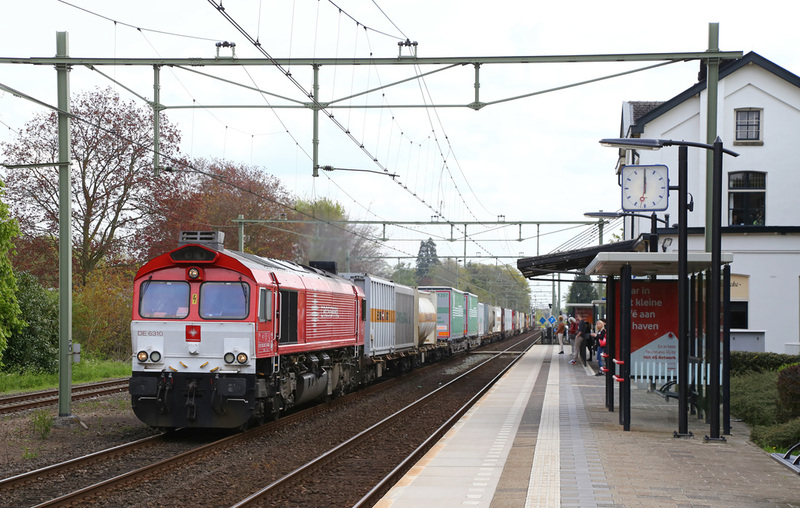 Operated by SBB International Class 189 No.189102 passes through Breda Station with a freight bound for Rotterdam Docks. 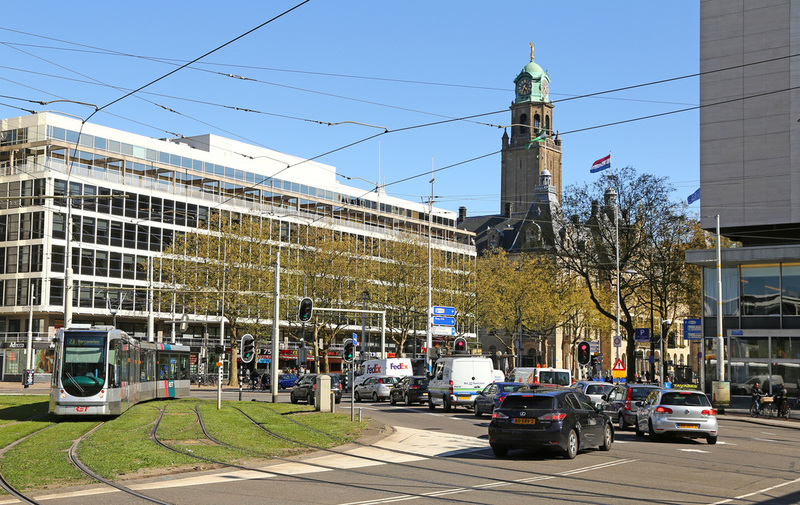 Having uncoupled from an arriving Amsterdam Train, Class 186 No.186121 speeds out of Breda Station to await the next arrival from Amsterdam. Of interest in this shot are the two ramped entry and exit roads through the middle of the station allowing cars to park on the roof! 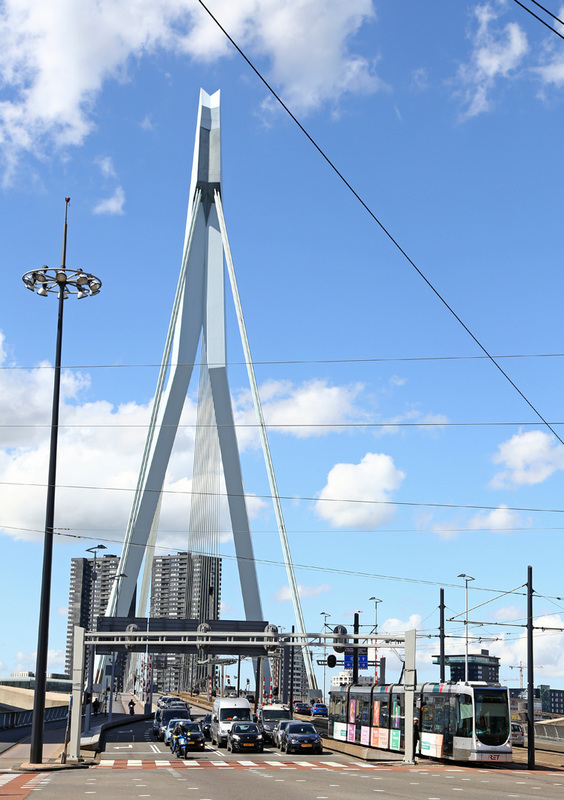 Arrival into Rotterdam Central via the new high speed lines was certainly swift. 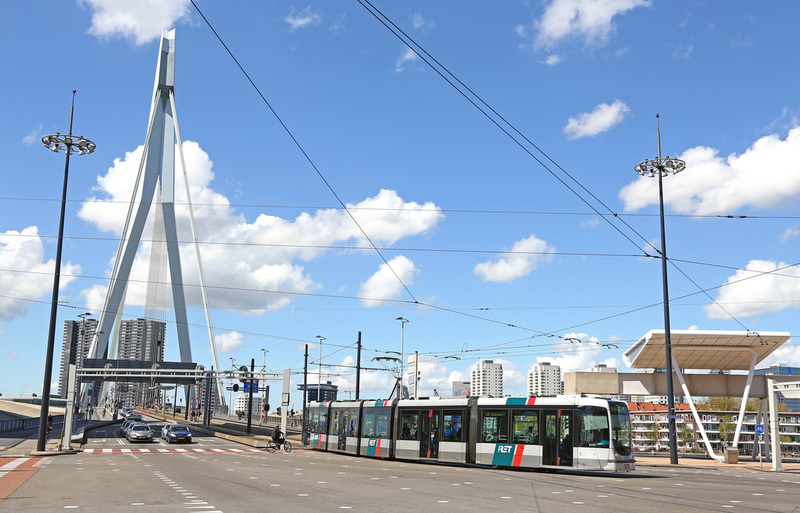 The journey from Breda to Rotterdam is now around 25-30 minutes. 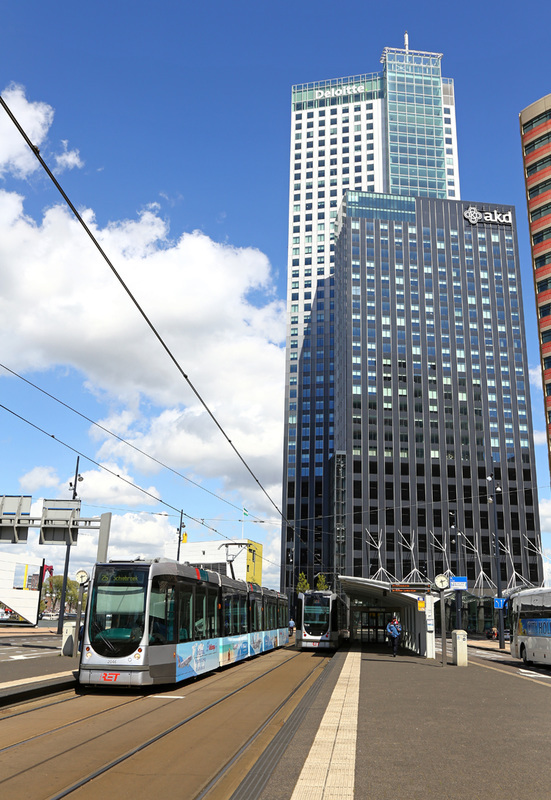 No.186121 'Gabria;' is seen at Rotterdam Central. 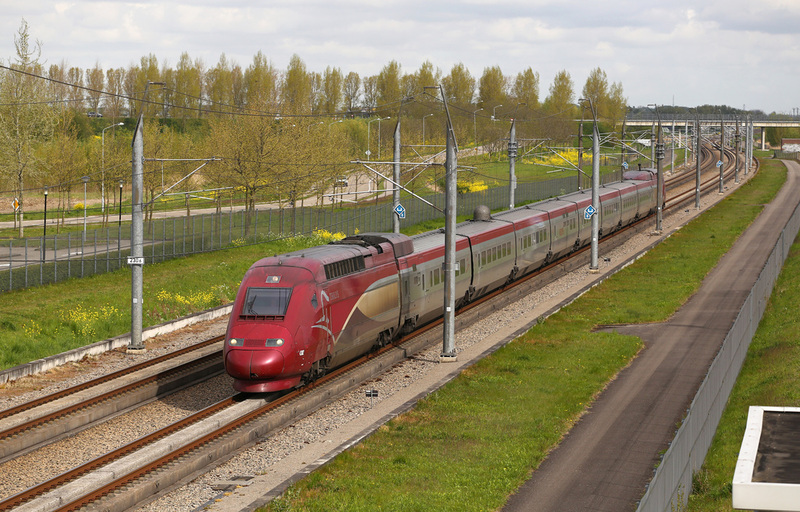 Belgian Railways do not use the high speed lines between Antwerpen and Amsterdam. 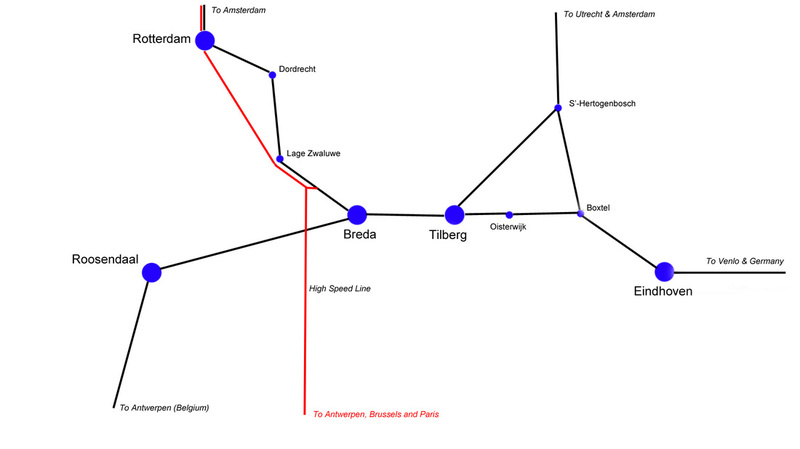 Instead these services follow the 'classic' route of the old Benelux Services via Roosendaal. 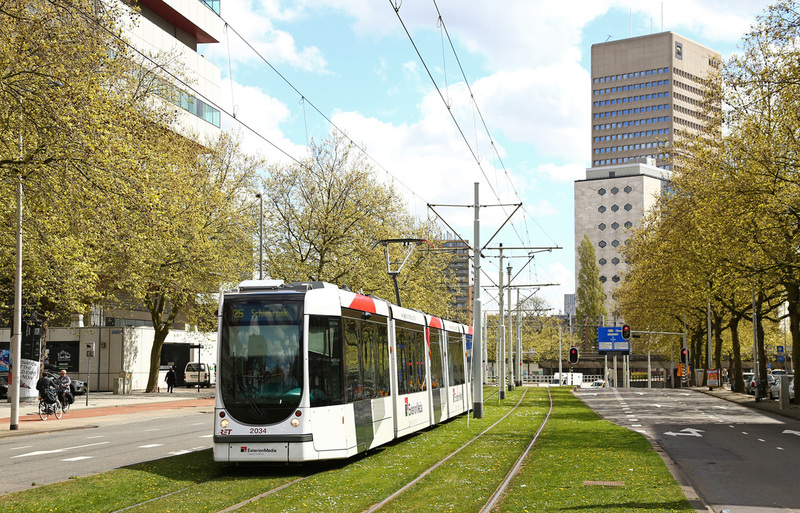 No.186213 departs Rotterdam for Amsterdam. 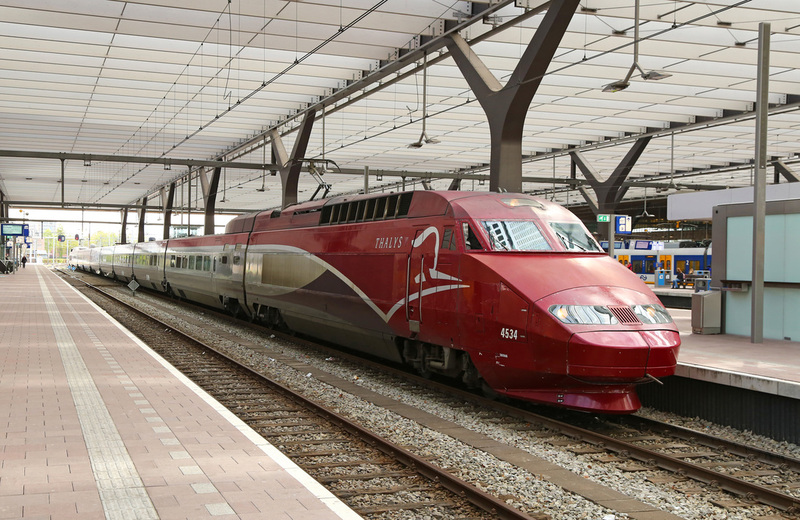 Thalys service formed of TGV No.4534 stands at Rotterdam Central with the 07:25 from Paris to Amsterdam. 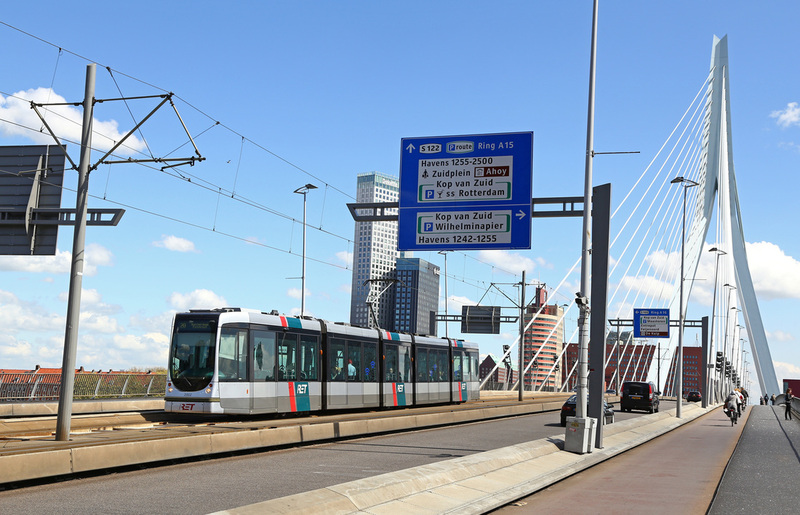 Rotterdamse Elektrische Tram (RET) is the main public transport operator in Rotterdam. 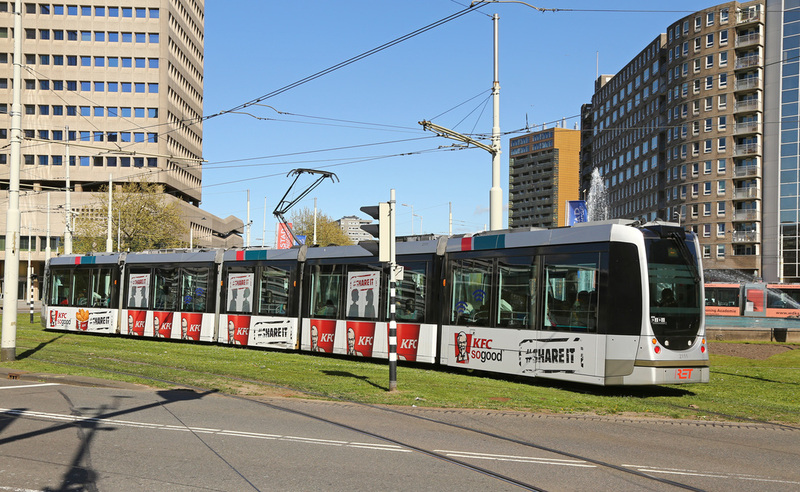 The company operates 35 bus routes and 11 tram lines. 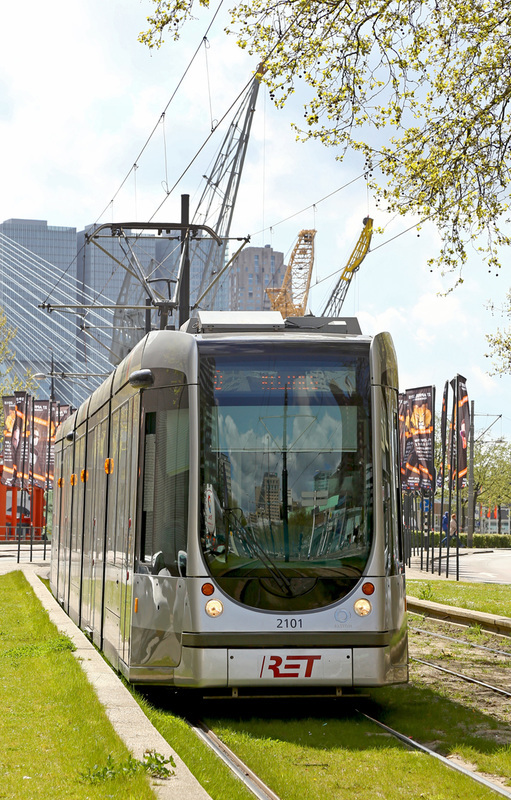 Integrated ticketing allows passengers to use the OV Chipkaart to 'touch in and touch out' travel on any Bus, Tram or Metro around the city. 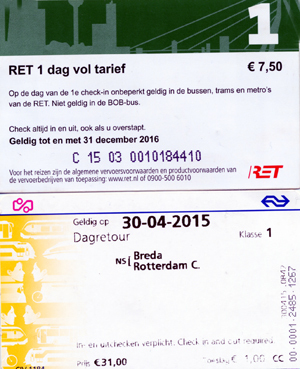 A day ticket for Rotterdam costs just 7.50 Euros (about £5). 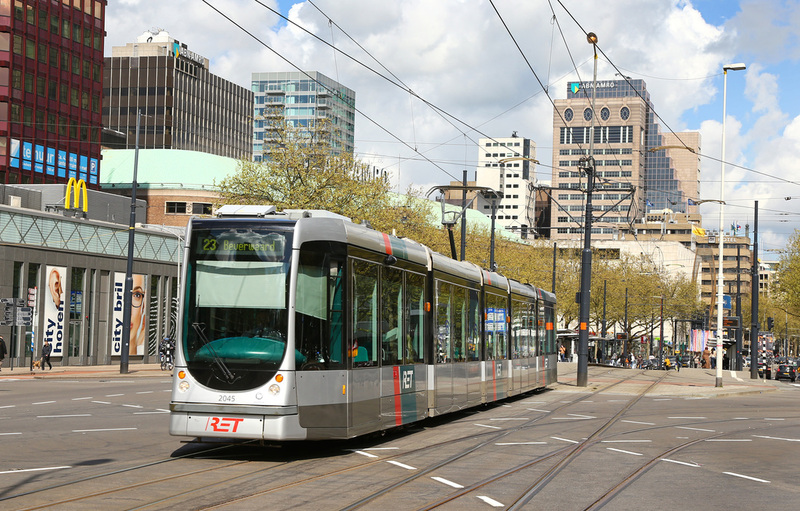 The Rotterdam Tram network covers some 75km, and uses a fleet of 113 Altsom Citidas Trams (which is the biggest Citidas Fleet in the world). However the city hasn't lost it's heritage roots. 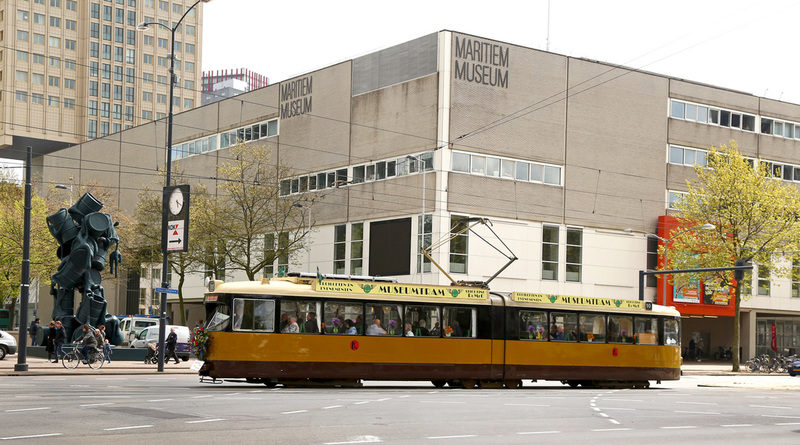 There have been trams operating in Rotterdam since 1905 and during the summer months (and special occasions) Heritage Trams can be found operating in the city on route 10. 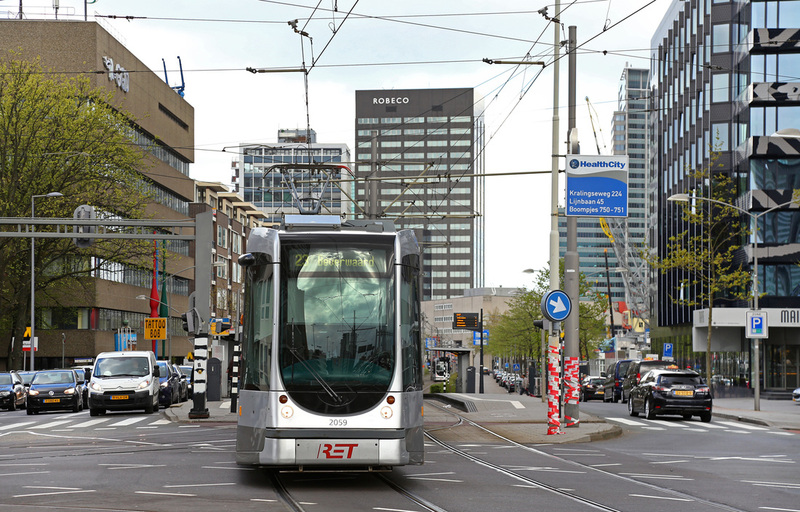 The only disadvantage with the Rotterdam Tram system is that RET do not produce a London Underground style 'map' of their network for tourists to use. A map can be obtained from the tourist information centre at Rotterdam Central Station, however it took some studying to understand the routes and lines (even for those people familiar with travelling on public transport it was somewhat confusing), so could be a little daunting if you had never been in the city before. 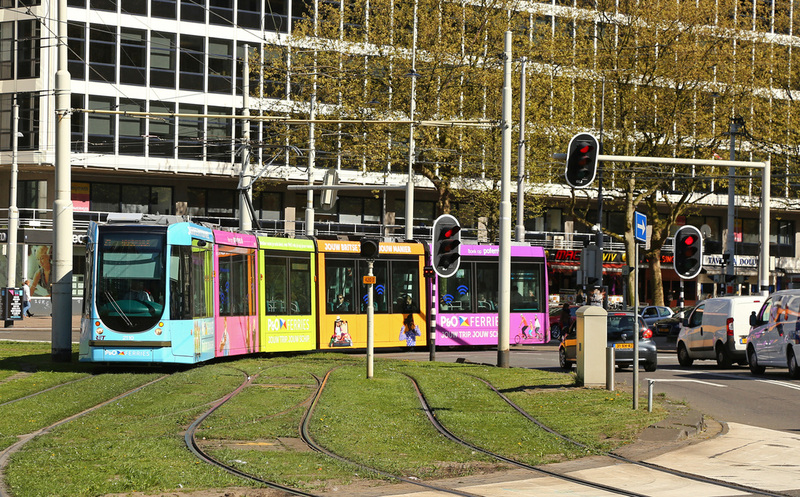 That said if you did go wrong (and we did), it's simple enough to jump off on tram and back onto another within minutes. 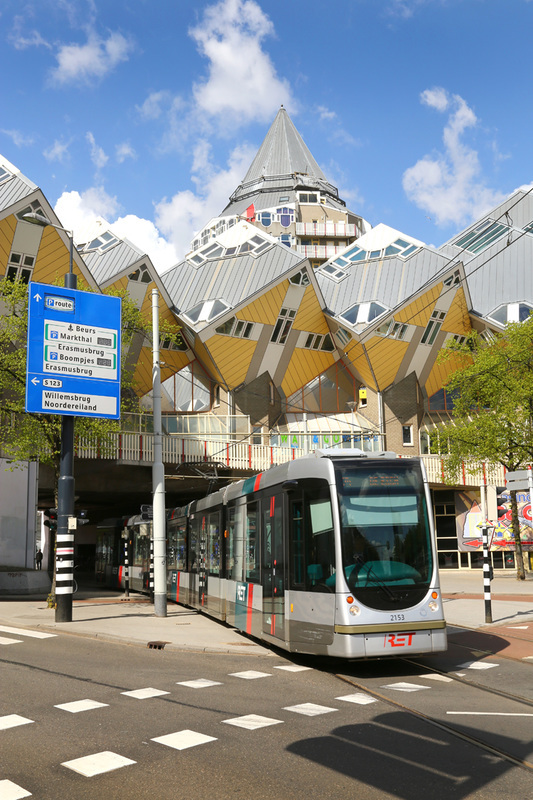 There are some great architectural sights to see in Rotterdam, and the Tram/ Metro offer the best way to travel around and enjoy the city. 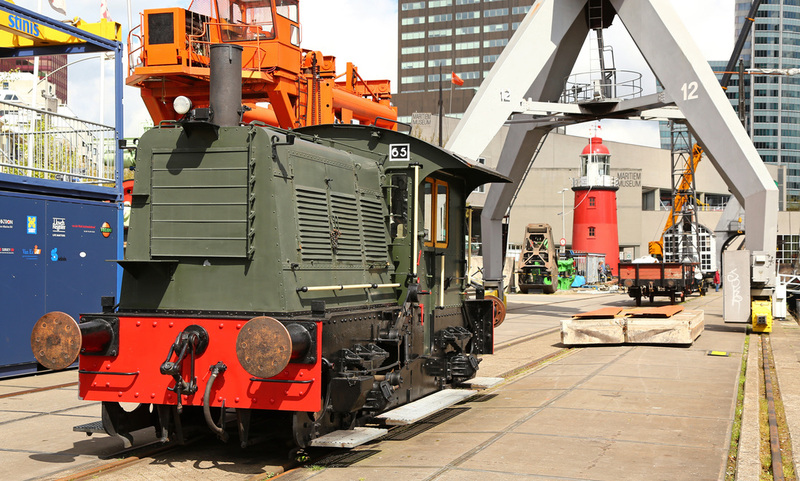 A small Dutch shunting locomotive known as a 'SIK' No.65 is seen preserved on the Rotterdam Dockside. 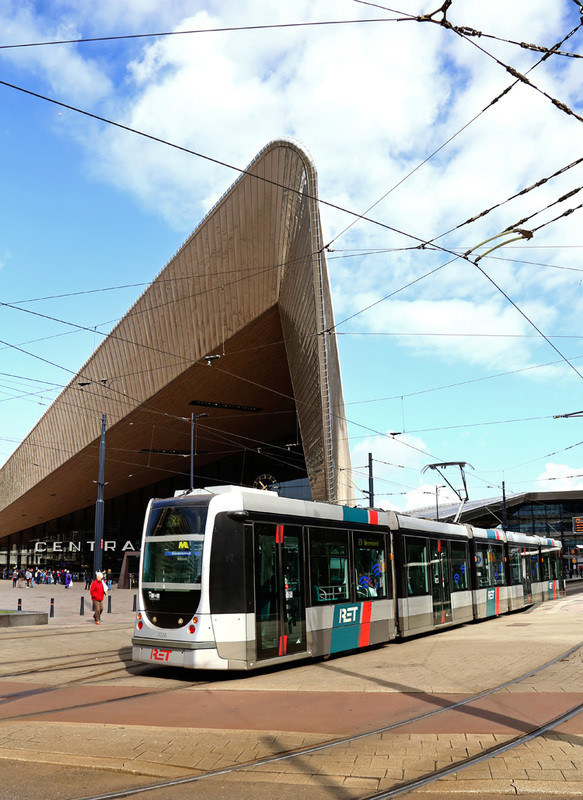 MS Plan Y Sprinter No.2974 is pictured at Rotterdam Central Station. 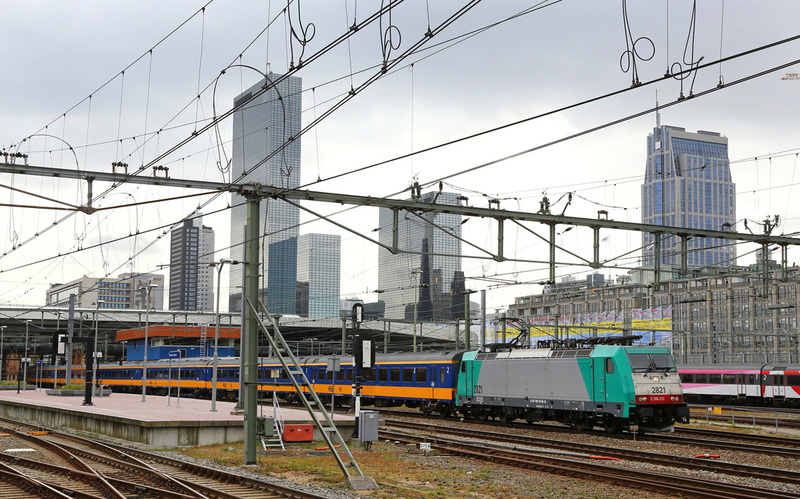 Belgian Class 186 No.186204 stands at Rotterdam Central while working the 15:52 Amsterdam to Brussels service. 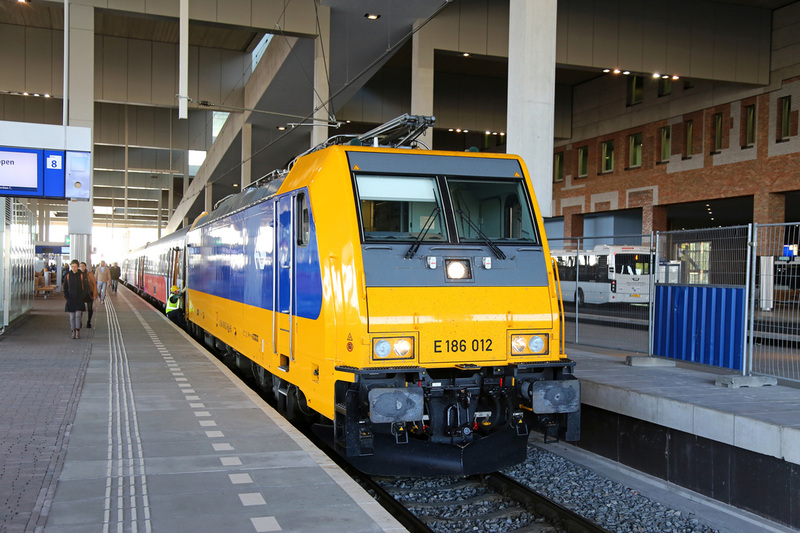 Our locomotive from the morning run to Rotterdam No.186121 is pictured at Rotterdam operating the 16:25 Amsterdam - Breda service. 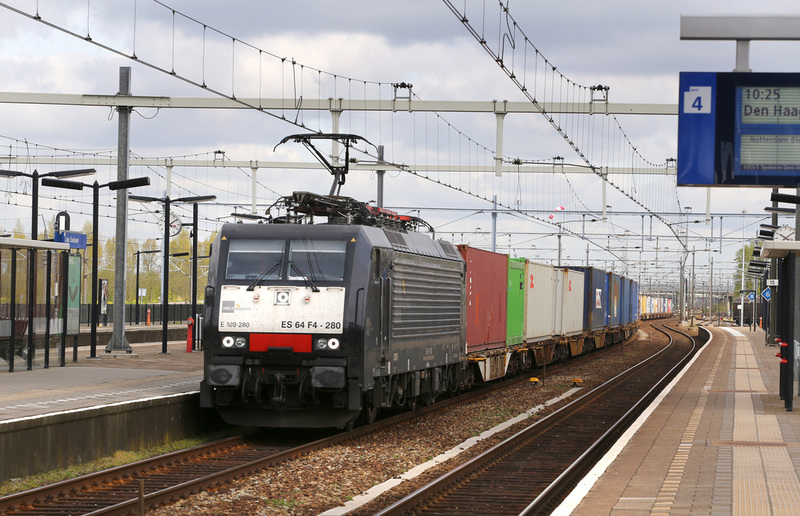 Shunter Tactile No.203102 leads a fleet of stored Class 6500's through Rotterdam Central. 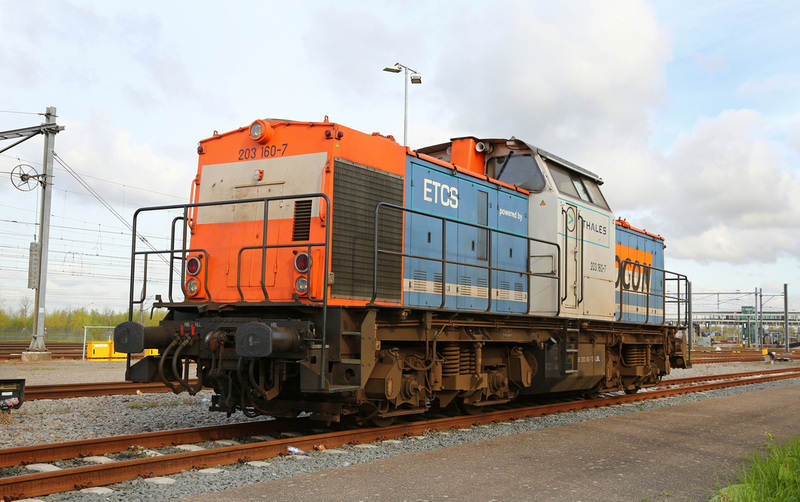 The Locomotives had been in store at Amsfoort but were being moved to Rotterdam Docks to be reinstated as shunting locomotives. The formation was as follows: No's 6488, 6490, 6492, 6442, 6453. 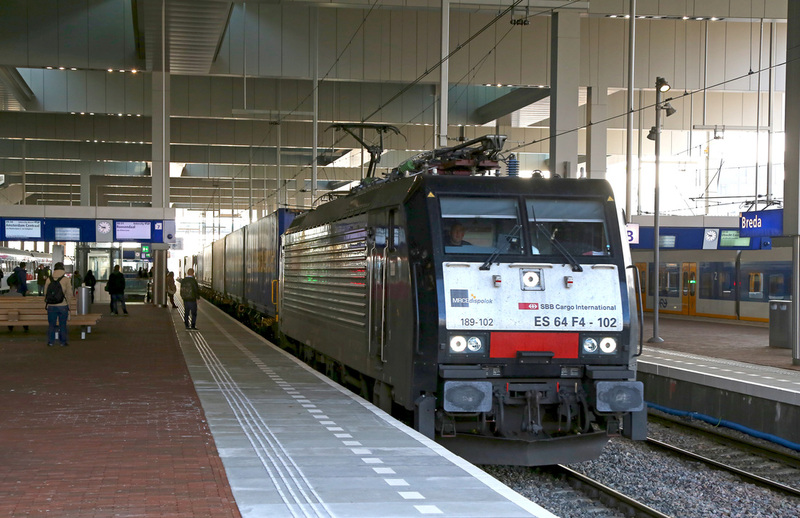 NS Class 186 No.186012 is seen at Breda having arrived with the 16:55 from Amsterdam. The loco then uncoupled from the train to await for the next arriving service. 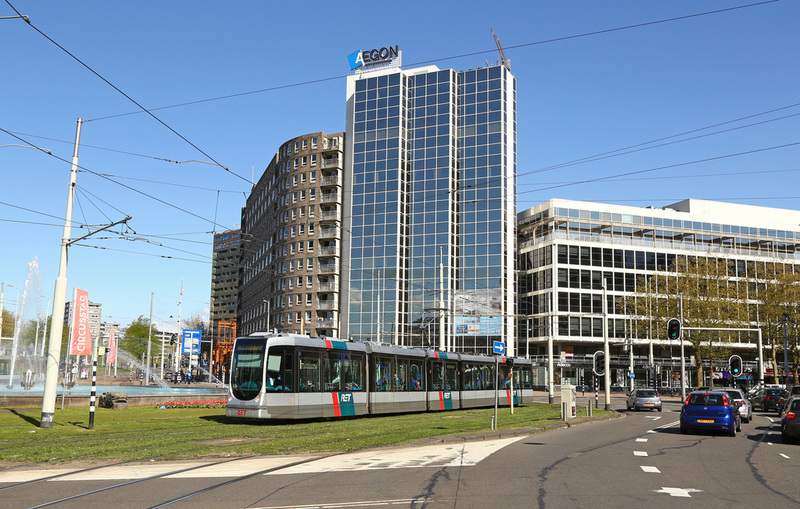 Class 186 No.186120 is seen from the Car Park on the Roof of Breda Station where glass droplights allow a unique view of the railway operating below. Day five would be our last full day in The Netherlands before returning to the UK on the Saturday. 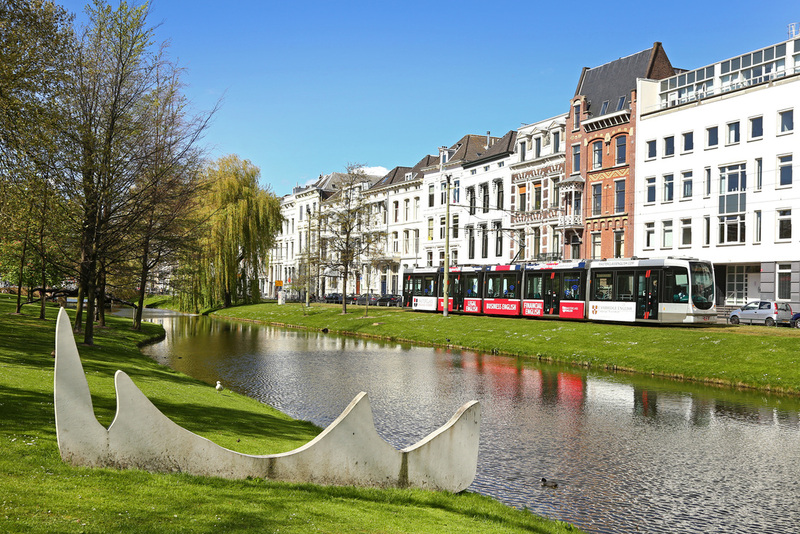 Our first port of call was to Lage Zwaluwe, located just to the north of Breda at the point where the Belgian mainline links in from Roosedaal. 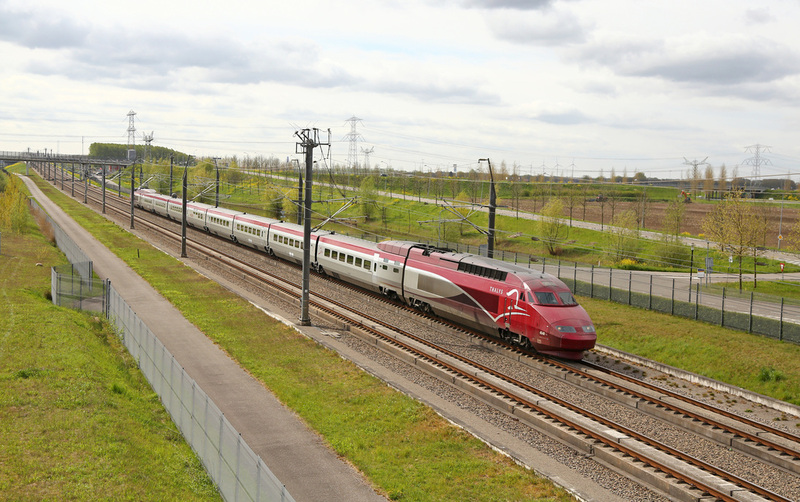 Lage Zwalwe is provides good views of the adjacent high speed line, and provides a chance to view TGV Thalys services operating at top speed. The morning period was spent at Lage Zwaluwe before we moved east to spend the afternoon in the Gilze Rijen area. 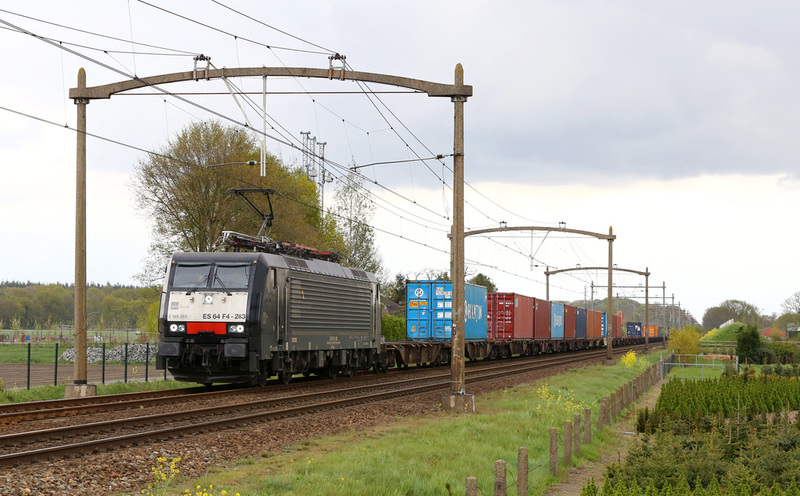 The increased freight activity and the promise of good weather also saw an International crowd of enthusiasts gather at Gilze Rijen, the impromtu gathering included Dutch, Belgian and English spending the afternoon enjoying the additional increase in traffic on the Tilberg mainline. 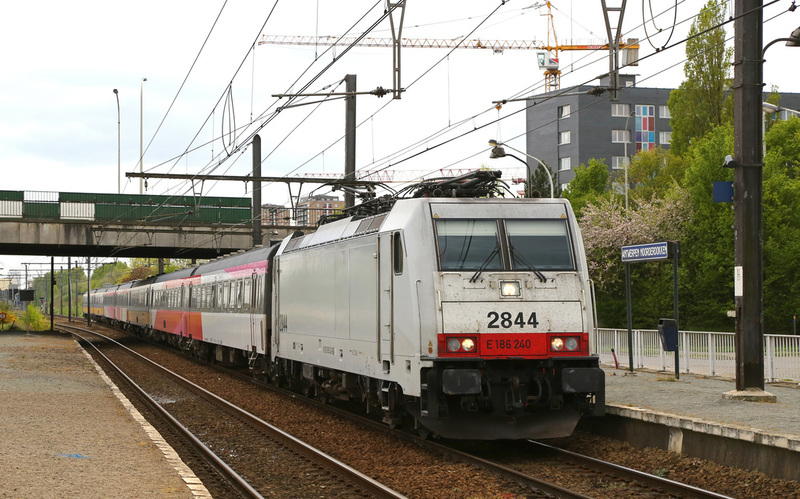 TGV No.4346 speeds through Lage Zwaluwe with the 06:22 Paris Nord to Amsterdam service. 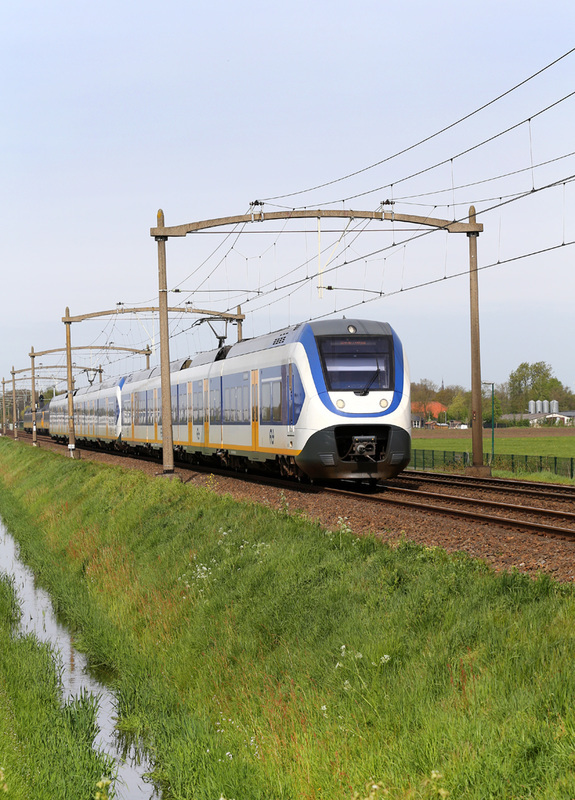 NS Class 186 No.186115 passes Lage Zwaluwe using the high speed line while operating the 07:55 Amsterdam to Breda service. 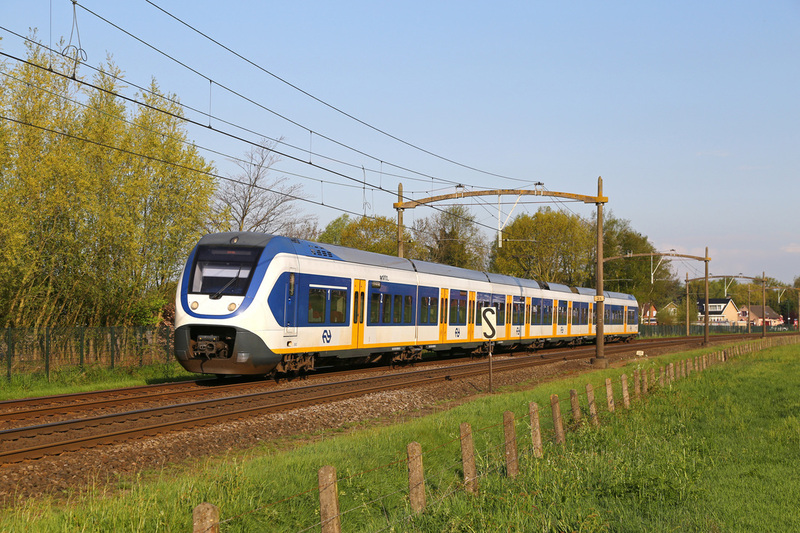 NS Class 186 No.186122 speeds through Lage Zwaluwe with the 08:56 Breda - Amsterdam service. 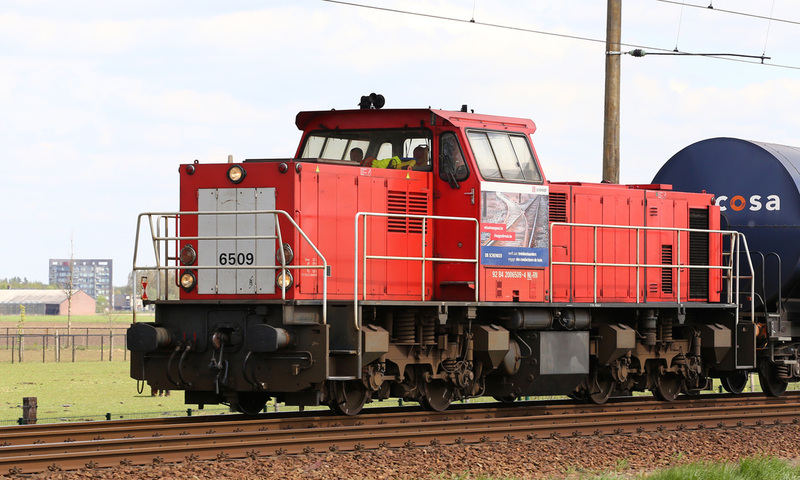 Ex German No.203160 is pictured stabled at Lage Zwaluwe and is operated by Locon. 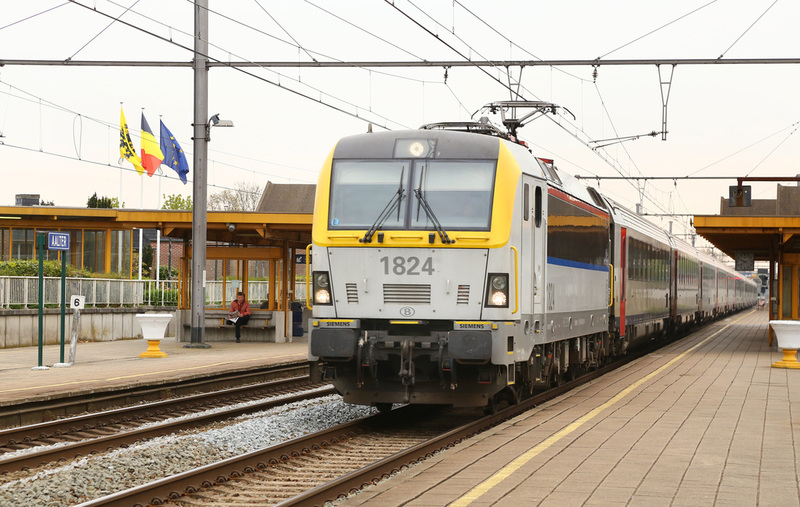 Belgian Class 186 No.186240 passes through Lage Zwaluwe on the classic line from Roosendall operating the 07:25 Brussels to Amsterdam. 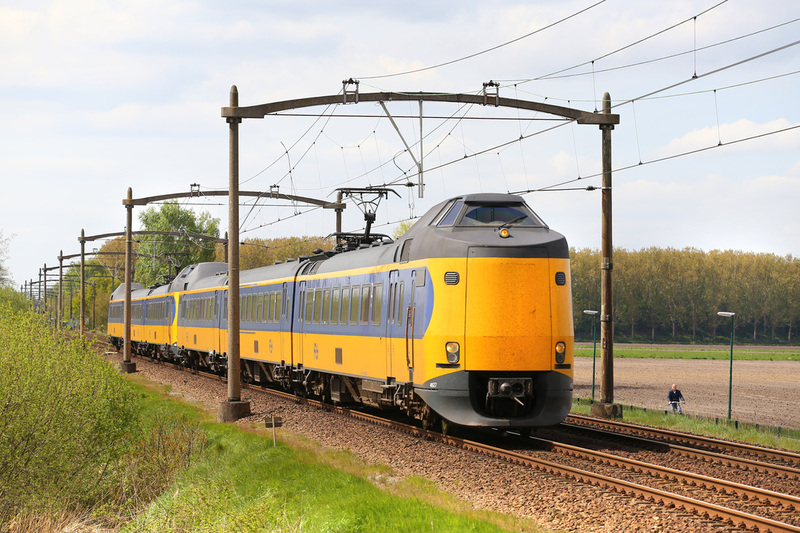 NS Class 186 No.186121 speeds through Lage Zwaluwe hauling the 08:56 Breda to Amsterdam. 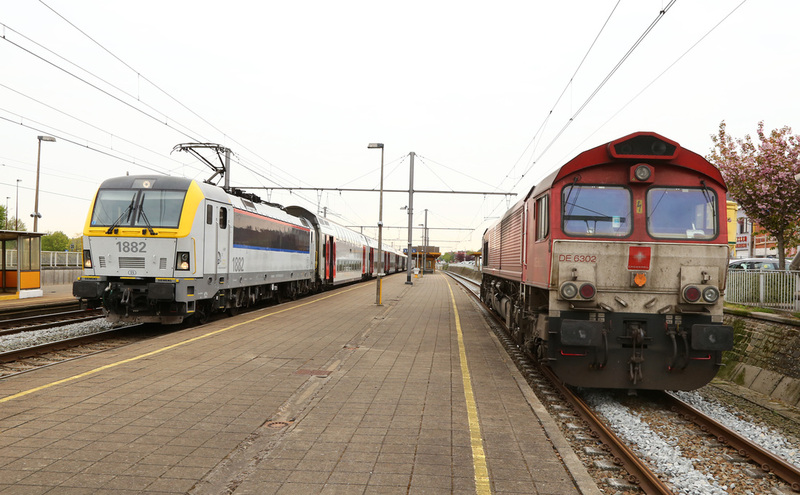 NS Class 186 No.186009 passes Lage Zwaluwe with the 08:25 Amsterdam to Breda express service. 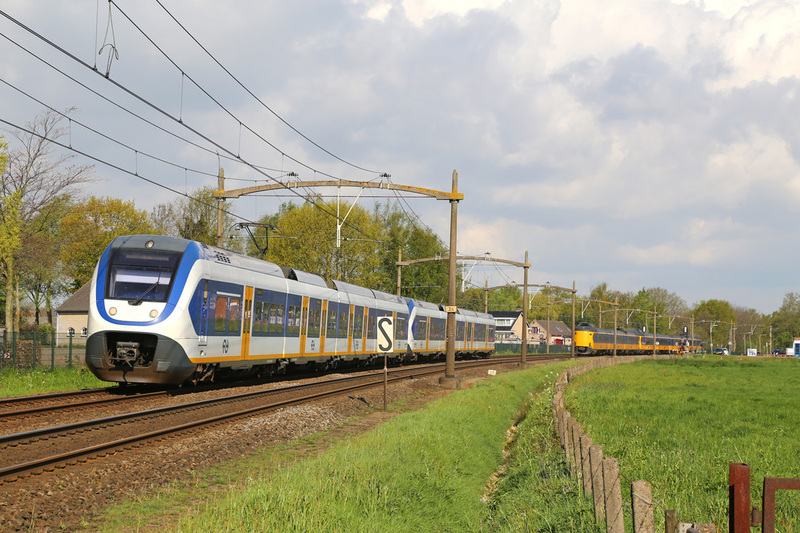 NS Class 1800 No.1835 passes through Lage Zwaluwe light engine towards Breda. 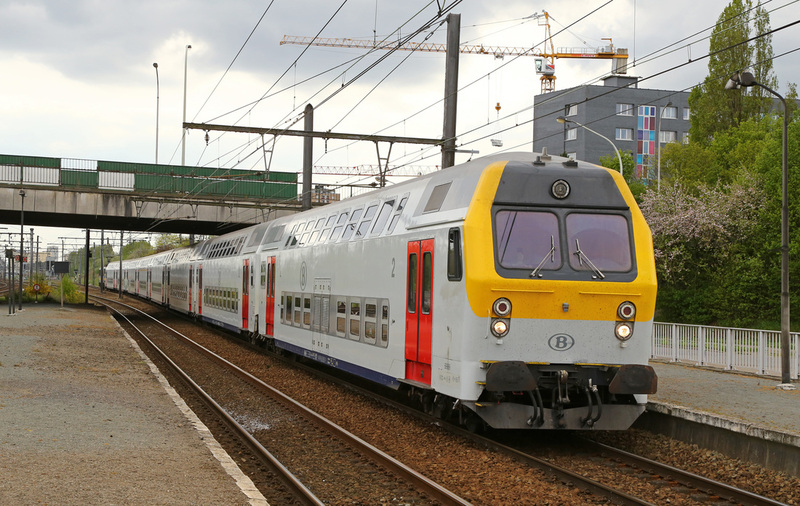 NS S100 Sprinter No.1611 calls at Lage Zwaluwe on route to Breda from Rotterdam. 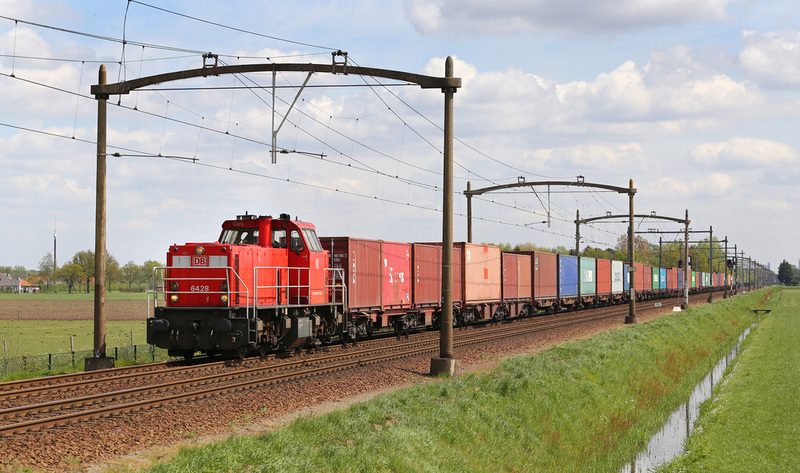 Class 189 No.189280 speeds through Lage Zwaluwe with a container train from Rotterdam Docks. 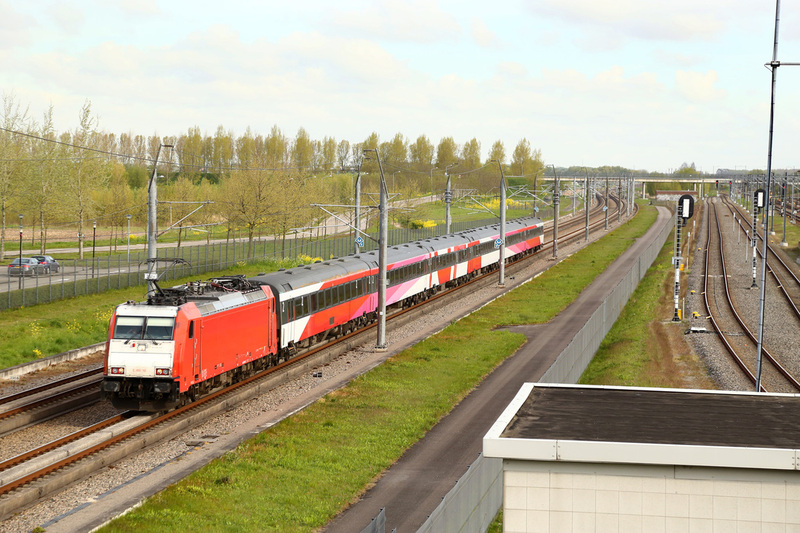 TGV No.4302 passes full speed through Lage Zwaluwe with the 09;17 Amsterdam to Parid Nord. 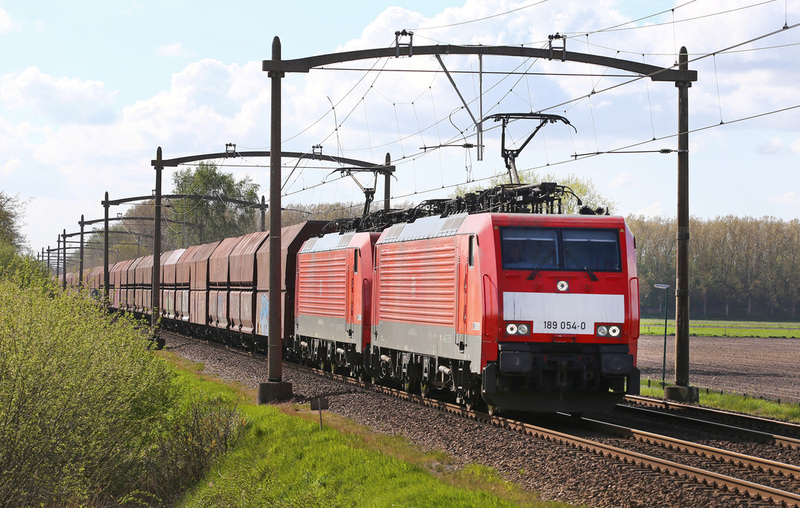 Brand New Class 186 No.186422 operating for Rurtalbahn passes through Lage Zwaluwe wth a container train from Rotterdam. 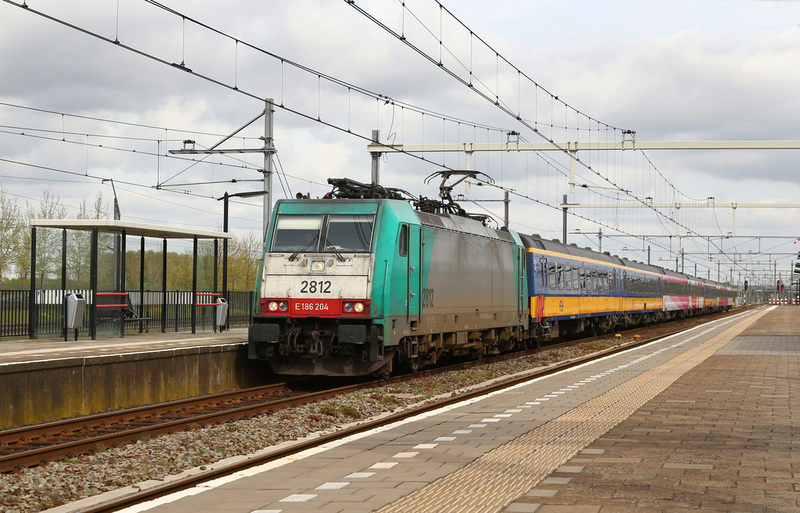 NS Class 186 No.186119 passes Lage Zwaluwe with the 09:25 Amstedam to Breda high speed service. 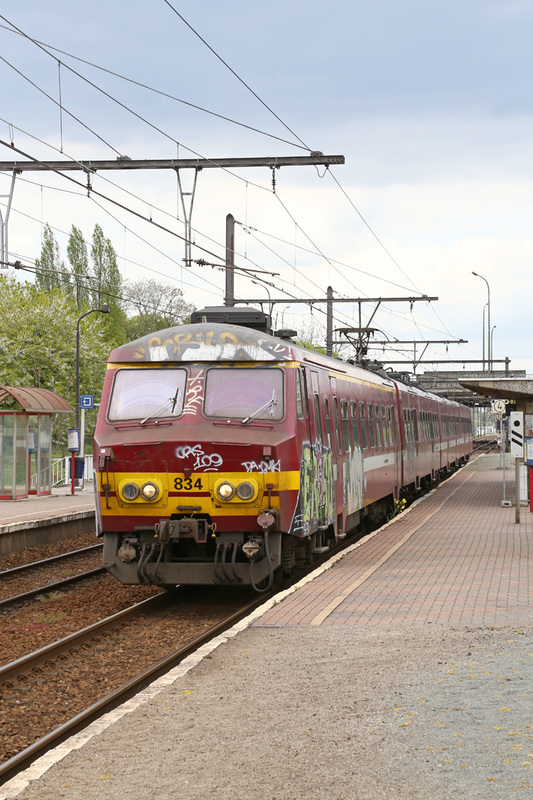 Belgian Class 186 No.186204 passes slowly through Lage Zwaluwe with the 08:52 Amsterdam to Brussels. 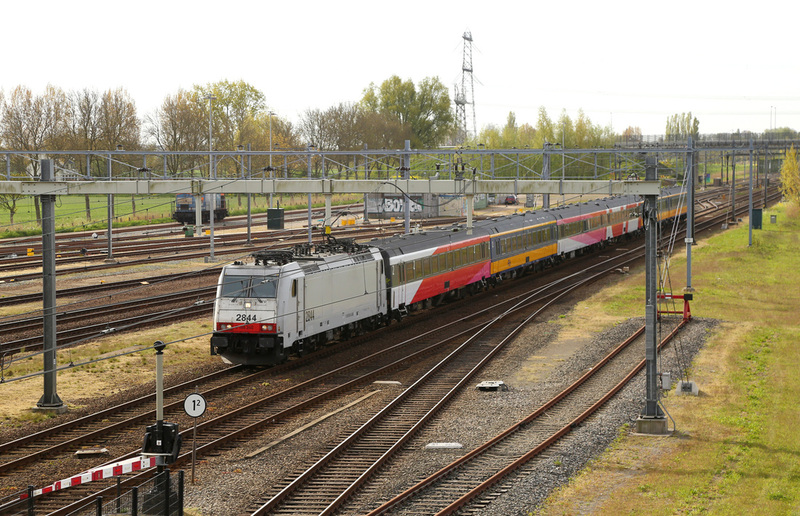 TGV No.4540 storms through Lage Zwaluwe on the high speed line, operating the 07:25 Paris Nord to Amsterdam. 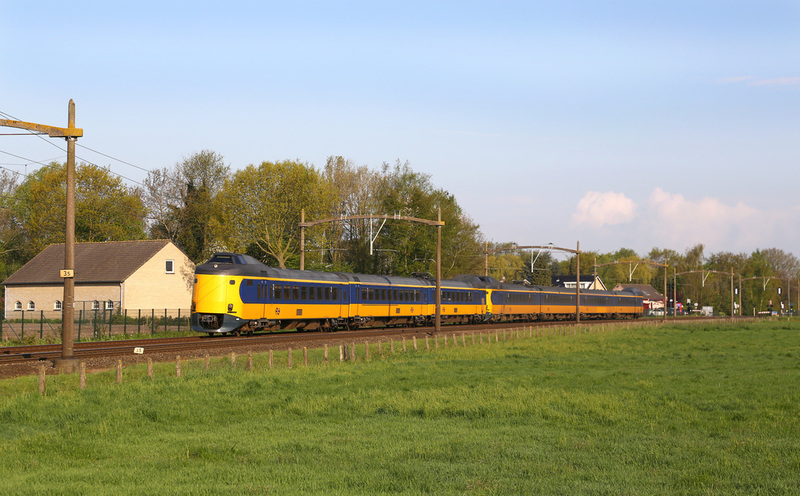 NS Koloper Units No.4248 and No.4092 speed through Dorst on route to Den Haag. 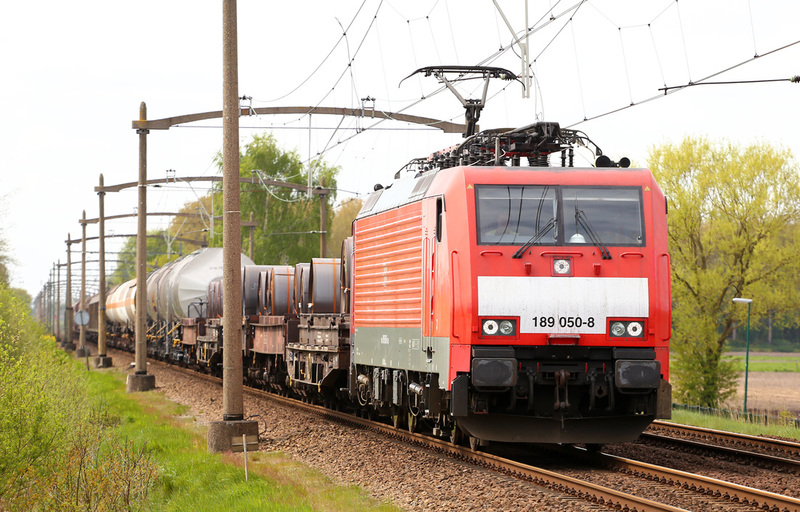 DB Class 189 No.189079 passes Dorst with a nixed freight heading for Rotterdam. 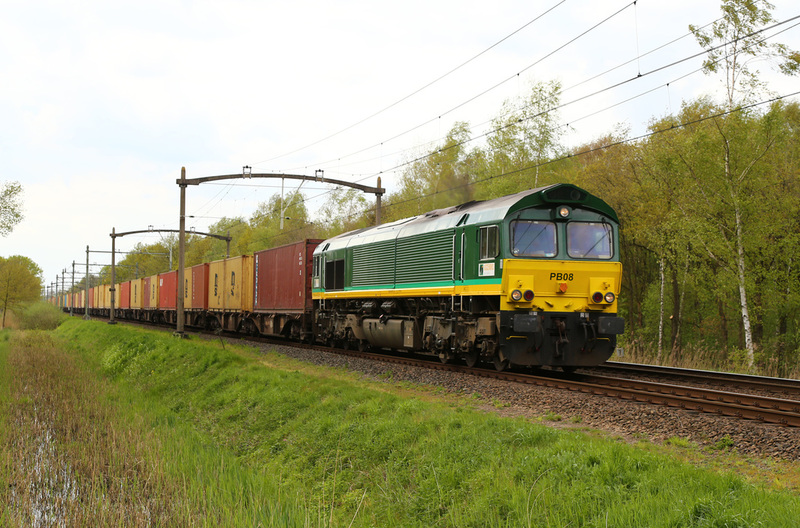 DB Class 6500 No.6428 passes through Gilze Rijen on route towards Rotterdam with a container train. 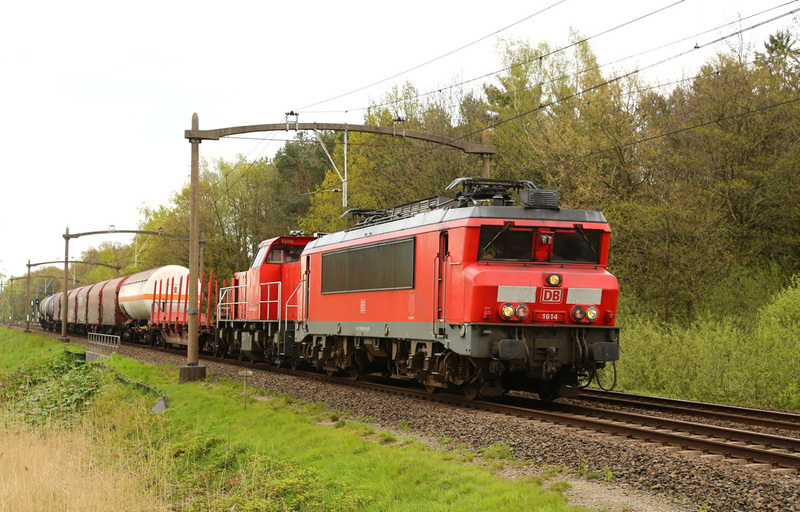 DB Class 6500 No.6509 passes Gilze Rijen at the head of a mixed chemicals train. 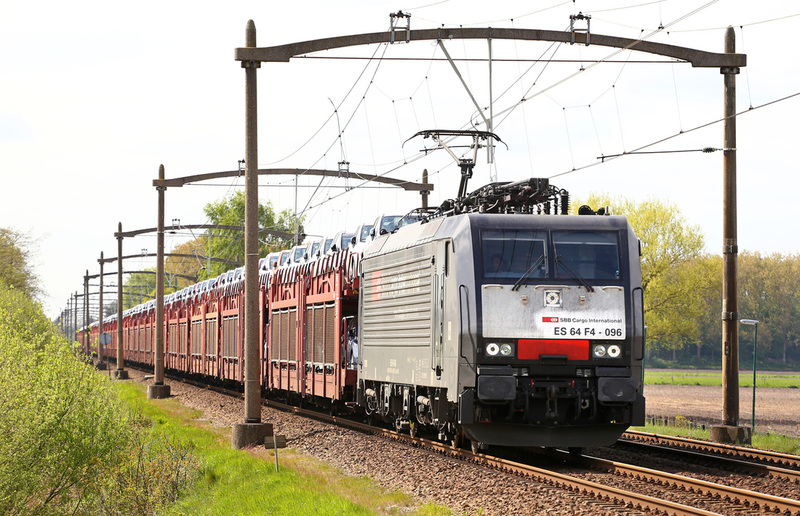 NS DDZ No.7536 passes Gilze Rijen heading towards Breda. 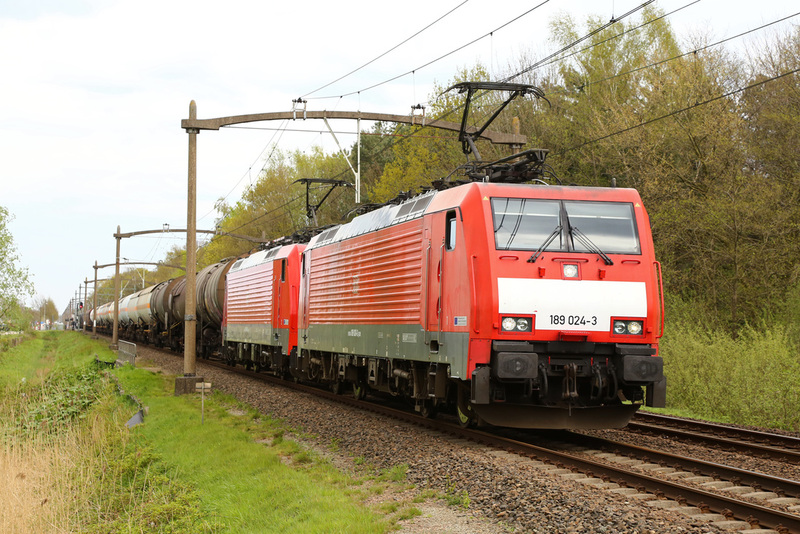 DB Class 189 No.189050 passes Gilze Rijen with a mixed freight train heading towards Venlo. 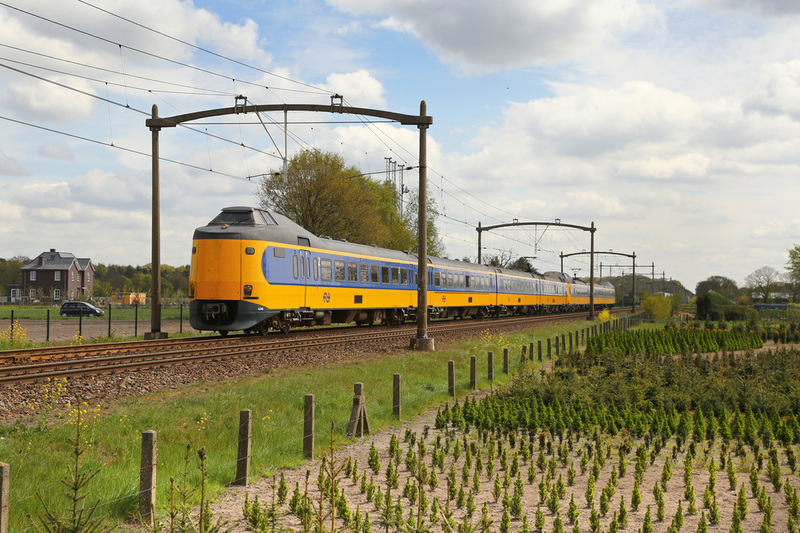 NS Koloper Units No.4027 and No.4028 pass Gilze Rijen on route to Venlo. 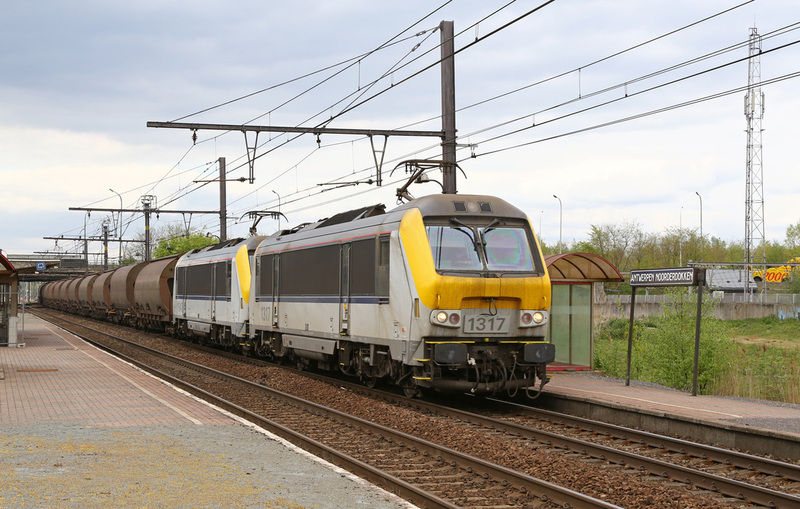 A Grubby Belgian Class 186 No.186210 passes Gilze Rijen light engine. 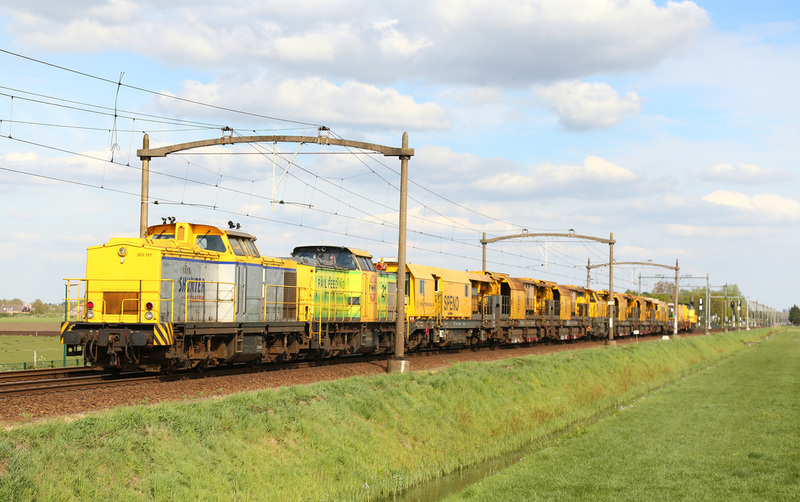 Double Headed Class 189's No.189083 and No.189080 power a loaded coal train through Gilze Rijen heading for Venlo. 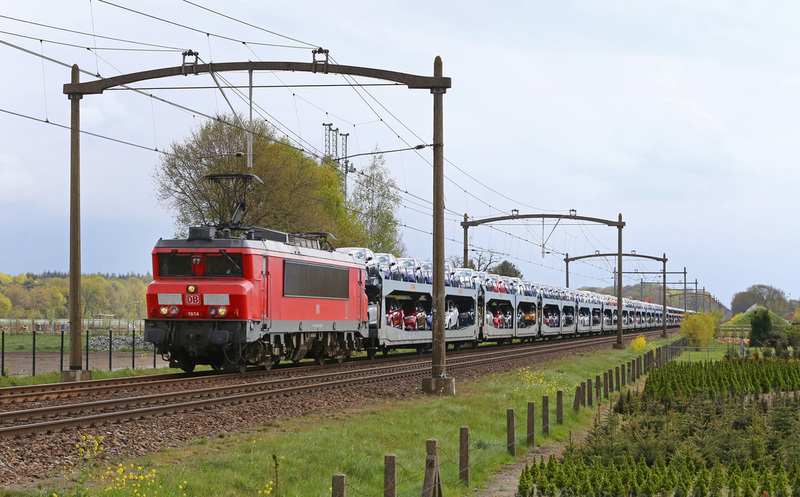 SBB International Class 189 No.189996 passes Gilze Rijen with a loaded train of Fiats and Suzuki cars heading for Switzerland. 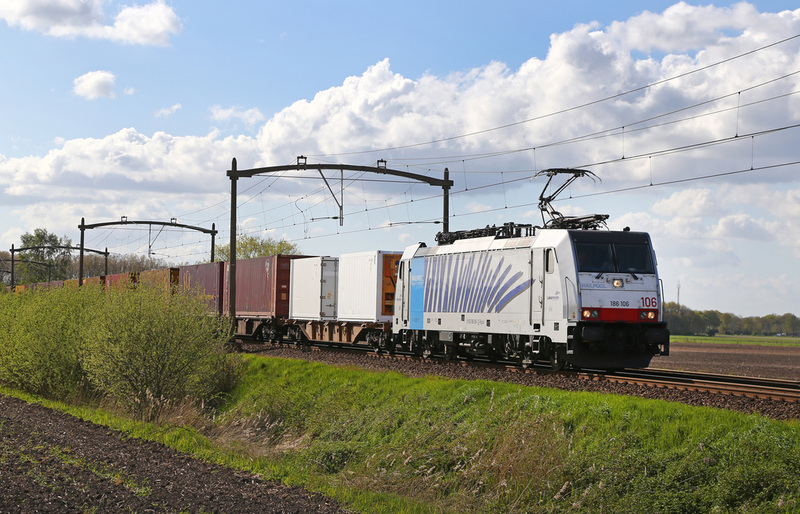 In a joint operation between ERS and Freightliner Class 186 No.186213 passes Gilze Rijen with a container train heading to Poznan (Poland) from Rotterdam. 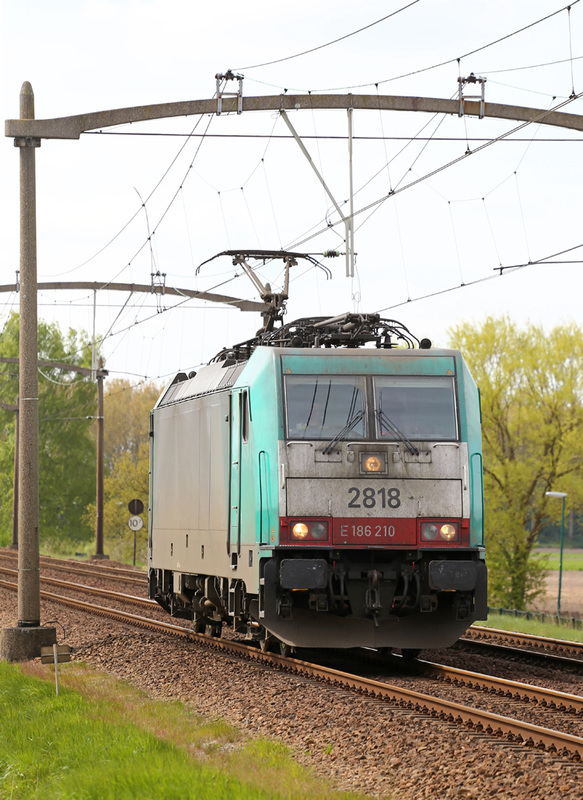 Class 189 No.189289 passes Gilze Rijen with an Intermodal from Berlonge to Rotterdam. 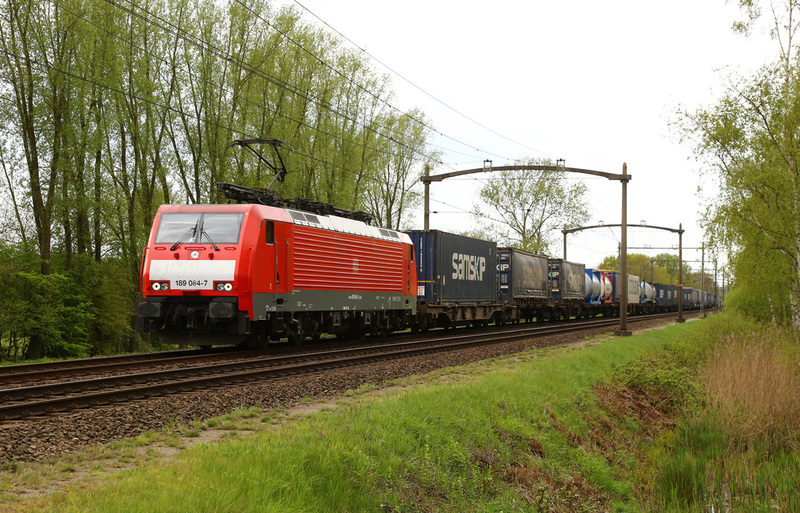 Austrian Class 189 No.189289 passes Gilze Rijen with a mixed intermodal heading for the port of Rotterdam. 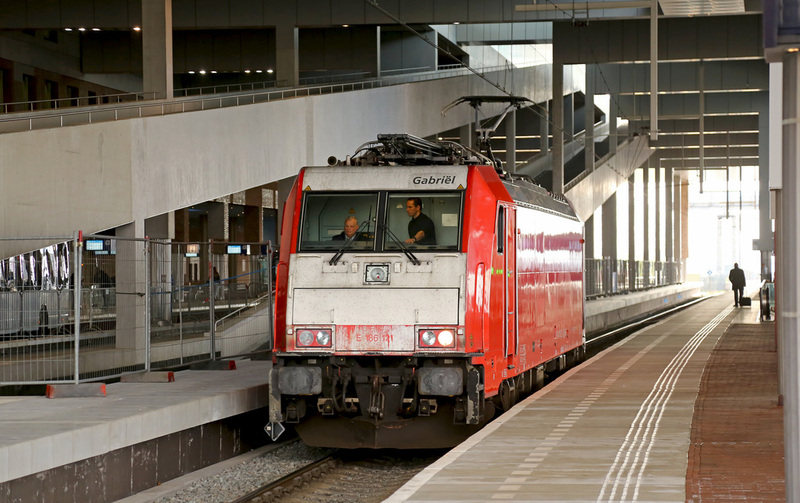 Class 186 No.186422 operated by Rurtalbahn. 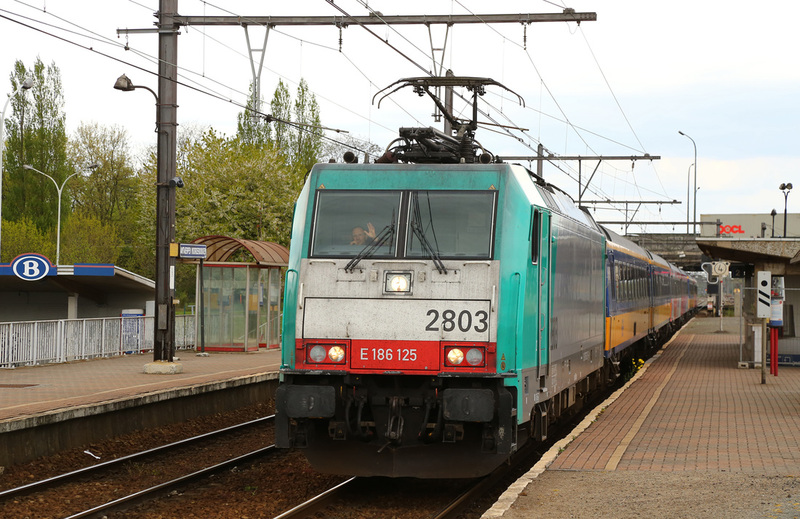 Class 189 No.189289 operated by Metrans. DB Class 1600 No.1604 leads Class 6500 No.6411 through Gilze Rijen, the diesel locomotive is tucked inside to operate the last leg of the trip, which isn't electrified. 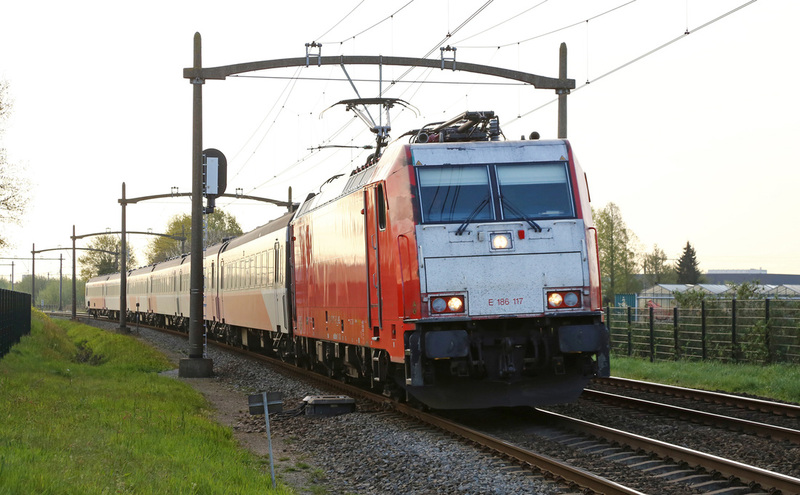 Class 189 No.189025 passes through Gilze Rijen on a trainload of cargon wagons. 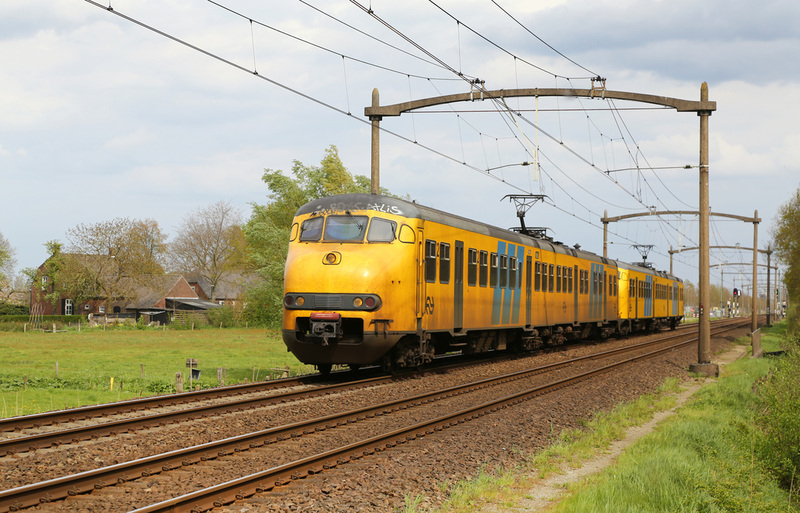 NS Class S70's No.2453 No.2438 pass Gilze Rijen on route towards Breda. 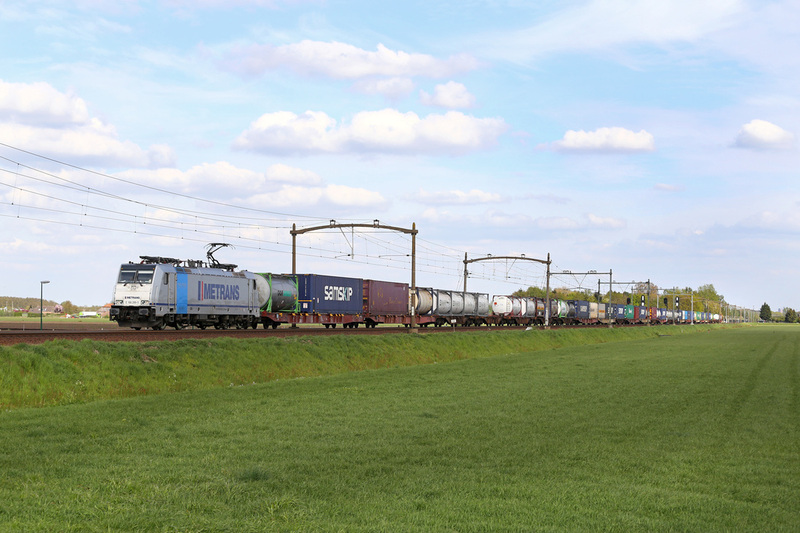 Rotterdam Rail Feeding Class 203 No.18 passes Gilze Rijen with the NS Railgrinder in tow. 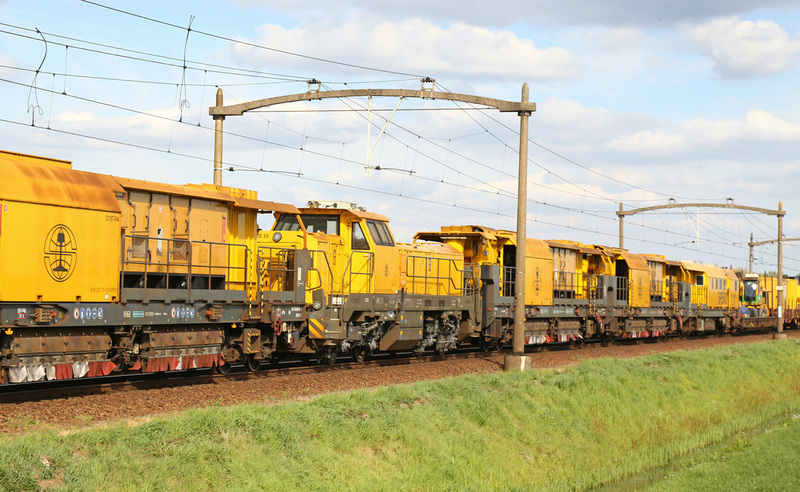 Shunter Tactile No.203101 and Rotterdam Rail Feeding No.21 (92 84 2203 021-5) bring up the rear of the rail grinder at Gilze Rijen. 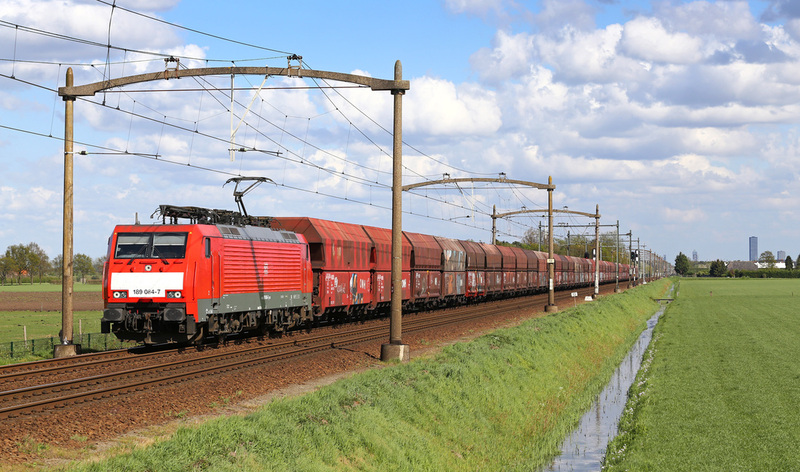 DB Class 189 No.189075 powers an empty coal train towards Rotterdam docks at Gilze Rijen. 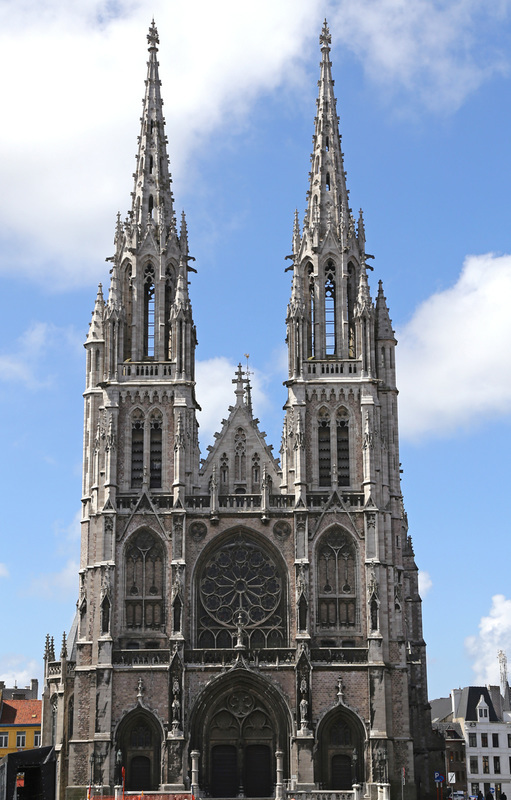 Day 6 was the final day of our trip, we departed from Breda after breakfast, a headed back into Belgium towards the Eurotunnel Terminal at Calais. 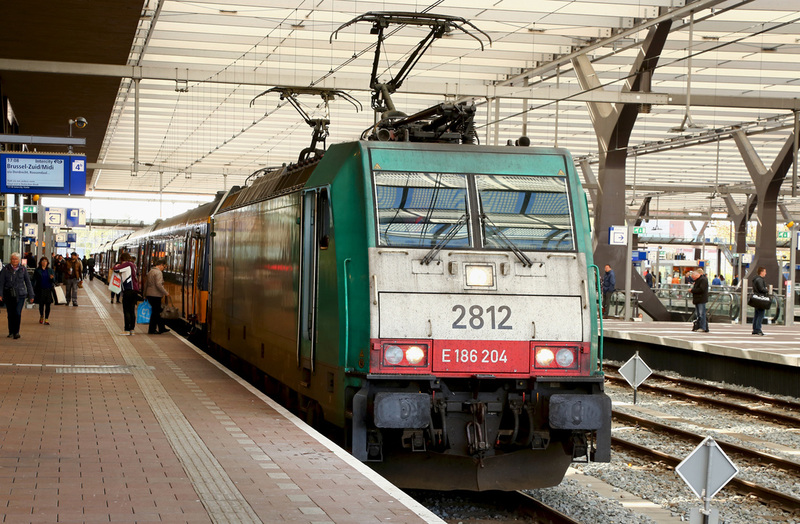 On route between Breda and Calais we called in at Aalter Station in Belgium for an hour. 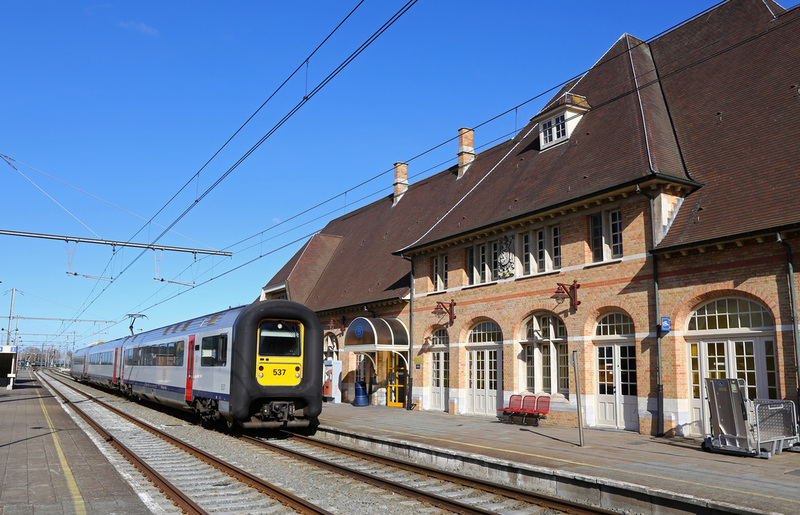 The station is located on the busy mainline near Brugge. 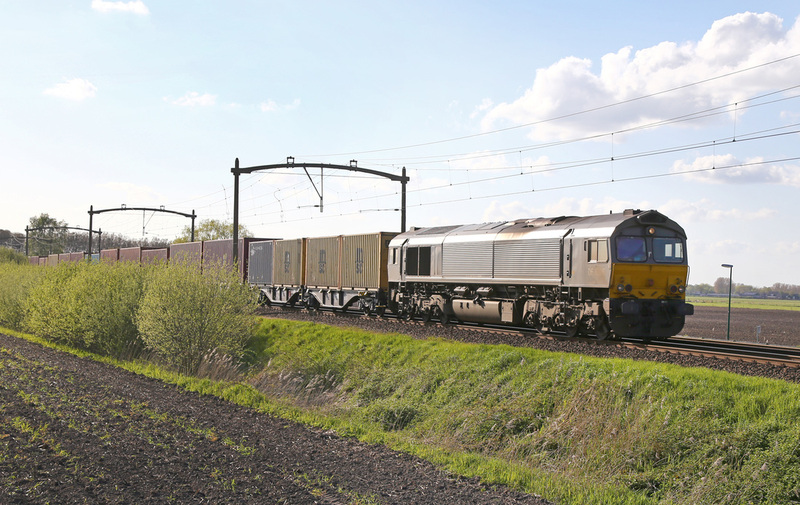 We were lucky enough to find Crossrail Class 66 No. 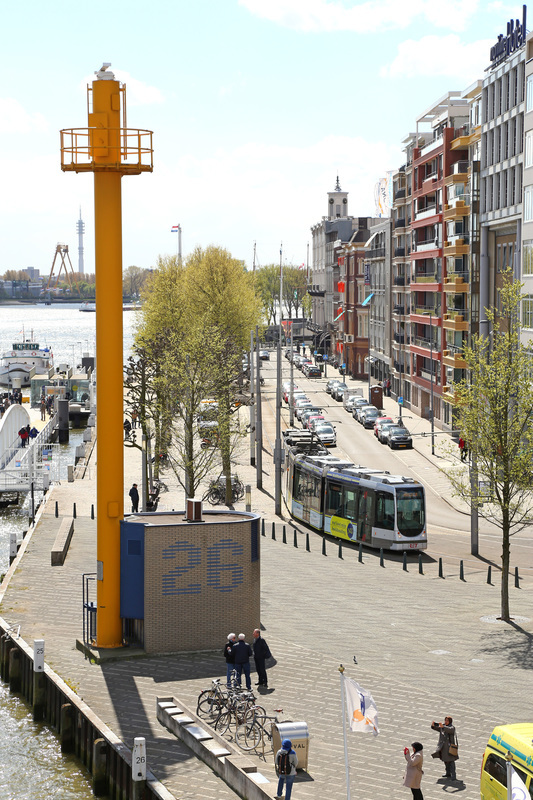 DE-6302 located in the station loop. 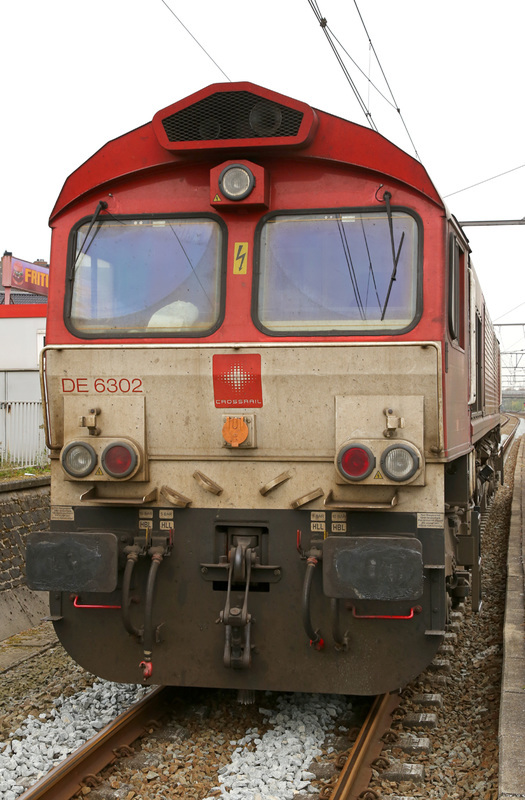 DE-6302 was in serious problems early on the Saturday morning while in charge of a auto-carrier train. It reportedly threw a piston, which resulted in the oil being vented through the exhaust. The loco was later towed to Rampskoff Depot where it underwent repairs. The locomotive radiator room also contained 10 containers of oil suggesting the loco had been drinking large quantities of oil for some time. 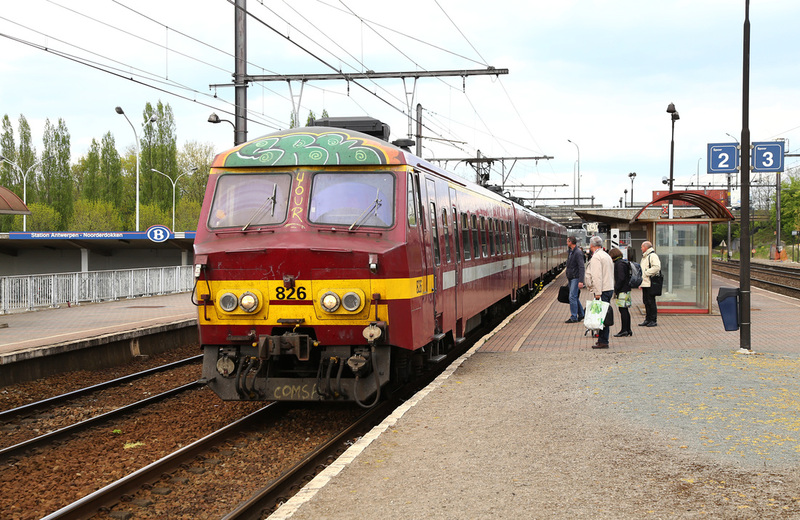 Class 18 No.1824 departs from Aalter on route to Oostende. 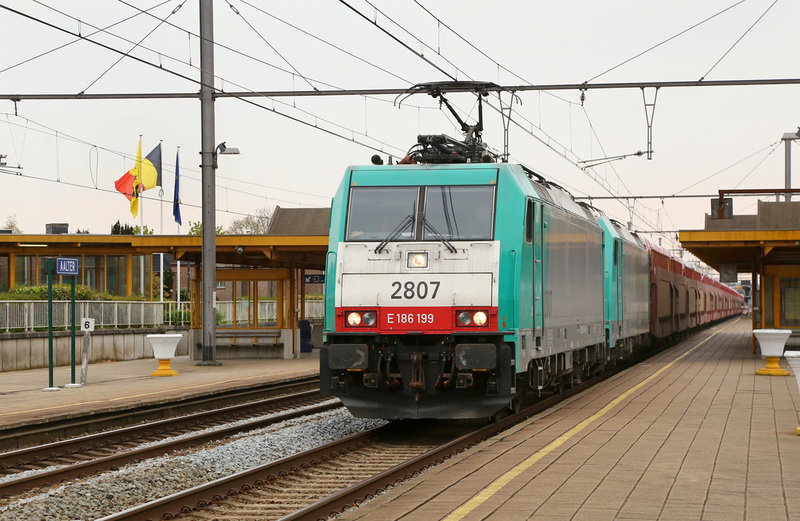 Belgian Railways Class 18 No.1873 speeds through Aalter on route from Oostende, passing AM08 No.08058 on a stopping service to Brugge. 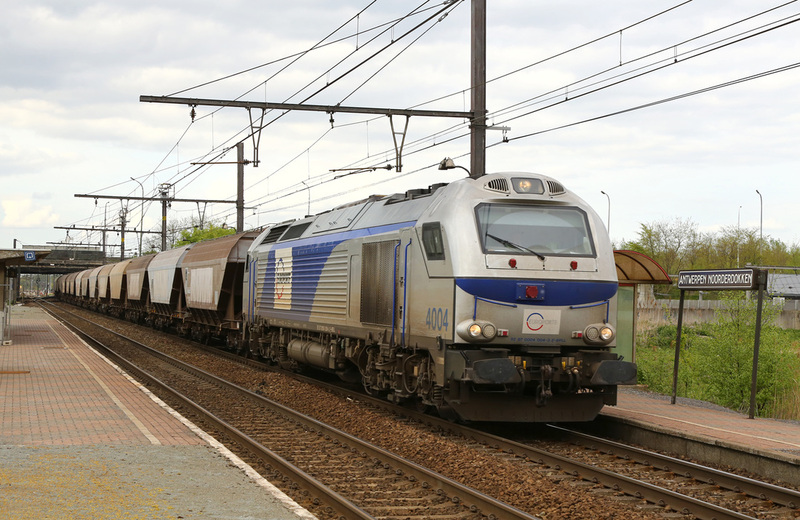 Belgian Class 186's No.186199 and No.186228 pass through Aalter with a loaded car train heading for the port of Zeebrugge.